Today is our final day in Chiang Mai. Our flight leaves Chiang Mai at 5pm and since we have a few hours to kill, we headed for Warorot Market after breakfast. Warorot Market is located around 7 mins walk from the hotel we were staying along the night bazaar street. Warorot Market comprises of 2 buildings on either side of the main road, selling similar goods. The market seems like a place where locals visit to get their daily needs. The stalls in the 3-storey Warorot Market are arranged in a rather systematic manner. 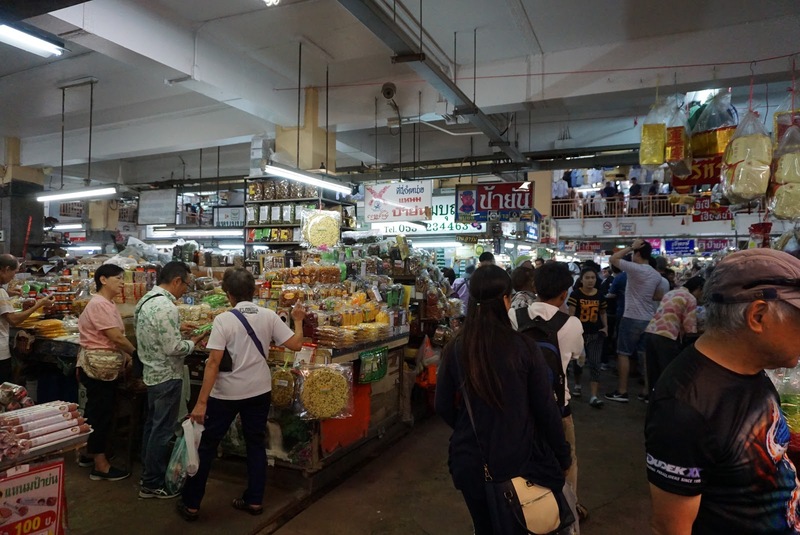 Most of the stalls on the ground floor sell food items as well as a section where one can find eateries. At the centre of the ground floor is where fresh food items are being sold. 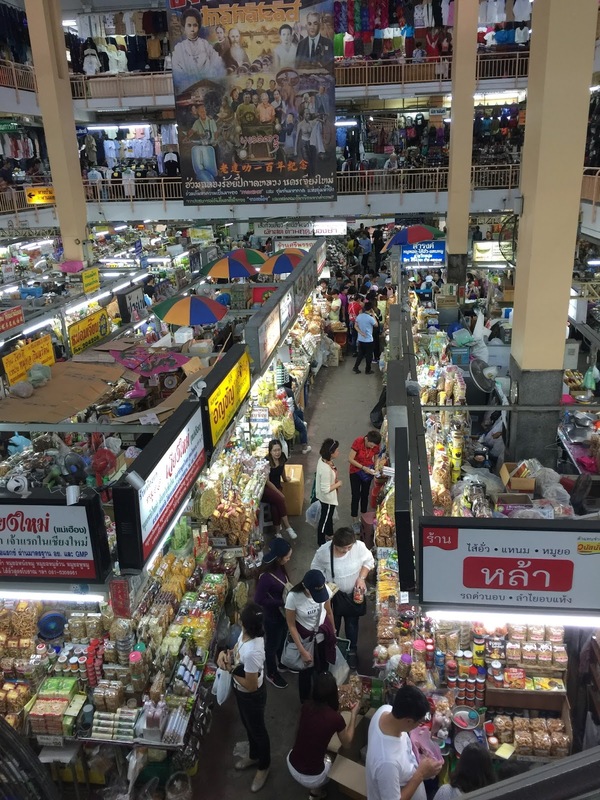 The second and third level of Warorot Market is occupied by stalls selling clothing, shoes and bags. 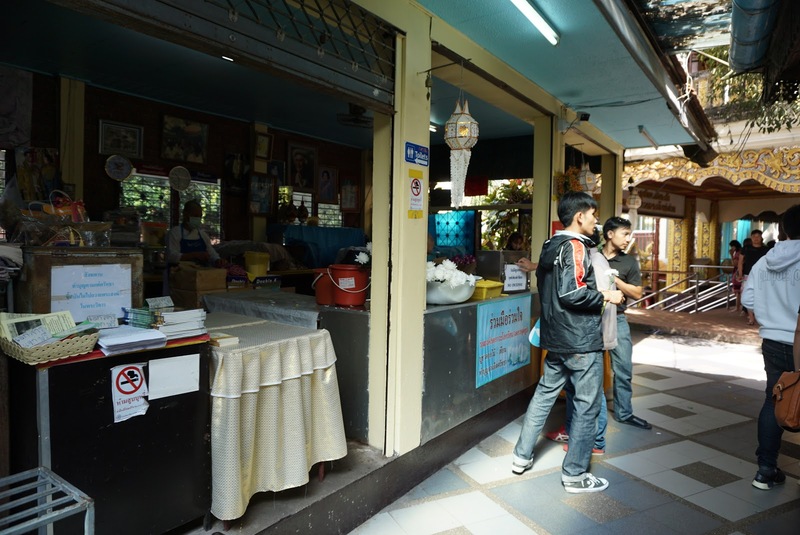 I find more locals visiting this market then tourists. 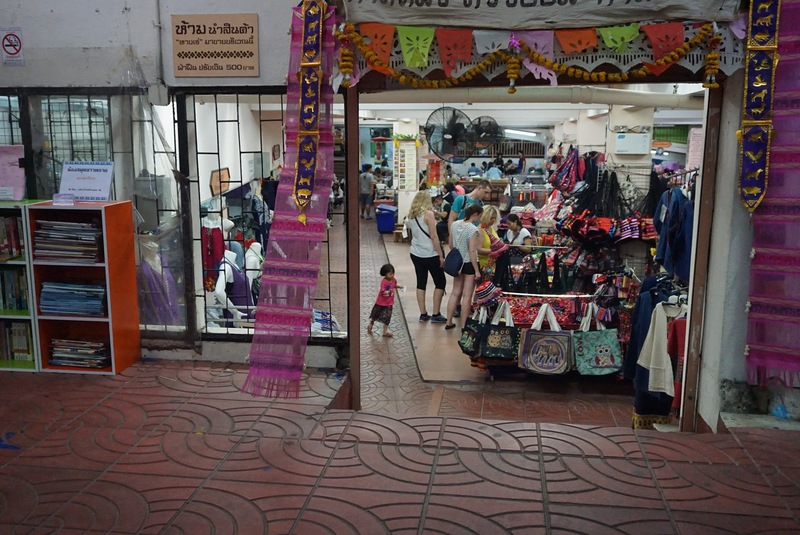 There are more shops around the main building of Warorot Market, making this a great place for visitors to get last minute souvenirs before heading home. We could have spent hours shopping for souvenirs in Warorot Market, however as we have a plane to catch, we had to head back to the hotel and get ready for our flight home. We left for the airport at around 3pm, in time for our flight home. 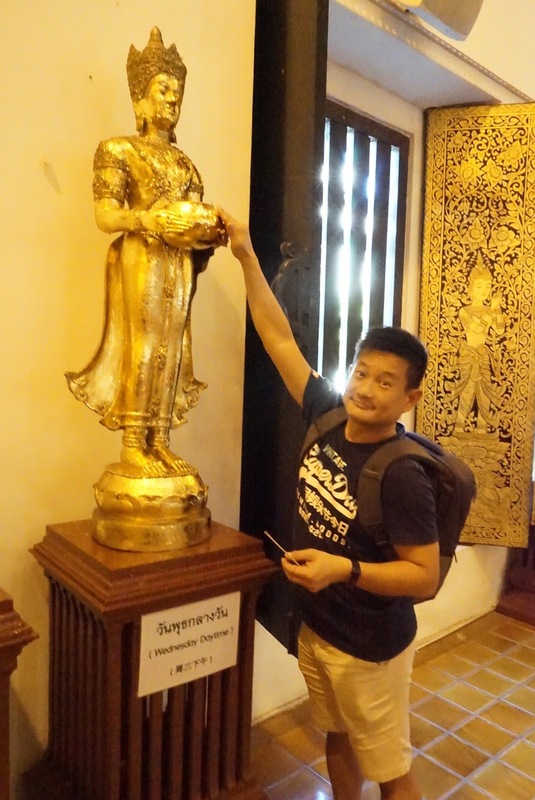 I find people in Chiang Mai are friendlier and more patient as compared to their counterparts in Bangkok. The pace of life is slower here as well. 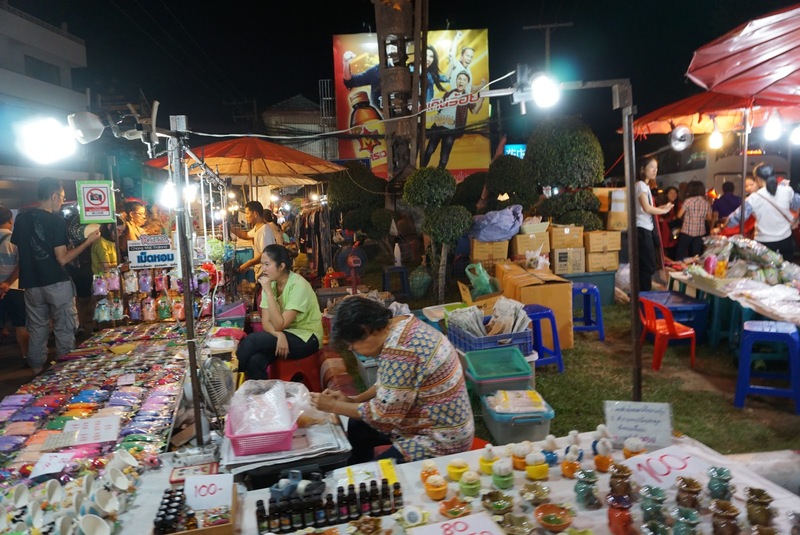 The streets of Chiang Mai is cleaner and the prices of things in Night Market is lower than Bangkok. 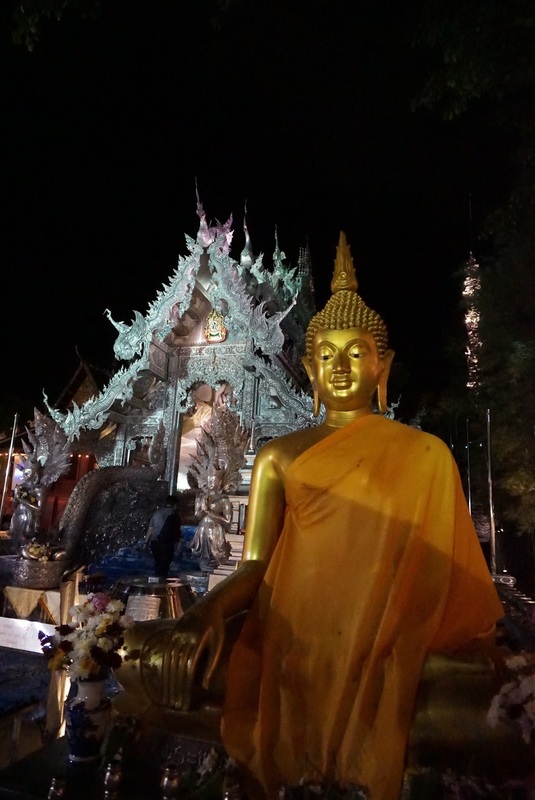 Chiang Mai is a place where even the locals, especially those from Bangkok visit to get a break from the hustle and bustle of city life. 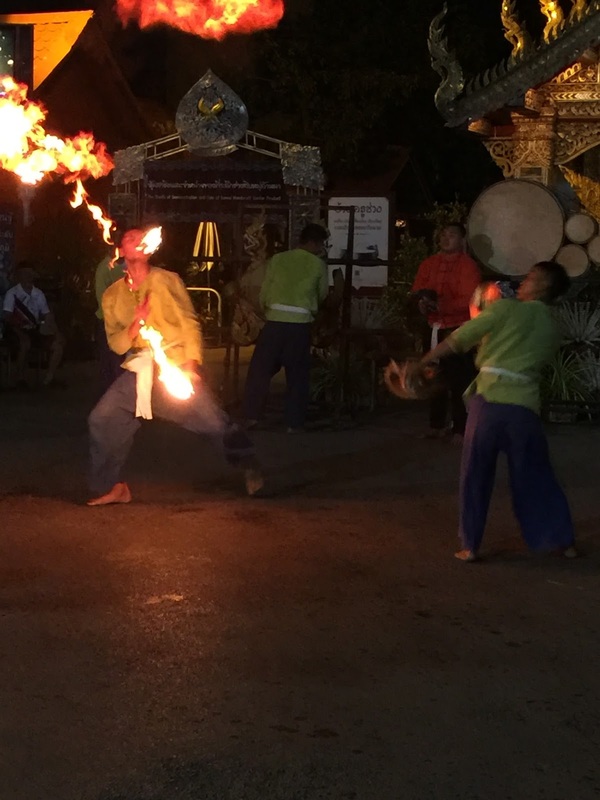 Even the air is fresher in Chiang Mai. 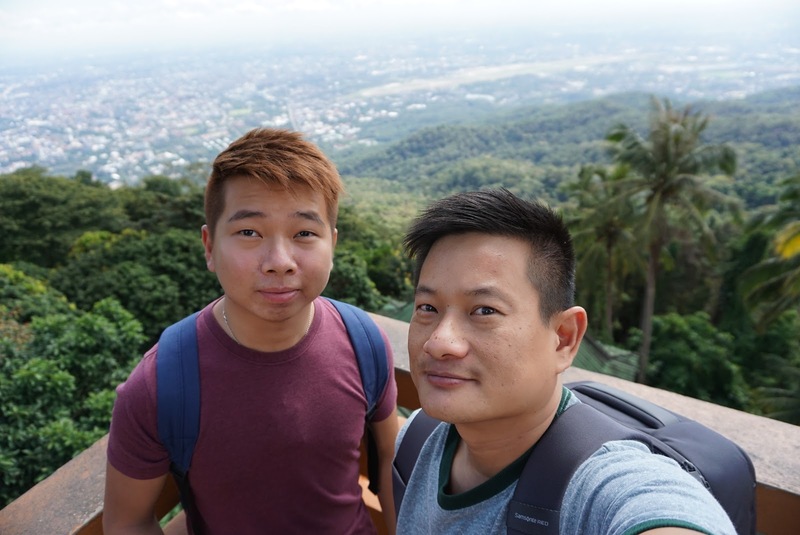 There are beautiful sceneries and spectacular waterfalls in Chiang Mai, which I did not manage to visit. 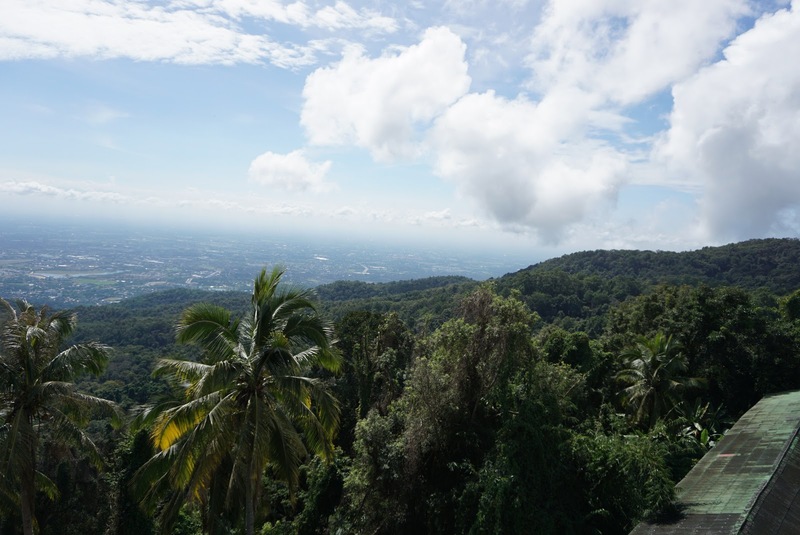 Perhaps the next time if I return to this northern city of Thailand, my focus will be more of nature. 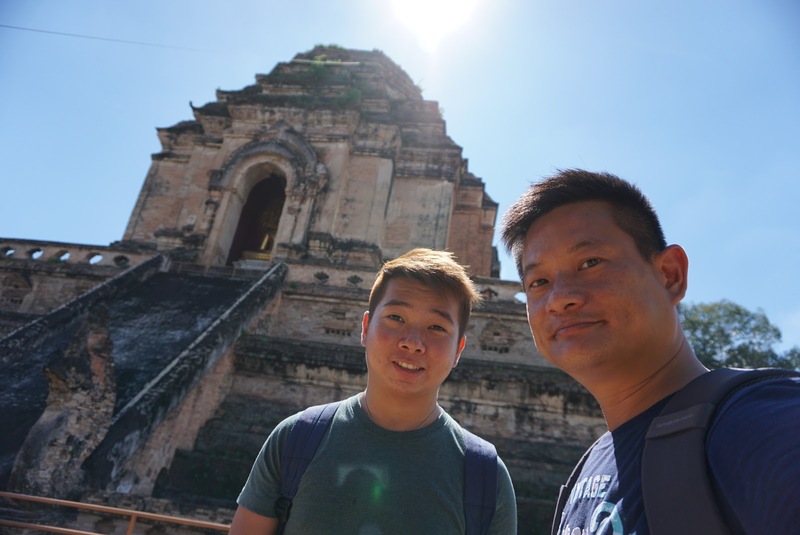 Today we planned to visit some of the temples in the Old City, after all during my research prior to this trip, I found out that there are several temples worth visiting in the Old City. 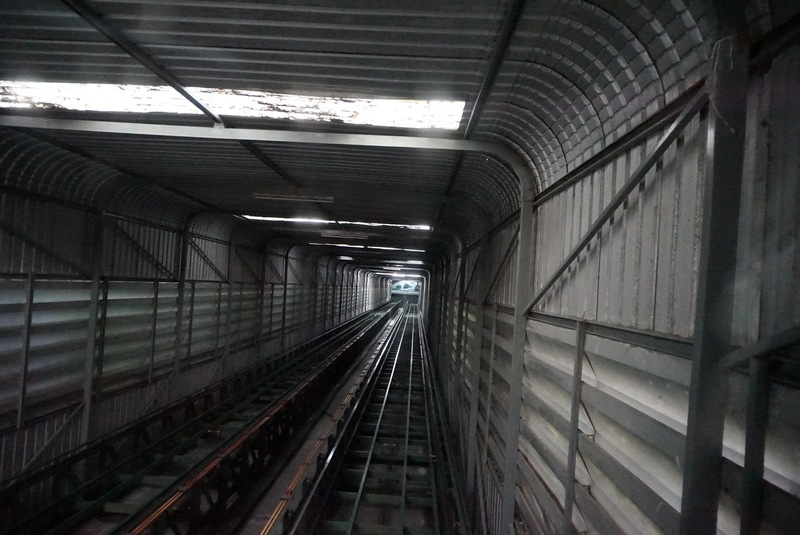 As we did not have the dedicated car today, we moved around in the city via songthaew. 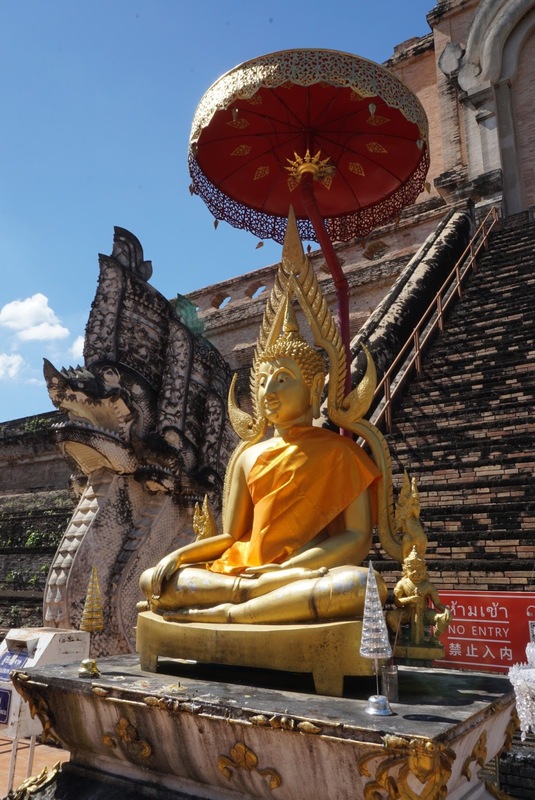 Our first stop today is Wat Chedi Luang. 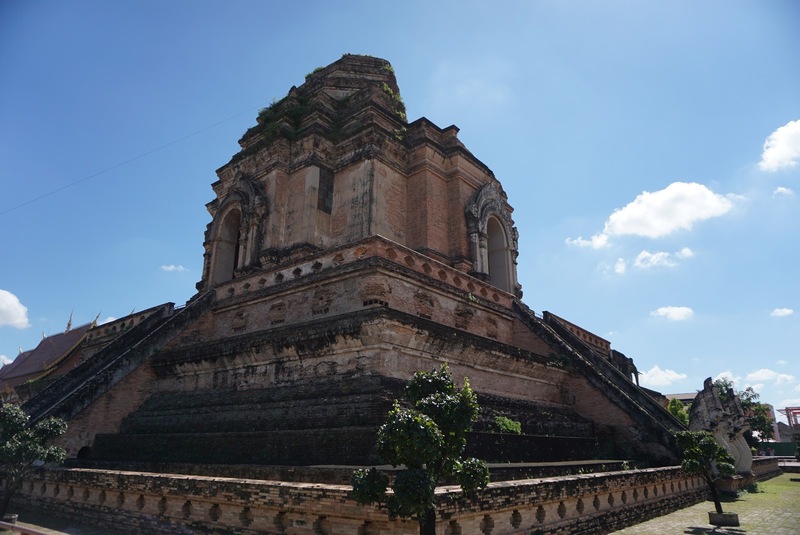 The main draw for us to visit Wat Chedi Luang is the partially ruin chedi that was believed to be the tallest building in ancient Chiang Mai. Entering Wat Chedi Luang, pass the ticketing counter, a small shrine – Inthakhin Pillar Vihara at the side of the main building is the first thing that we visit. Interestingly, there is a sign that says women are not allowed to enter this shrine. 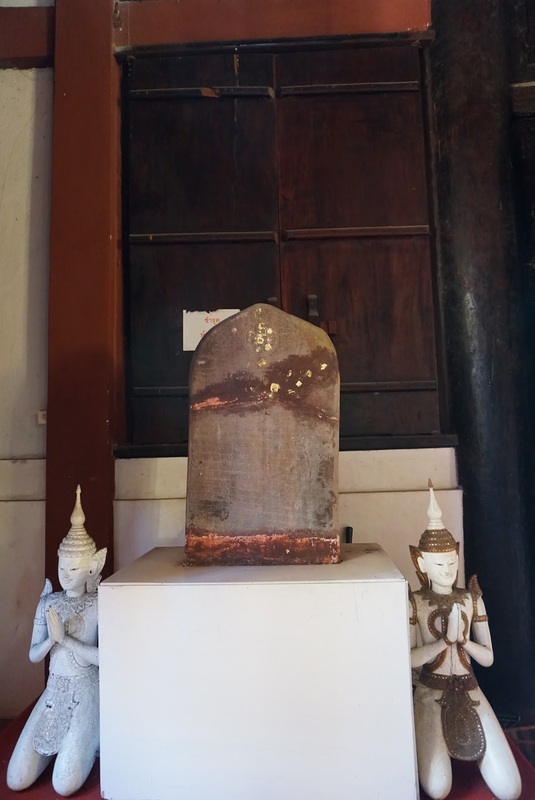 Upon reading the sign, it is believed that the city pillar of Chiang Mai was buried beneath this shrine and that women who entered might cause social instability. 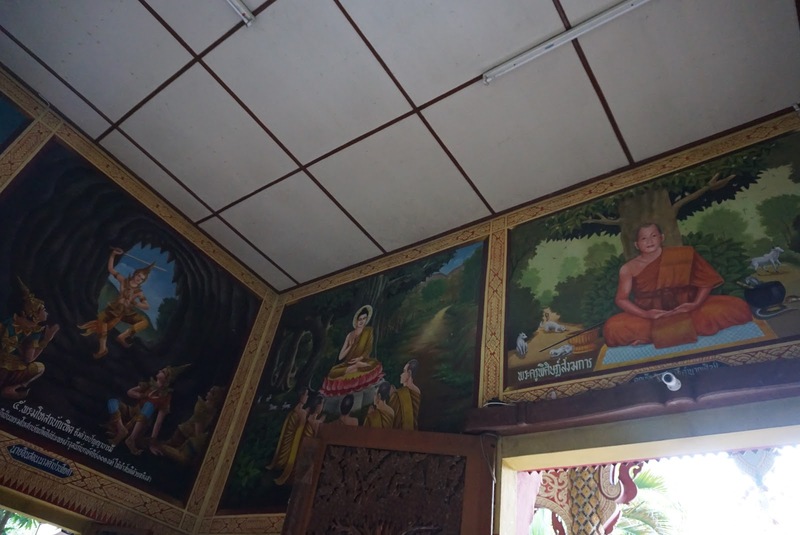 The interior of Inthakhin Pillar Vihara is very colourful, with paintings that depict Buddhism in Thailand. 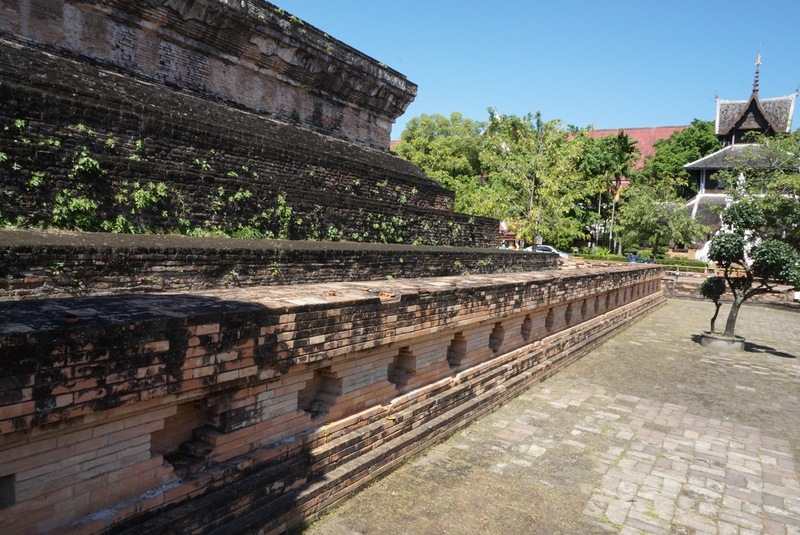 We headed for the main prayer hall just a little into the temple grounds of Wat Chedi Luang’s main entrance, pass Inthakhin Pillar Vihara. 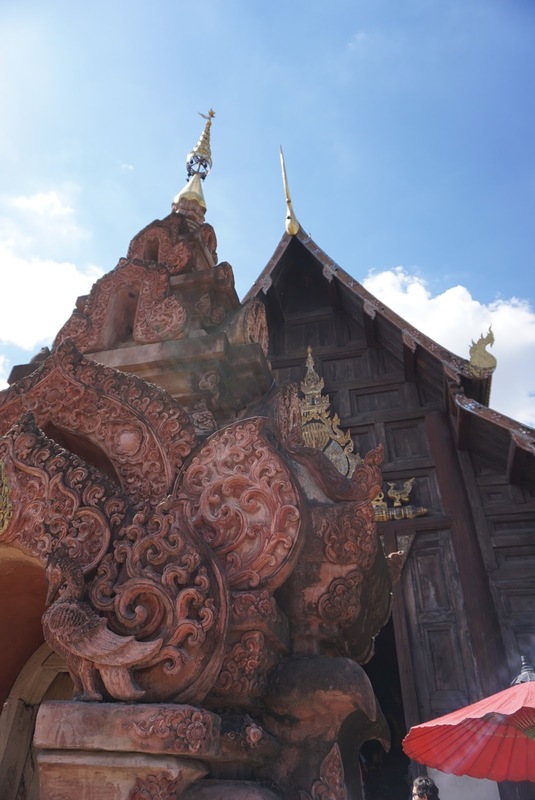 This large viharn is guarded by 2 elephants and 2 nagas, the 3 tiered roof of the main shrine is a work of art. 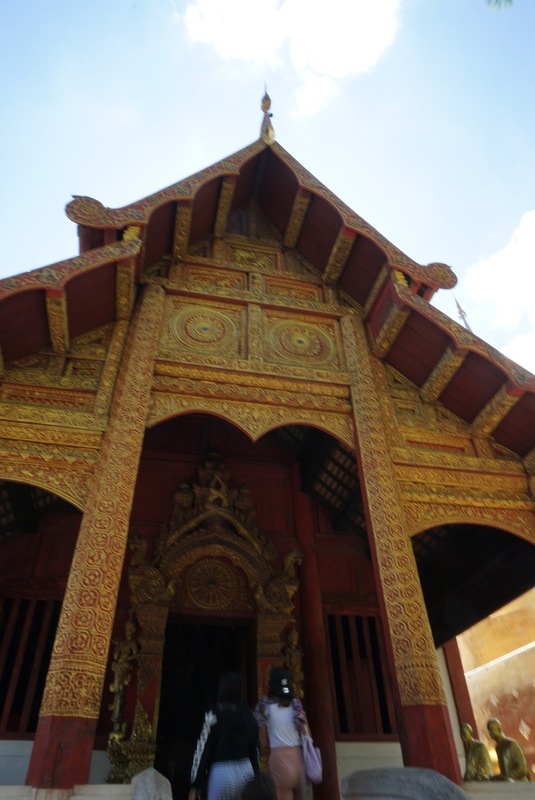 The facade of the shrine is covered with Lanna-styled gold elaborate and detailed carvings. 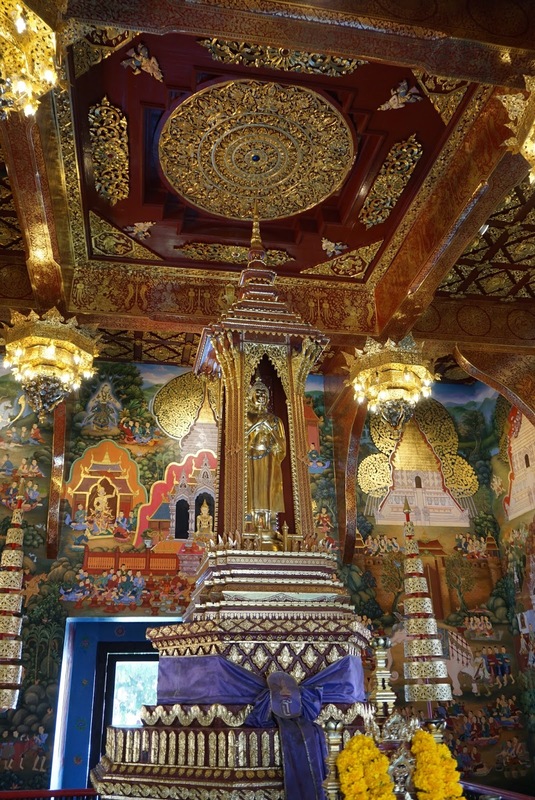 The interior of the viharn, decked in maroon and gold colours, look grand and elegant. A row of chandelier hangs in the centre of the ceiling that leads all the way into the prayer hall. 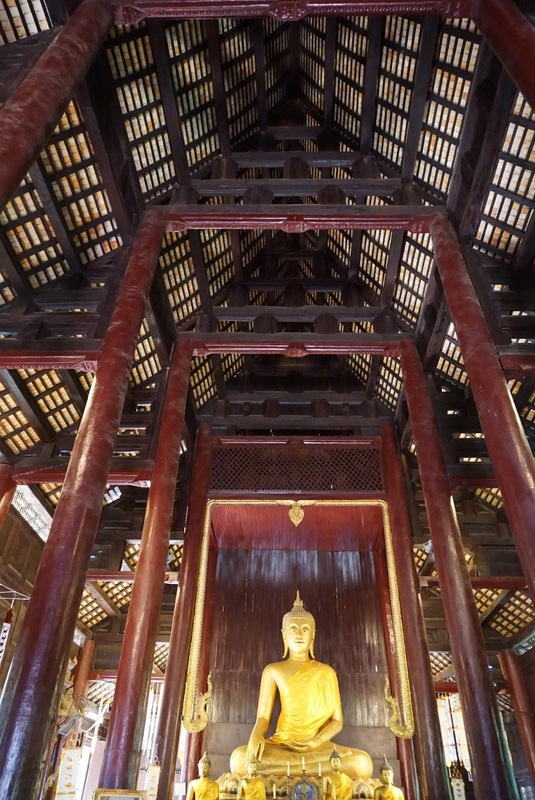 The main Buddha, standing a whopping 3 storey tall, was cast in the 14th century. 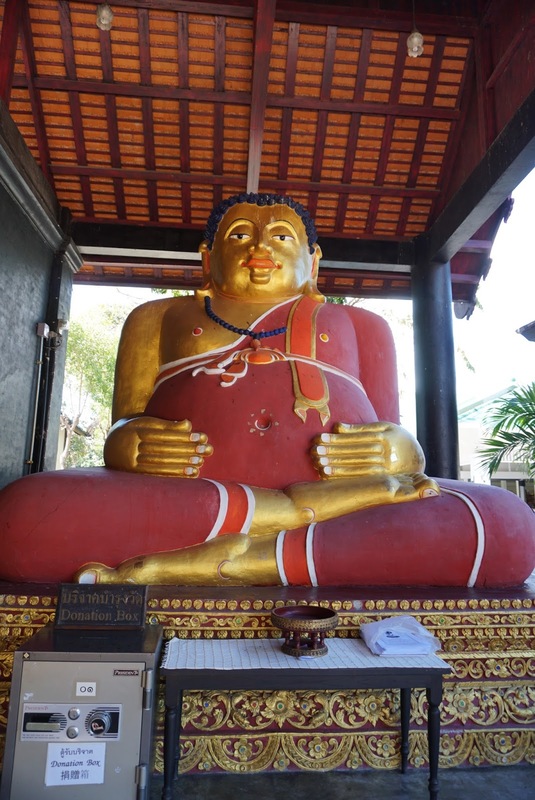 To this date, the Buddha statue is very well maintained and there are no signs that show its age. 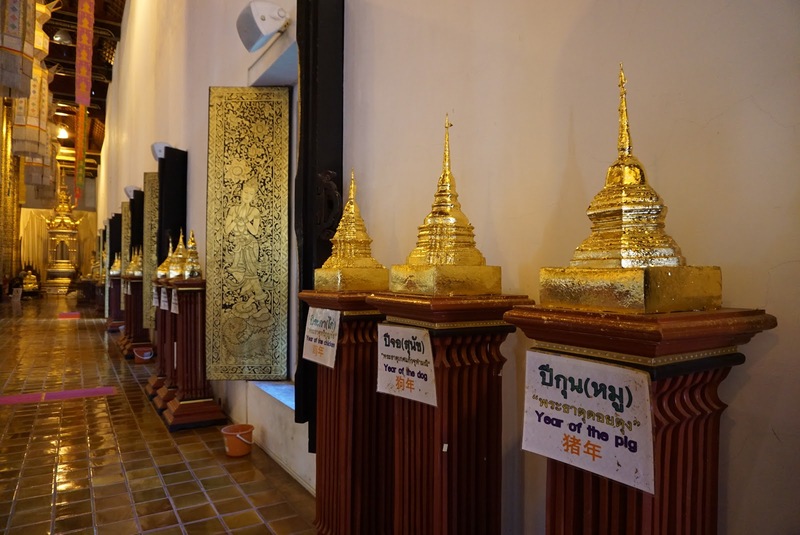 Visitors to Wat Chedi Luang can buy some gold foils from a desk at the entrance of the viharn to paste onto the Buddha statues. 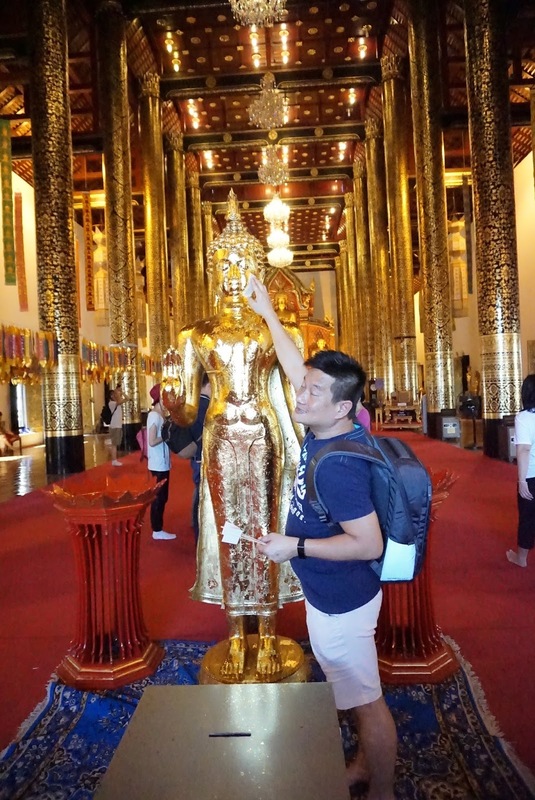 The Thais believe that pasting of gold foils onto Buddha statues is a way of making merits and is also believed that one would get their prayers answered by doing so. 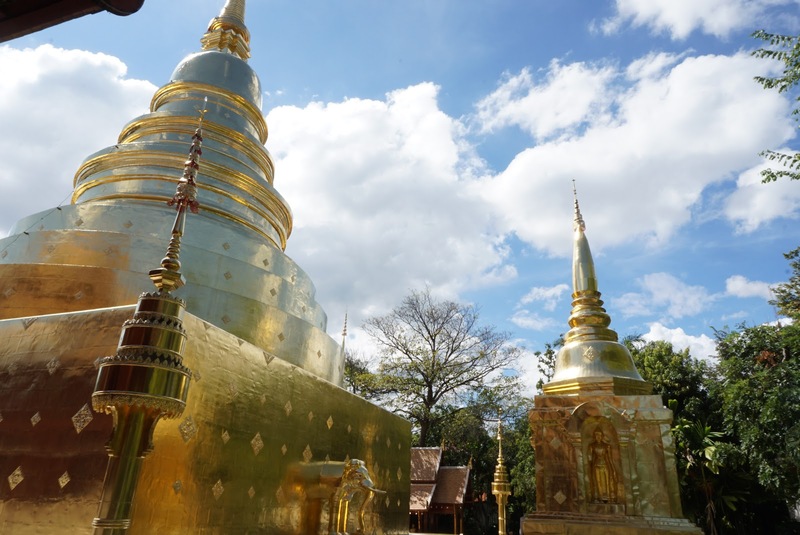 There is a row of small stupas nearer to the entrance of the temple building, where visitors can paste the gold foils according to the zodiac animals that one is born in. 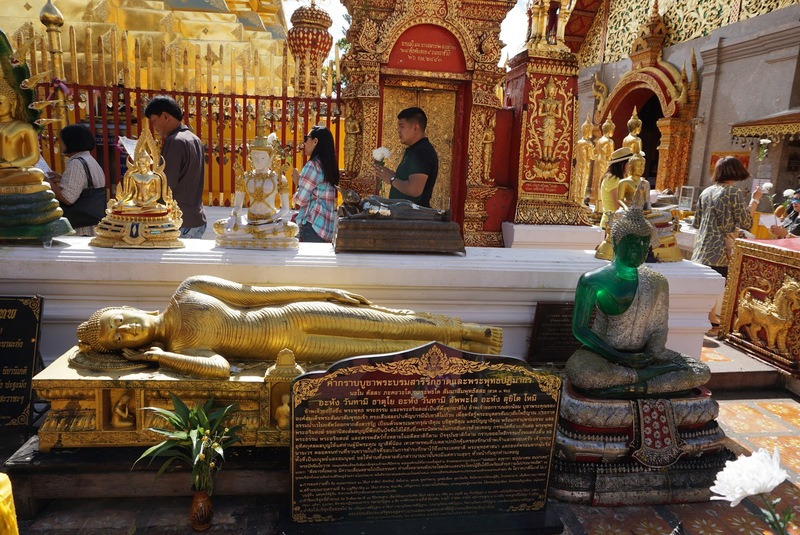 There are also Buddha statues further into the viharn next to the stupas, where one can paste the gold foil according to the day of the week one is born. 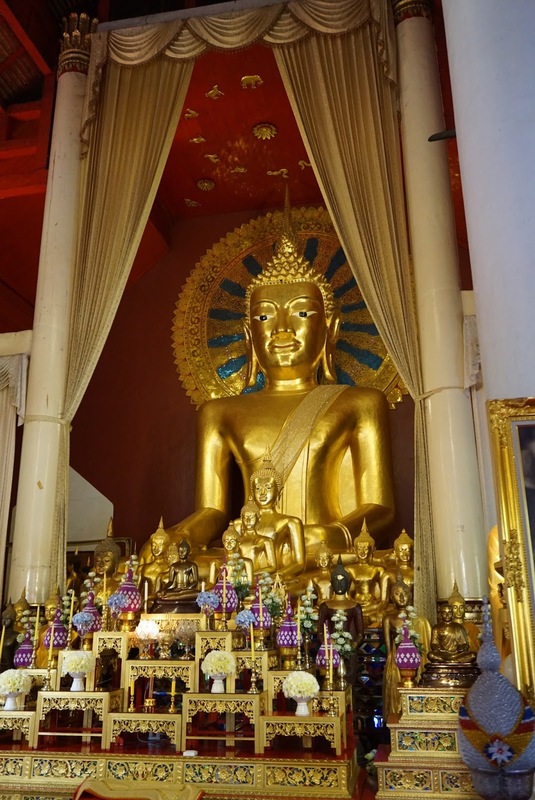 We bought 3 gold foils and pasted one onto the Buddha statue at the entrance of the viharn, one on the stupa according to our zodiac animal and one onto the Buddha statues according to the day of our birth. 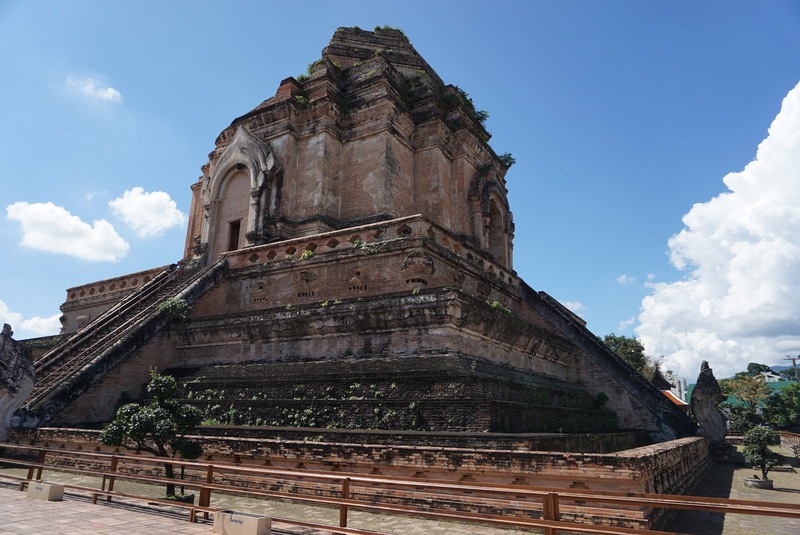 The highlight of Wat Chedi Luang lies behind the main temple, this is where the giant stupa that seems to stand the test of time is located. 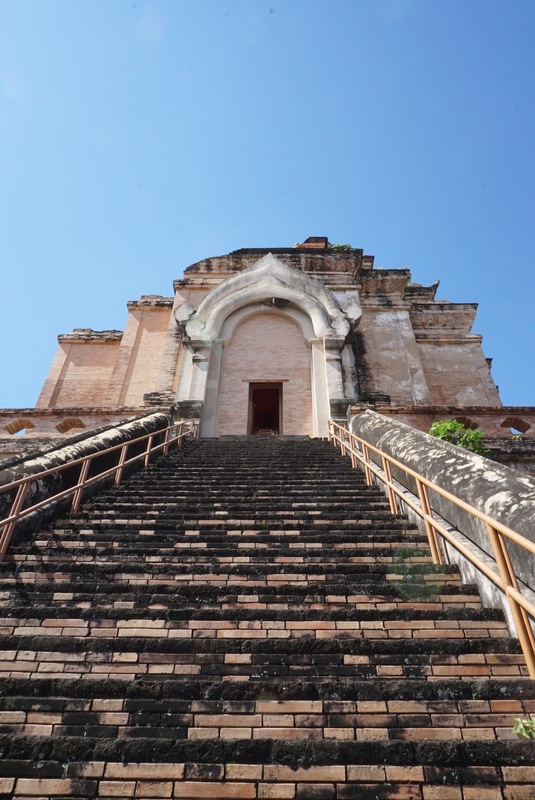 The 5-tiered stupa, built in 1441, is massive! With a height of 62m and base diameter of 54m, the stupa is impressive. 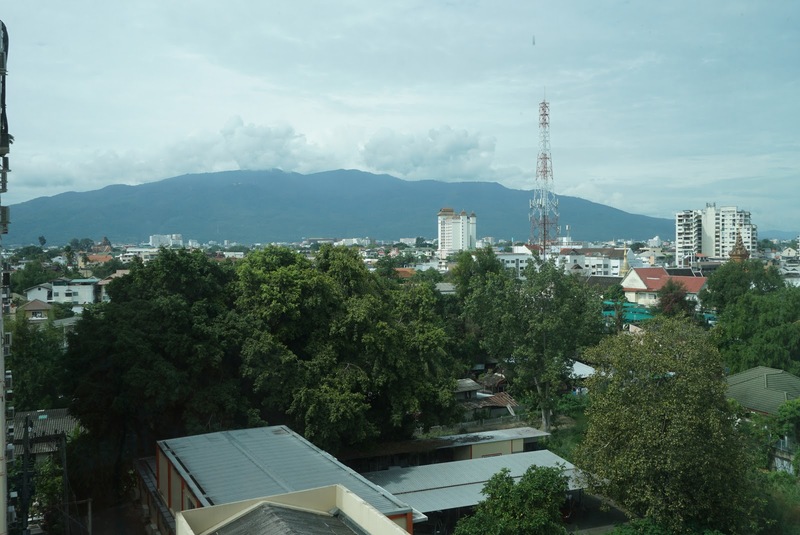 It used to be 82m tall and was at one point, the tallest building in Chiang Mai. However, an earthquake sent the top 30m tumbling down. Despite that, the stupa is still impressive. 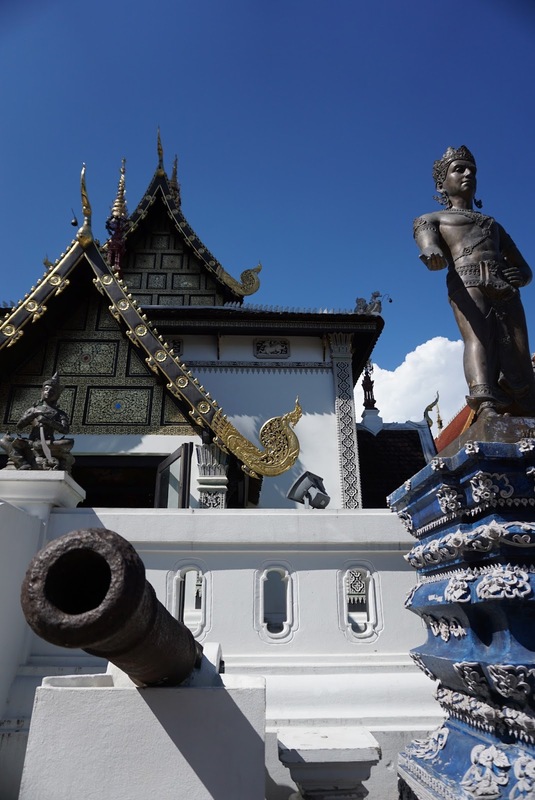 The stupa once housed the Emerald Buddha at the top, which now sits in the Grand Palace in Bangkok. 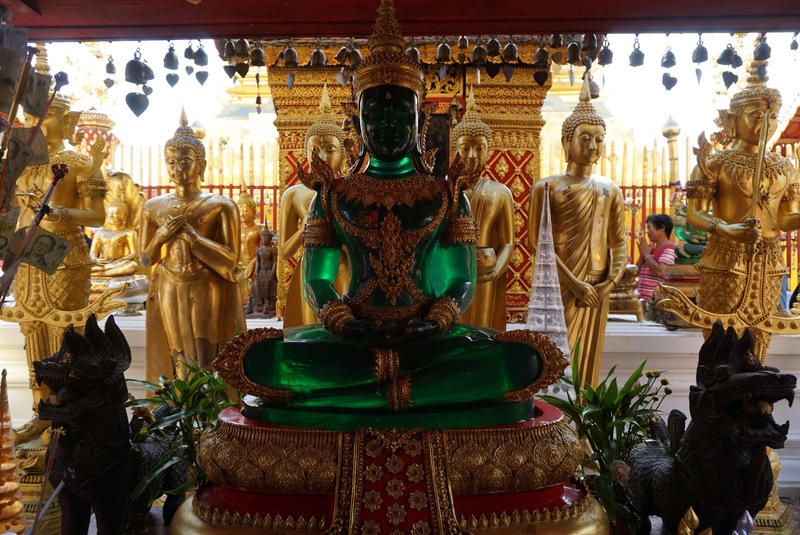 The Emerald Buddha is regarded as a symbol of power which gives whoever possesses it the legitimacy to rule the country. 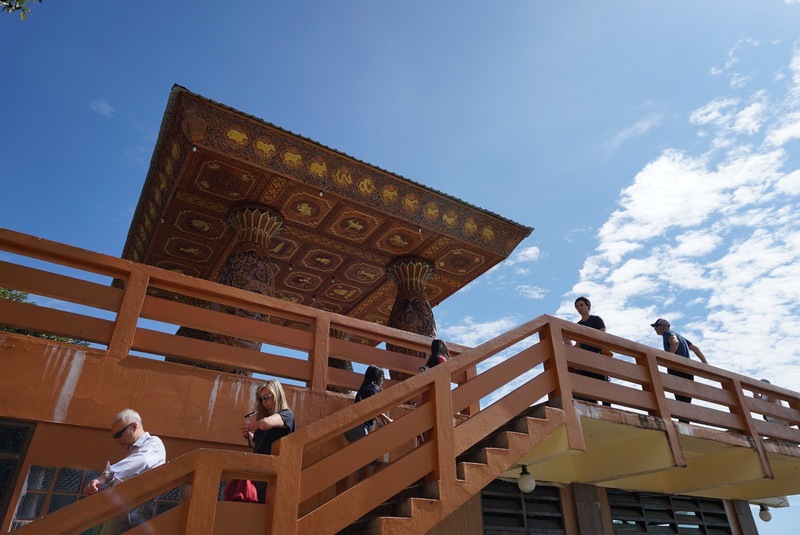 Walking around the stupa, it seems that the earthquake did not take away the grandeur the stupa exudes. Every inch is a work of art, I can imagine how grand and elaborate this stupa must have been in its heydey. 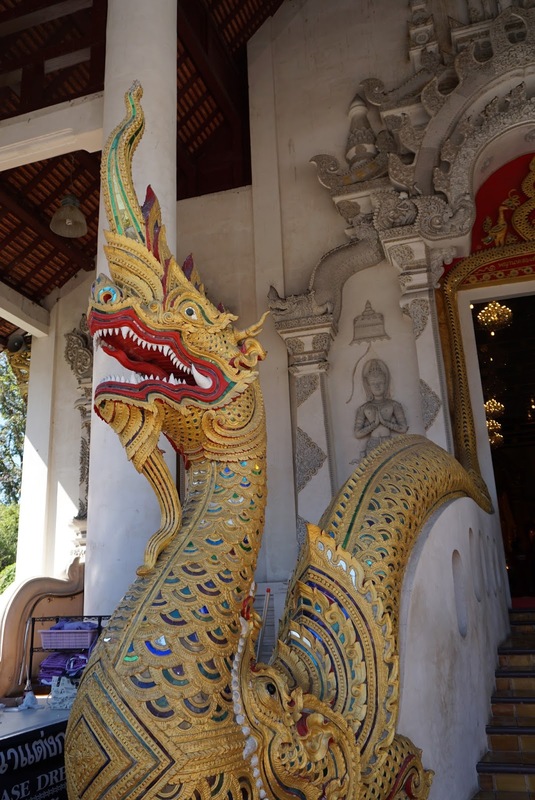 A pair of Nagas statues guarding the 4 stairways on each side of the stupa, that leads to the top of the stupa for centuries. The Buddha statues housed in the top of the stupa on all four sides are visible from the base of the stupa. The stupa is fenced up these days to prevent visitors from climbing, thereby causing more damage to the dedicate stupa. On the southern side of the stupa, 7 elephants can be seen protruding out of the stupa on the 4th tier, that seem to be carrying the weight of the top tier of the stupa. Some of these elephants less 2 have been restored over the years. 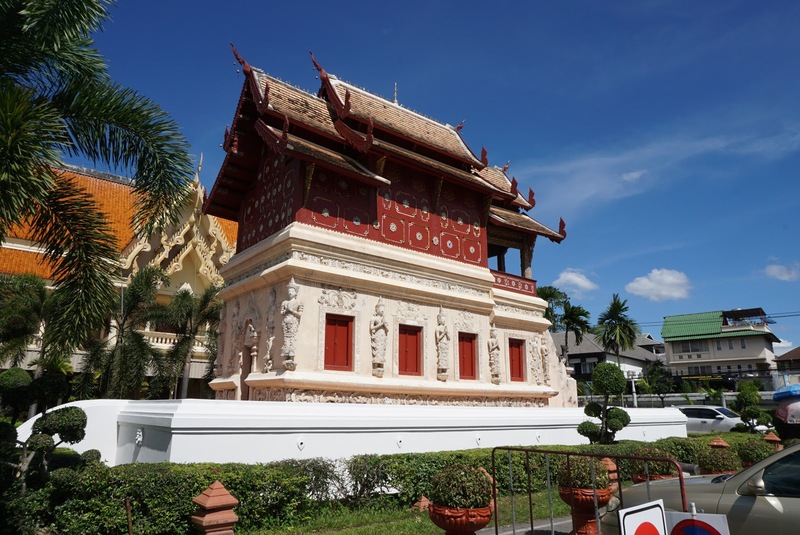 Behind the stupa lies an open building that houses a large statue of the Reclining Buddha, with a short fence at the front of the building. Initial we were just taking pictures from beyond the fence. A closer observation, I realise that the fence was not locked and visitors are allowed to enter the building through the gate. One can take pictures without pillars of the building blocking from inside the building. 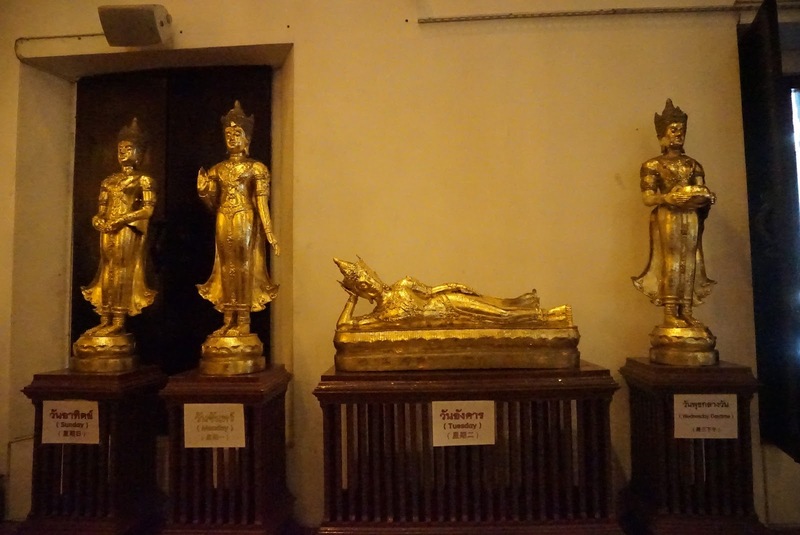 There are 3 other statues of Buddha housed in the same building. 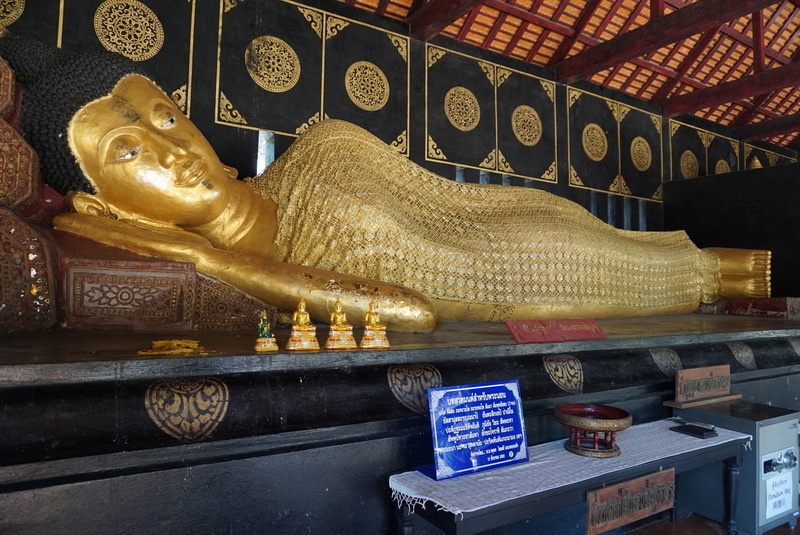 Next to the building with the reclining Buddha are 2 wooden buildings. 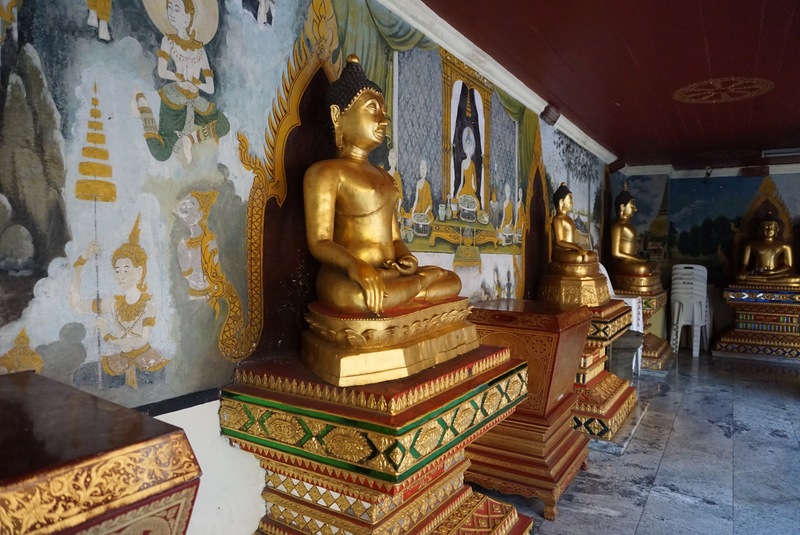 These buildings houses wax figurines of the abbots of Wat Chedi Luang. 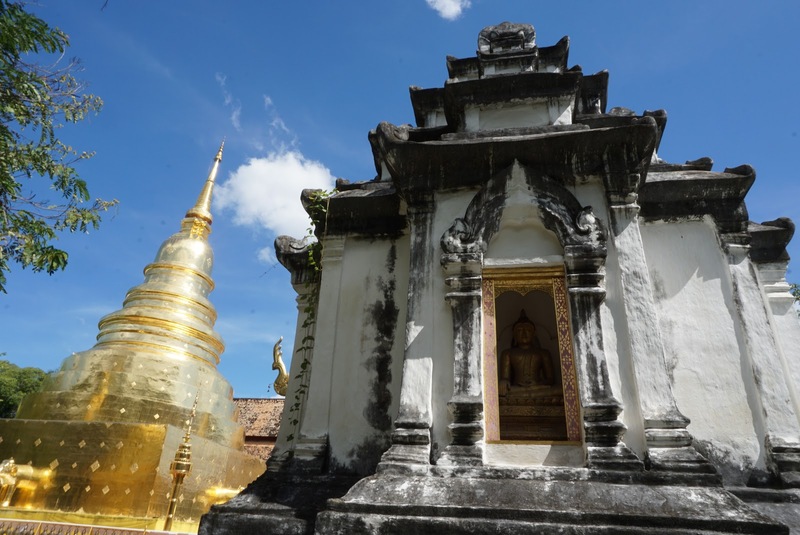 We headed for the exit after spending a little more time admiring the stupa which Wat Chedi Luang is built around. 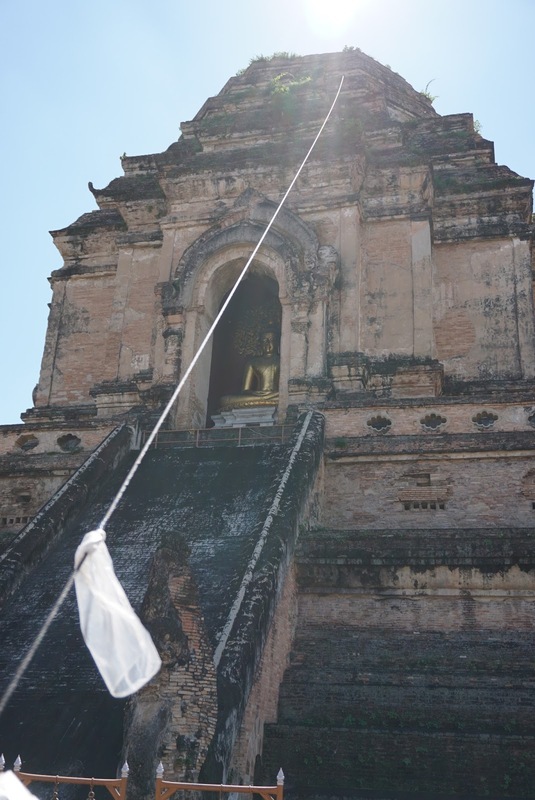 Leaving Wat Chedi Luang, we headed to a small temple next to Wat Chedi Luang. 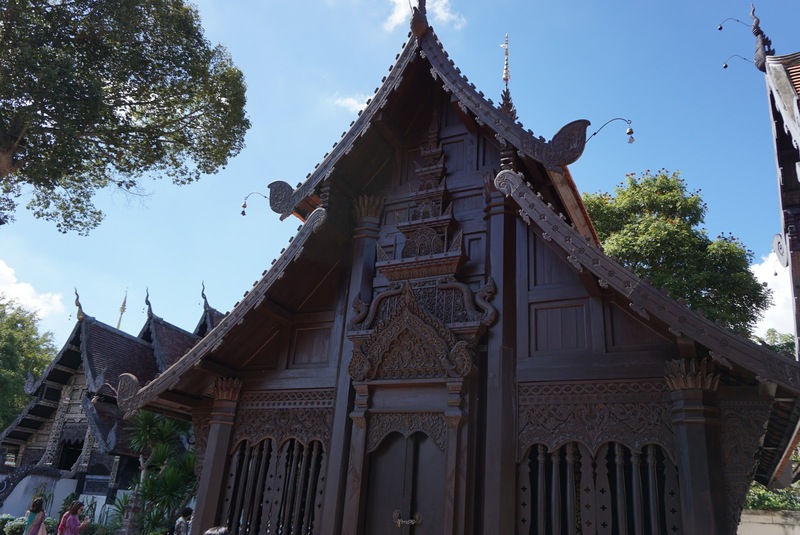 This small wooden temple is Wat Phan Tao, which is often overlooked by visitors. 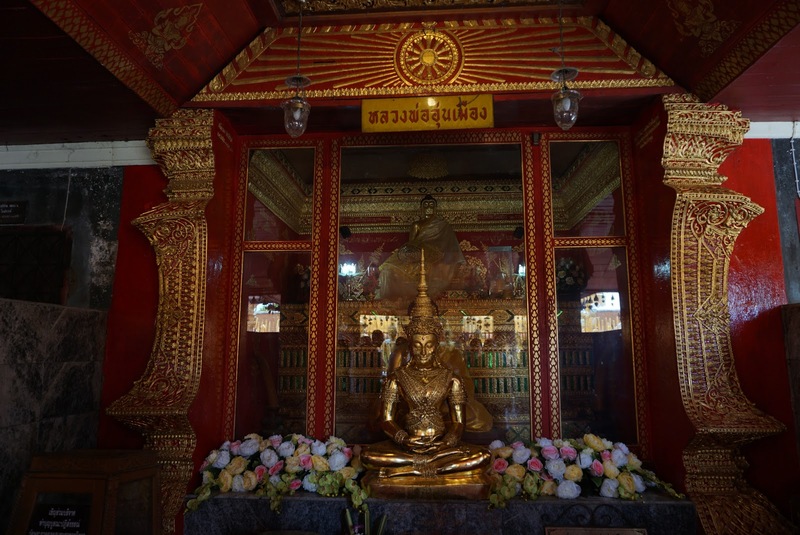 Wat Phan Tao is a small temple, with only one wiharn that faces the main road. 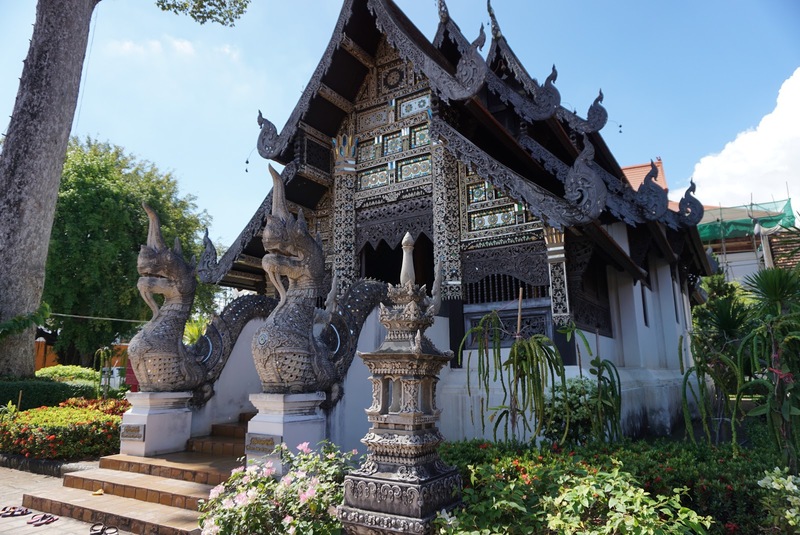 The beauty of Wat Phan Tao lies with the material that was used for its construction. 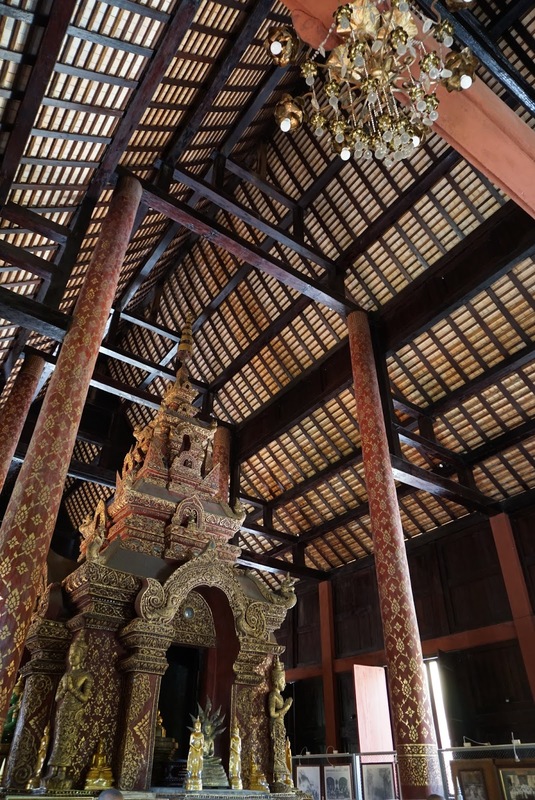 Wat Phan Tao was constructed entirely of moulded teak wood panels fitted together and supported by 28 teak wood pillars. Not a nail was used in the construction of this temple. 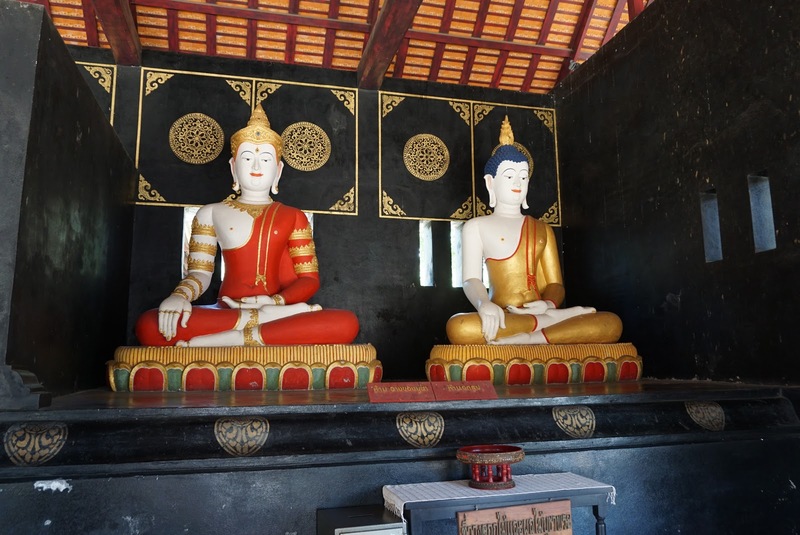 As it is not visited by tourists, I find it particularly peaceful inside the wiharn of Wat Phan Tao. 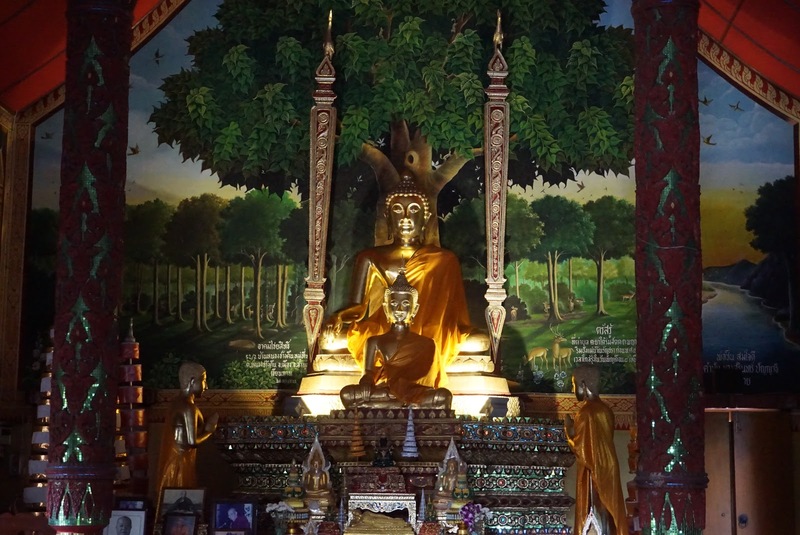 Inside Wat Phan Tao houses a golden Buddha statue. 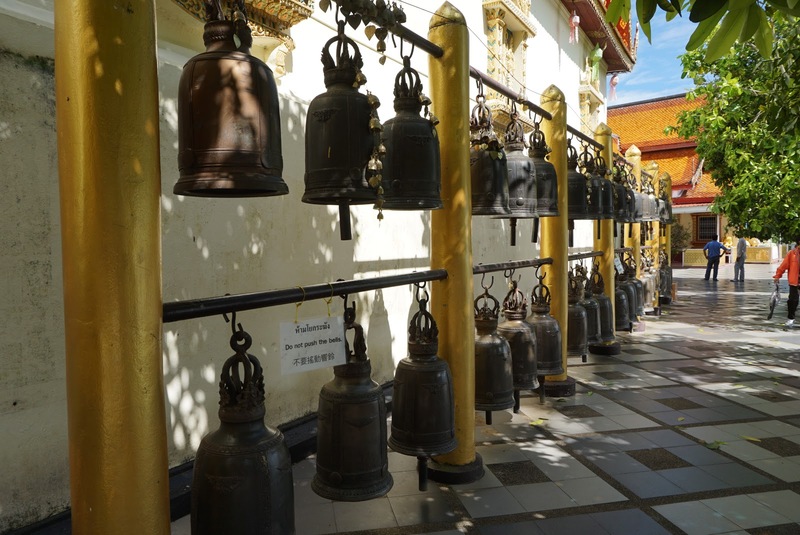 There are some old temple bells, ceramics and old palm-leaf manuscripts on display inside Wat Phan Tao. 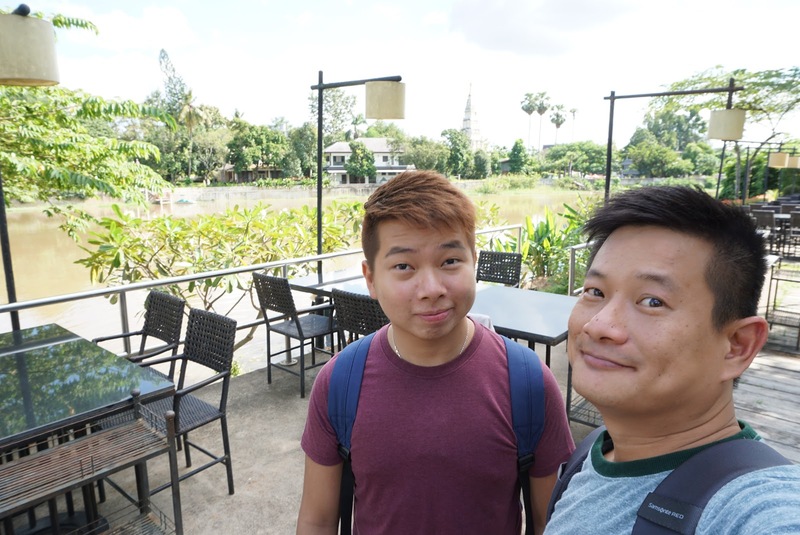 After taking some pictures, we exited Wat Phan Tao and headed for more shopping. 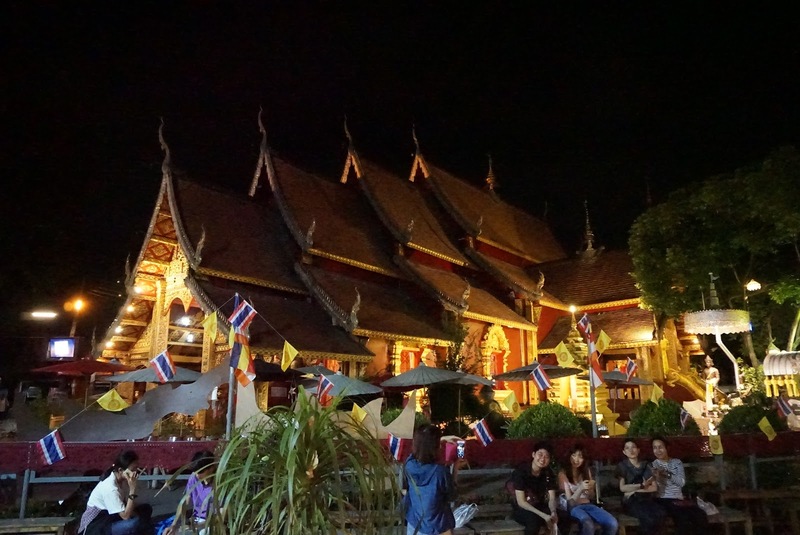 Our next stop is Central Festival Chiang Mai, located northeast outside the Old City. 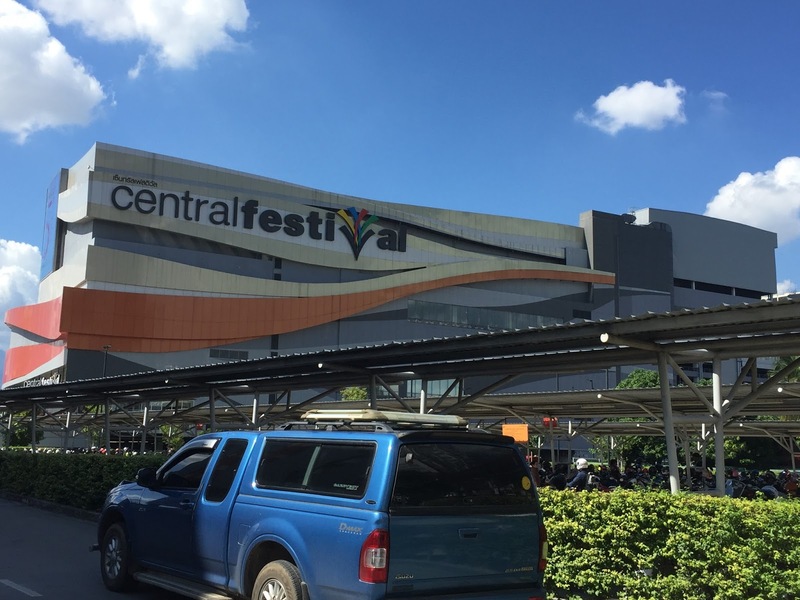 Compared to Maya Lifestyle Shopping Centre, Central Festival Chiang Mai not just is bigger, it is also livelier. 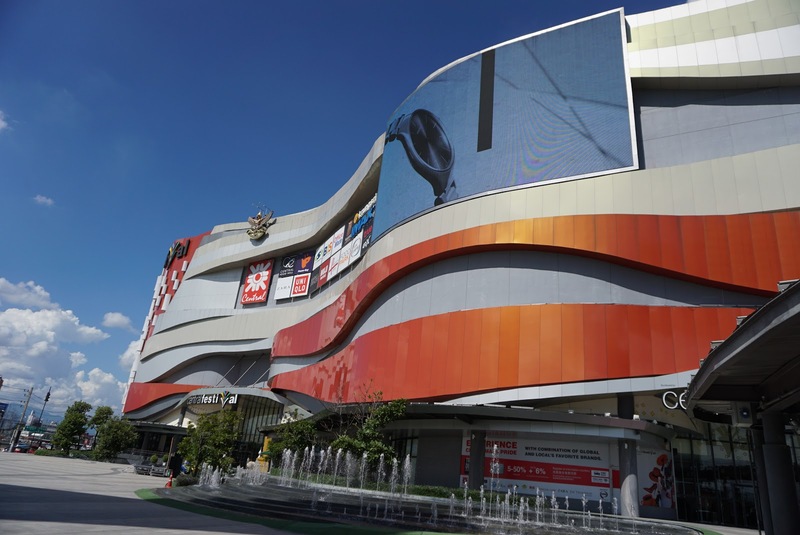 The mega shopping mall is one of the largest in Chiang Mai, covering 250,000 ㎡ of shopping space, spread over 6 floors. 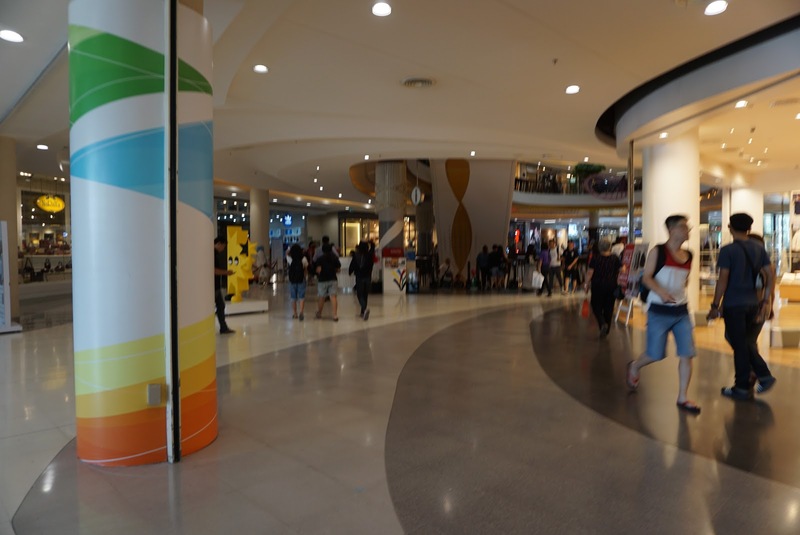 The shopping mall houses more than 300 shops, with a good mix of local and international brands, such as Marks &amp; Spencer and Uniqlo to name a few. This place is a shopping haven for shopaholics. It is a one-stop shopping complex that has everything that one would find in a modern shopping mall. There is even an ice-skating ring in Central Festival Chiang Mai, other than the usual mega cineplex. The 4th and 5th floors of the shopping mall mainly house eateries with local and international cuisines up for choice. There is a Thai local food roadshow in the basement of Central Festival Chiang Mai at the time we went. Here is where we got most of our local food souvenirs and the price is rather reasonable. At the time we were there, most of the shops are having a sale, we had a great time shopping here. 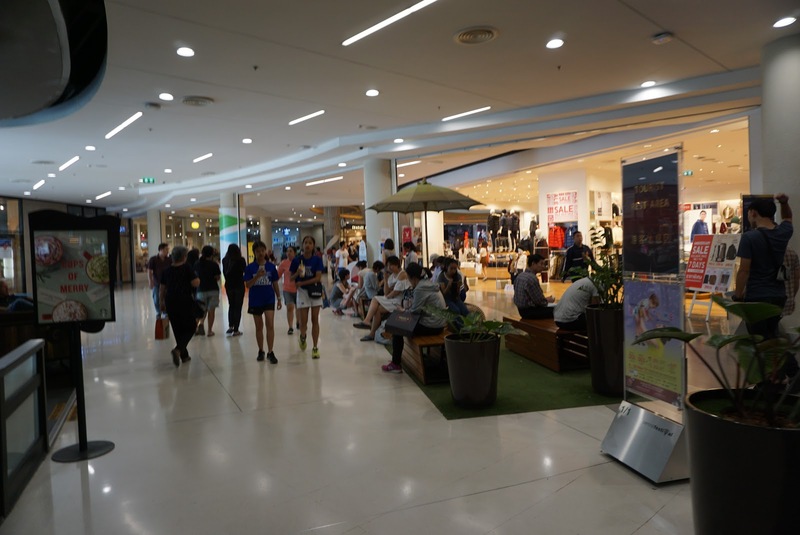 The shopping mall has a tourist privilege scheme, where tourists can get a discount card good for discounts in numerous shops in the shopping mall, with discounts up to 50%, although the shop that we went to offer only 5% discount. 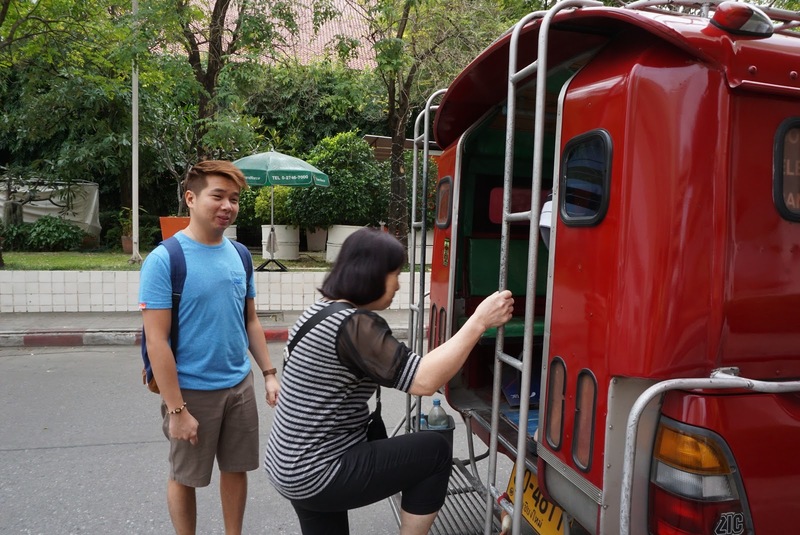 The shopping mall event has a complimentary shuttle bus service that links the shopping mall with some of the bigger hotels in Chiang Mai. 6 routes at a fixed time schedule brings visitors to and from the hotel they stay in. A word of caution, as the shuttle buses can be quite small, do be at the shuttle bus pick up point 15 mins prior to the departure to secure a seat. When at the pickup point, just walk up to the bus and the staff will be happy to let you board while waiting for the scheduled time to depart. The bus that brought us to our hotel can take up to 9 pax, a group of Chinese tourists tried to board the bus but it was full. 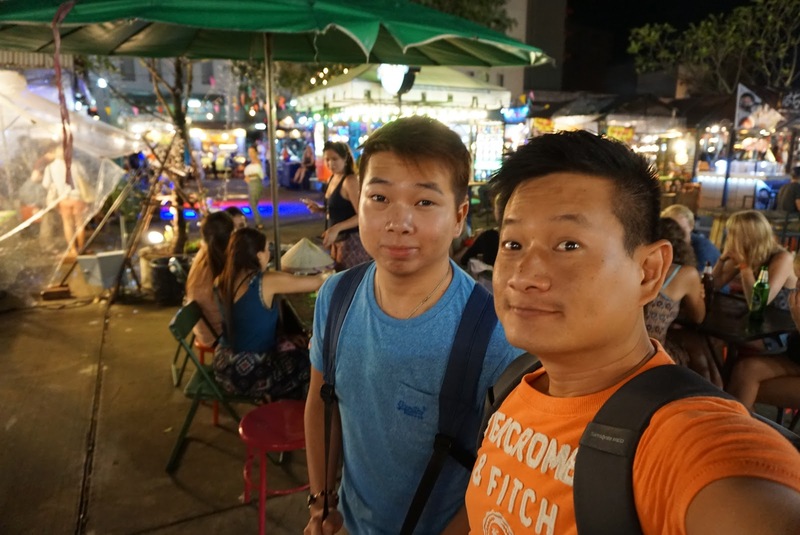 After resting a little in the hotel and having dinner, we spent our last night in Chiang Mai shopping in their Saturday Walking Street. 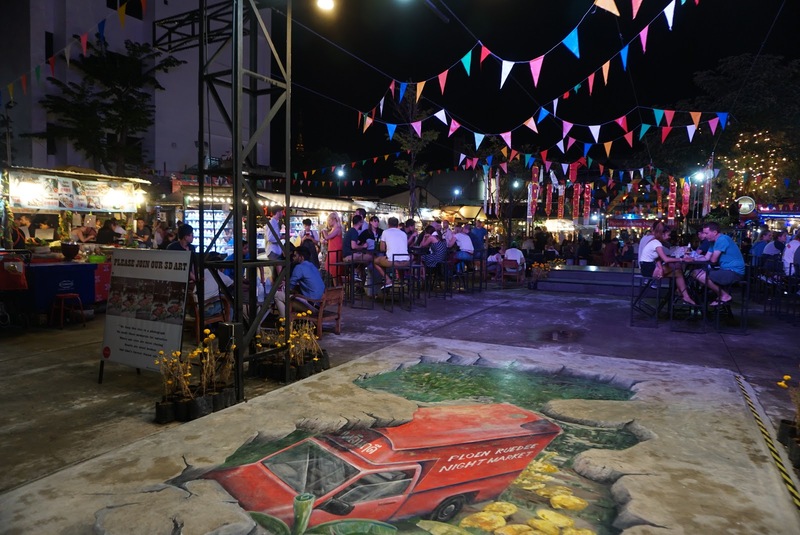 The Saturday Walking Street is a night market that opens only on Saturdays from 4pm until midnight. 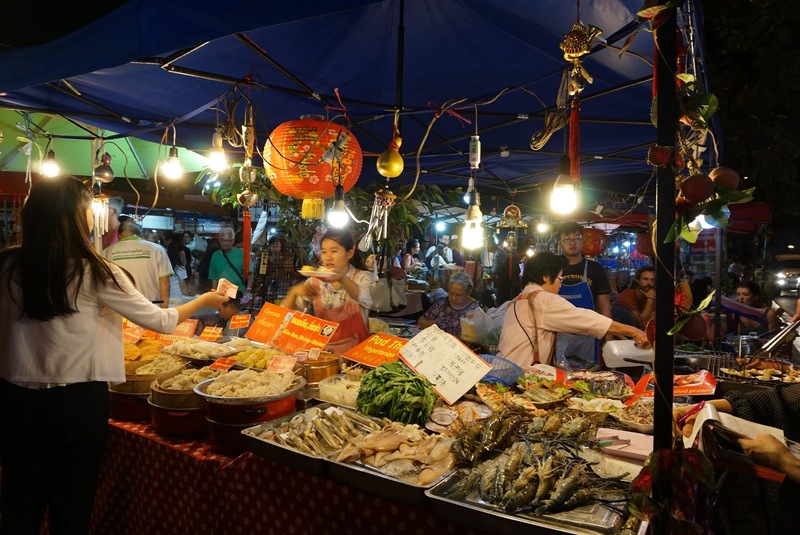 The street that this Saturday Night Market is located south of the Old City along Wualai Road and is popular with locals and tourists alike. As the entire road is closed to traffic, visitors can be assured of a safe vehicle-free shopping environment. 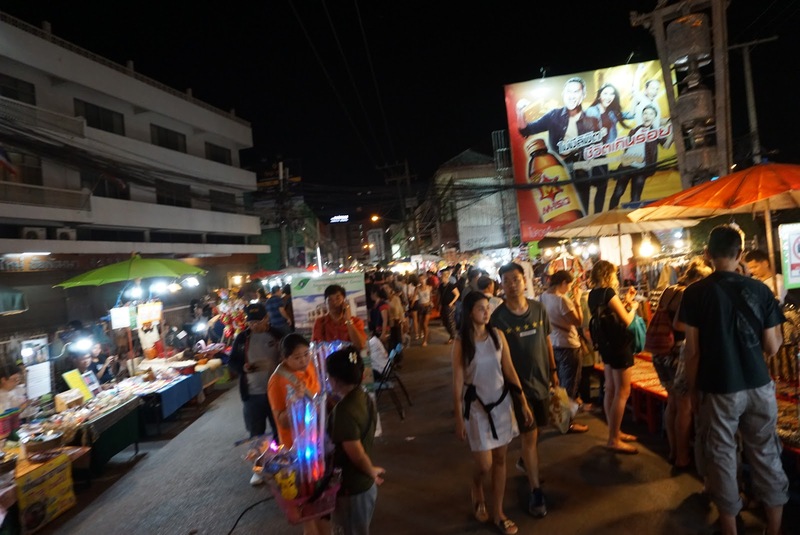 The Saturday Walking Street is very crowded when we visited. We walked at a zombie-like slow speed. 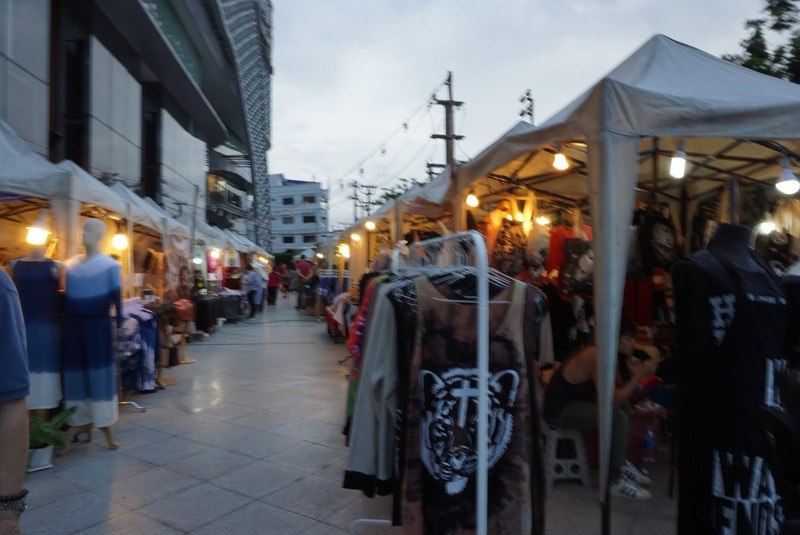 There is no lack of night market shopping here with the numerous stalls selling stuff that is typical of any night market in Thailand. 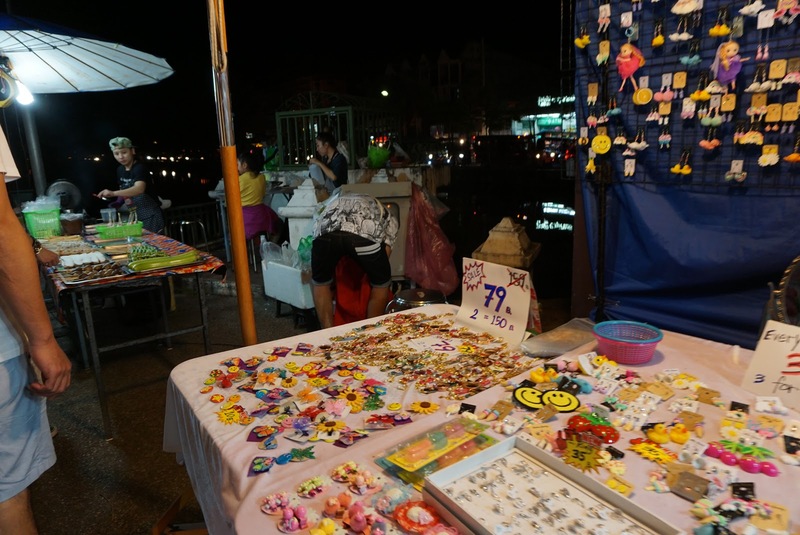 Most of the stalls on the Saturday Walking Street sells mainly souvenir items like those “I have been to Chiang Mai” type of T-shirts, handicraft souvenirs from keychains to soap carvings. I do find the prices here to be cheaper compared to any night markets in Bangkok. 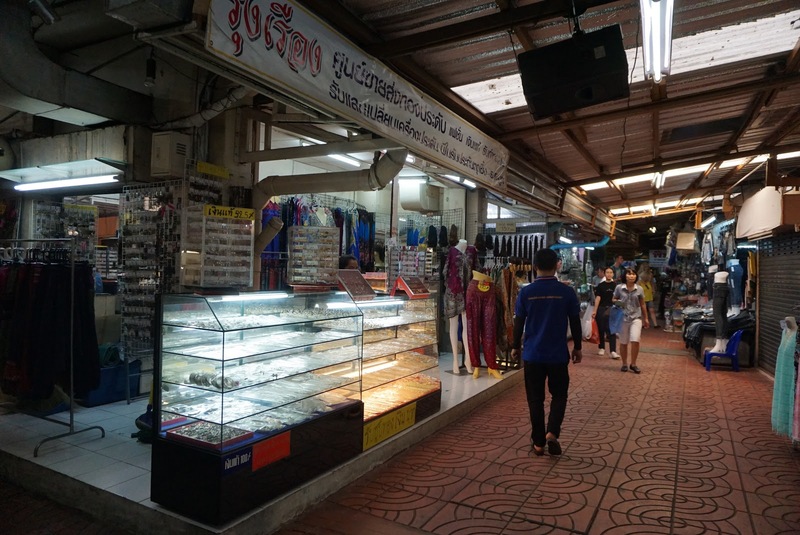 As with the Night Bazaar, there are pockets of areas where one can detour in to find more shops or even a street food area. As it was a warm night at the time of our visit, there are insects flying around the lights, we did not try any of the street food here. We spent the whole night walking along the Saturday Walking Street, mostly browsing on the items that are up for sale. As we were walking in the Saturday Walking Street, we made a turn at a fork junction. Little did we expect this route that we took brought us to a surprising temple that is totally not in our plan to visit. As we were walking along the street, reliving that the crowd here is thinner than what we had experienced, we were attracted to some performances inside a temple ground. 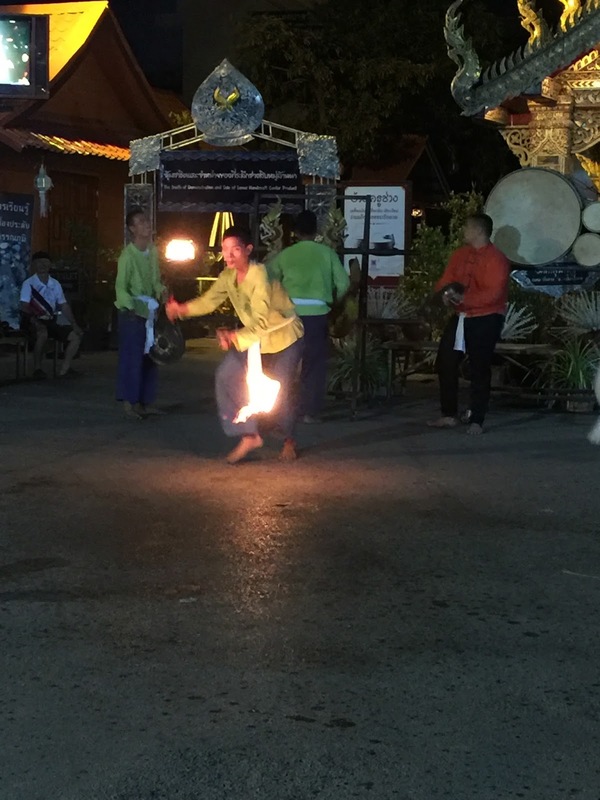 A thin crowd gathered to see some men performing with fire. After the performance, since we are already at a temple, we decided to check it out. 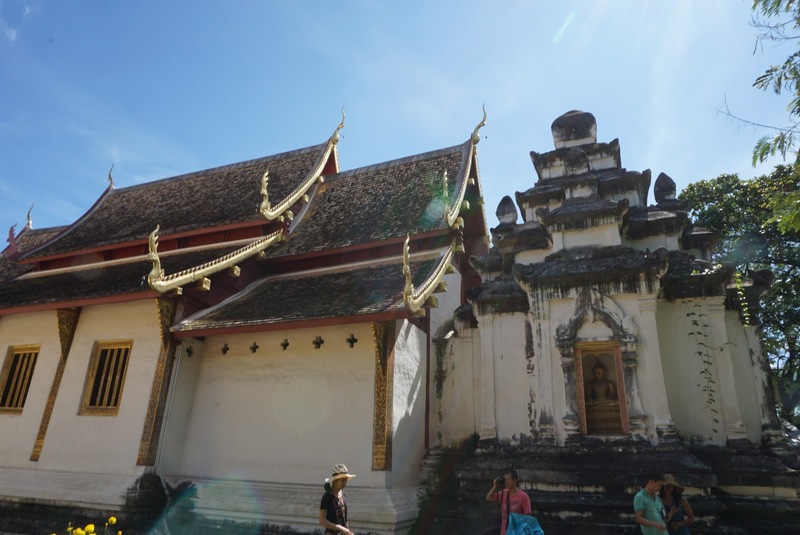 The main wiharn of this temple is an impressive 4-tiered roof large building. 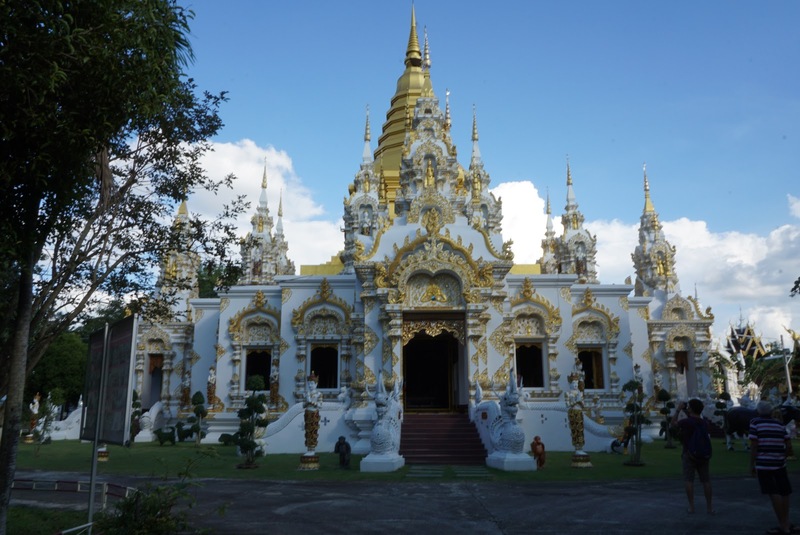 A little further from the entrance to the temple, we saw a small 2-tiered wiharn in Silver. 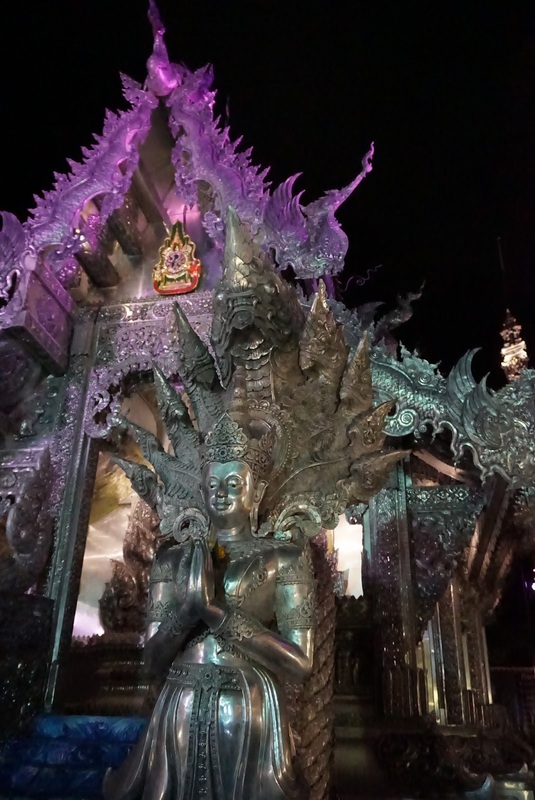 This is the Silver temple or known as Wat Sri Suphan. 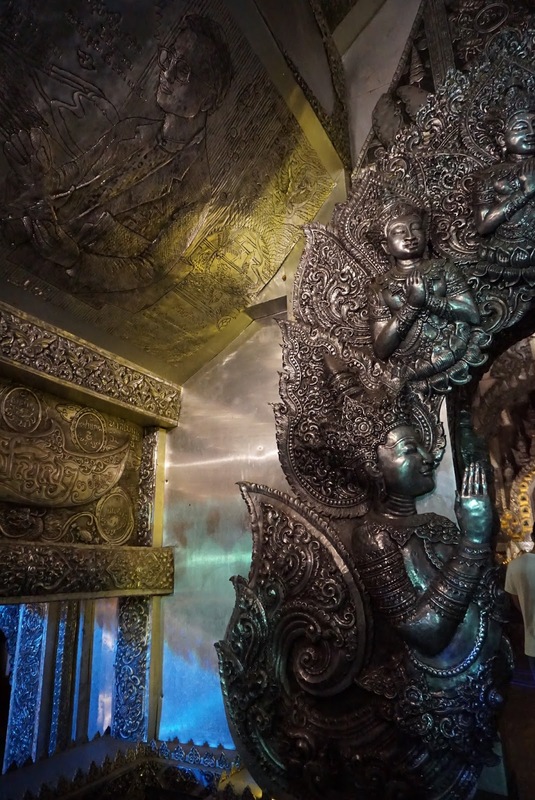 The silver temple is made using a mix of aluminium, compounded silver and pure silver. 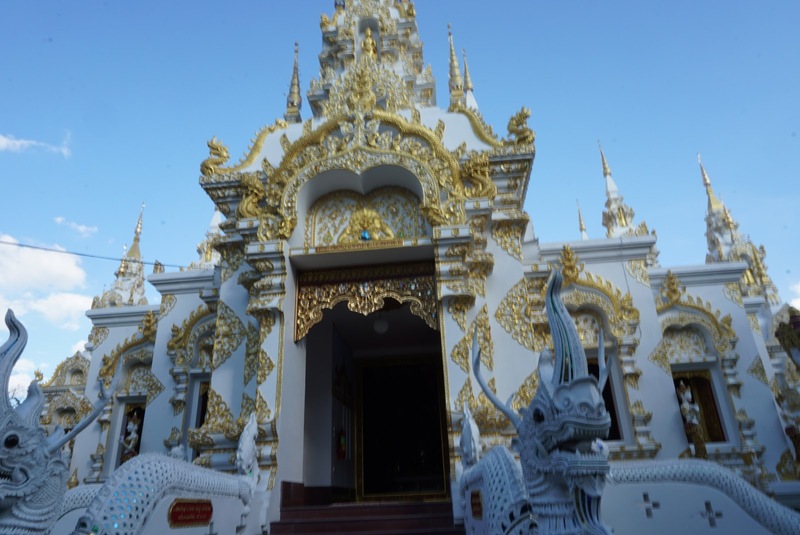 The temple is built in 1500 to serve as the main temple for a silversmith village. 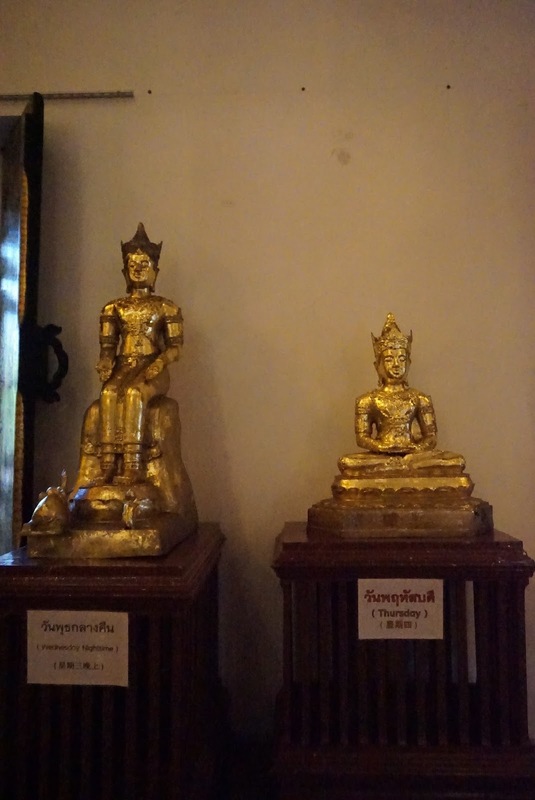 A couple of Buddha statues, one in silver and the other in gold, sits peacefully in front of the silver temple. 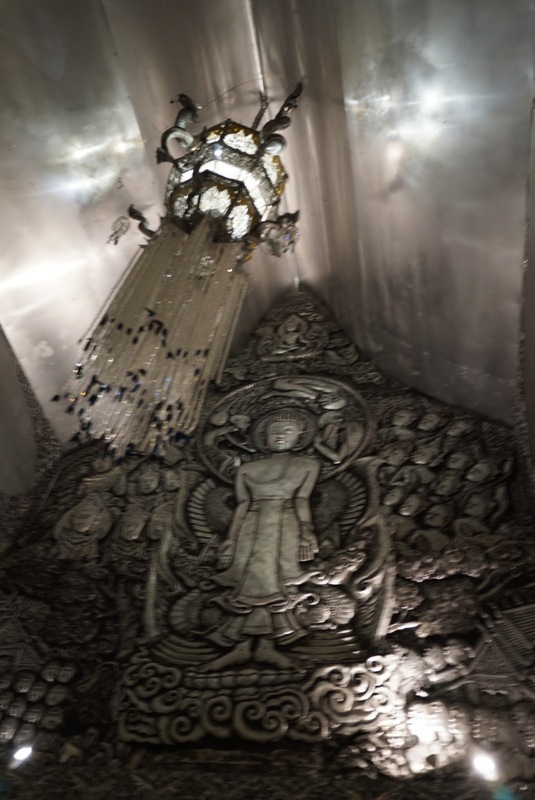 The entrance of the silver temple is guarded by 2 5-headed nagas. 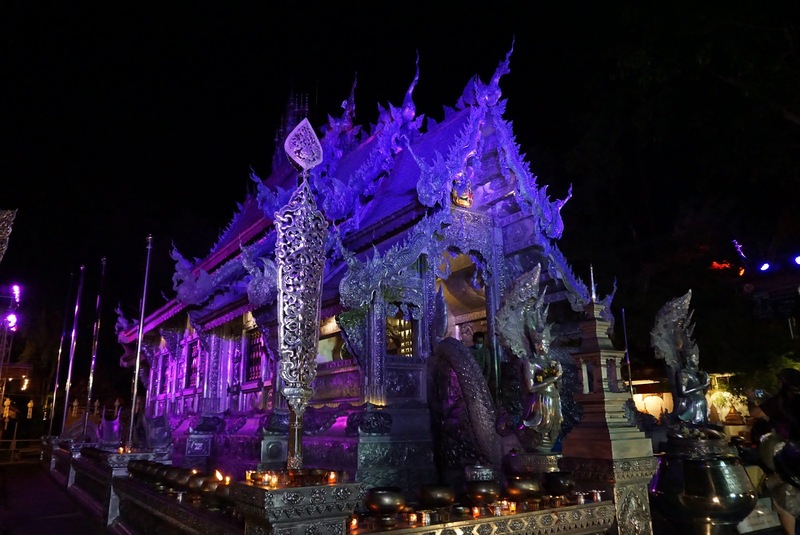 The temple is especially spectacular at night when the interchange colours are being cast onto the temple, giving it a mystical feel. 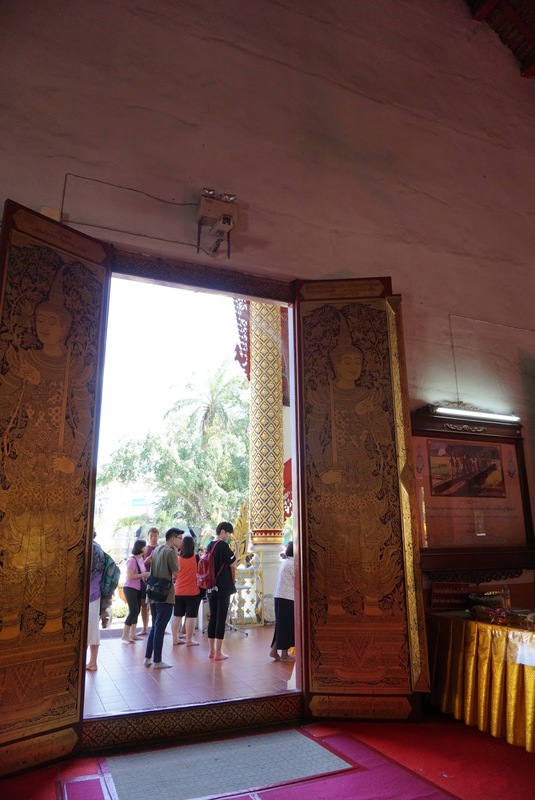 The temple is out of bounds to female visitors due to an old Buddhist rule. The work is impressive inside the temple. Traces of painstaking carvings in every panel can be seen. 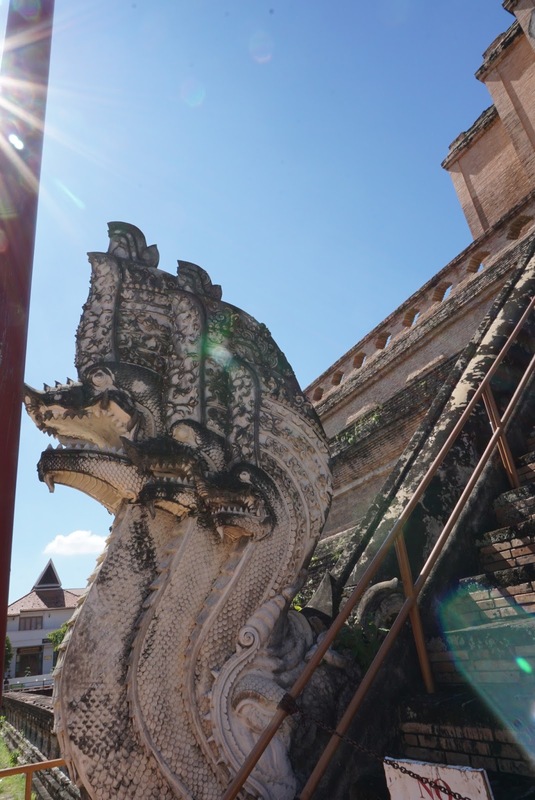 There are even carvings of the world map on the floor of the Wat Sri Suphan. 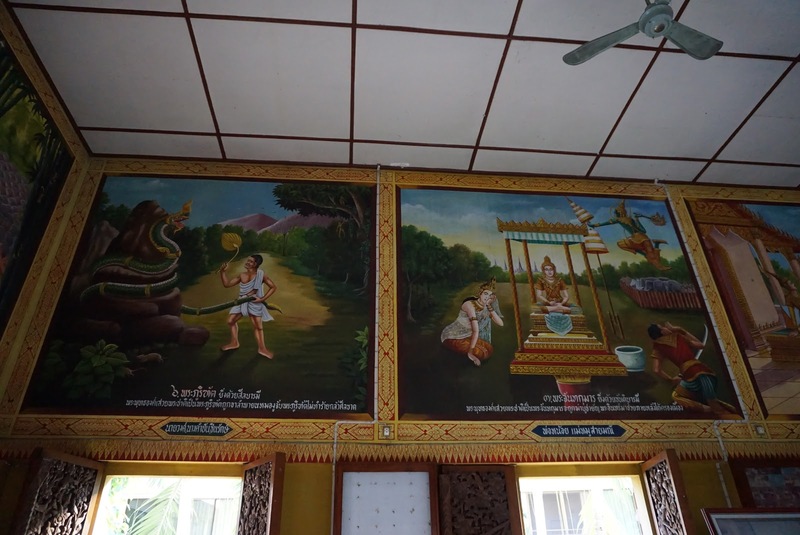 There are murals that depict Buddhism as well as the late Thai King. 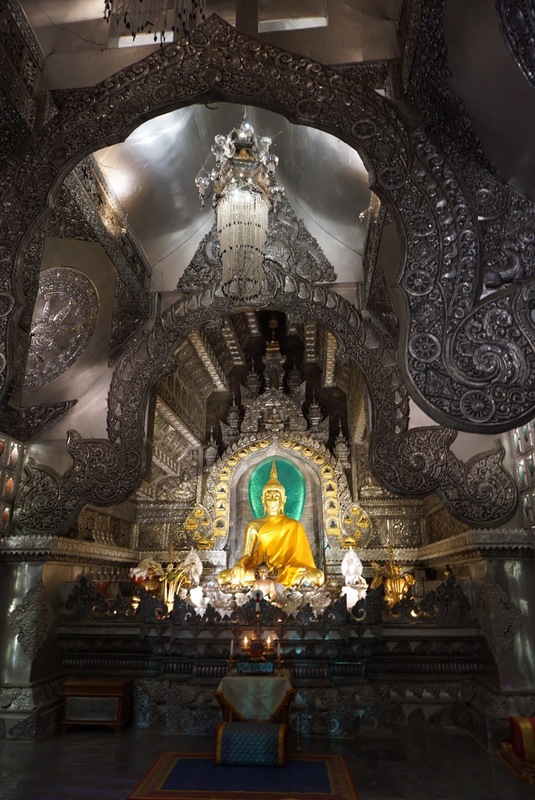 A golden Buddha statue sits in the temple, contrasting with the silver used in the construct of the temple. 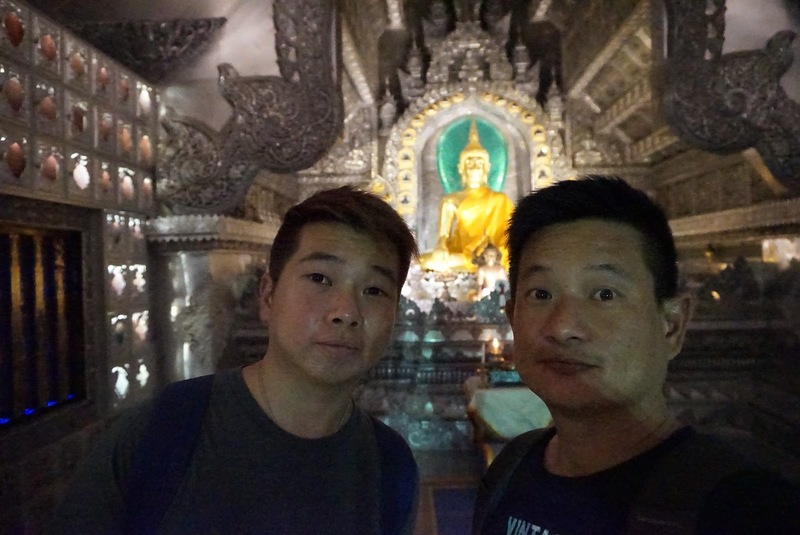 After visiting the temple, we traced back our footsteps back to the night market and shopped a little before heading back to the hotel to rest as it is almost midnight and the stalls are packing up, ending the day of sales. 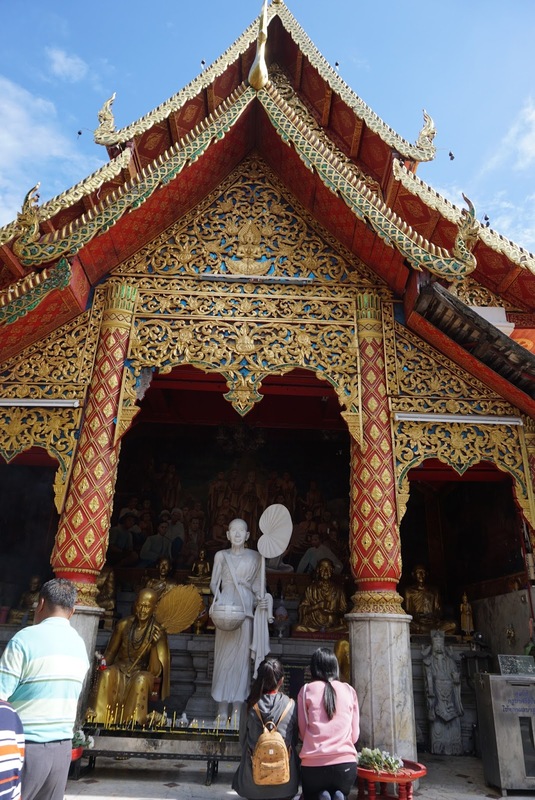 Visits to Chiang Mai is incomplete without a visit to their Temples. 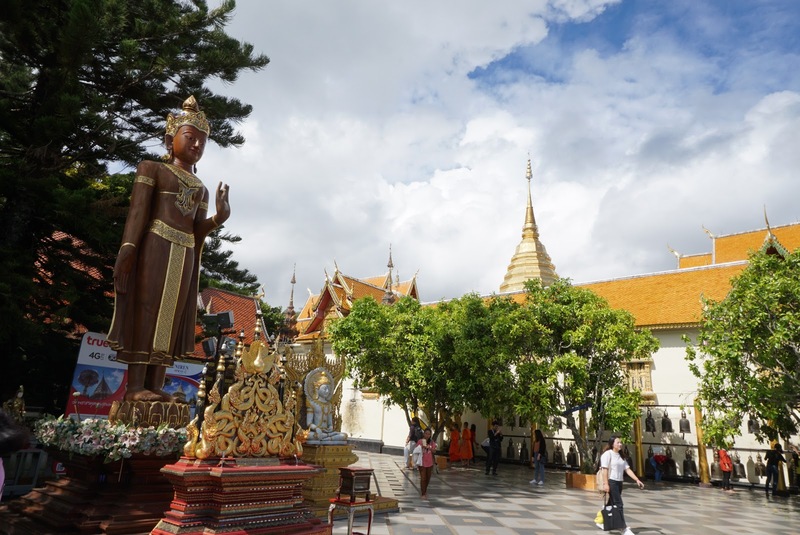 Apart from the “Big Four” Temples in Old City, Wat Phra That Doi Suthep is one of the most visited temples in Chiang Mai. 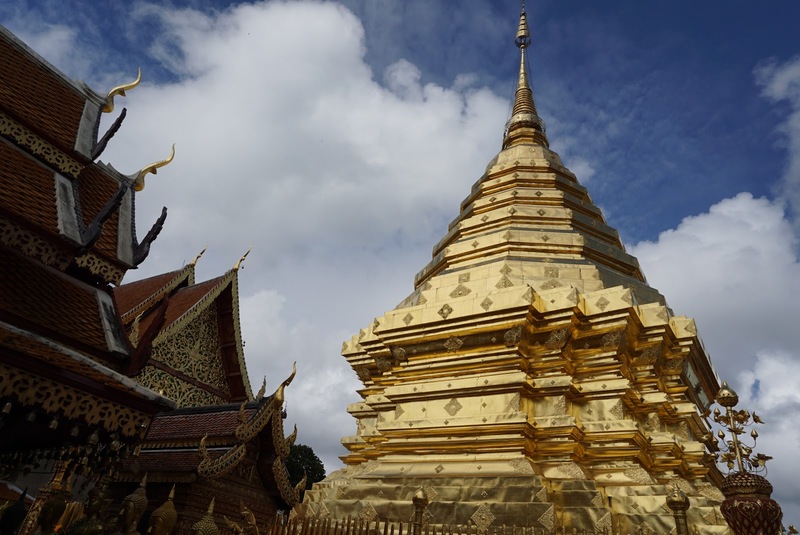 The Wat Doi Suthep sits on top of the mountain Doi Suthep, seemingly watching and protecting the city of Chiang Mai. 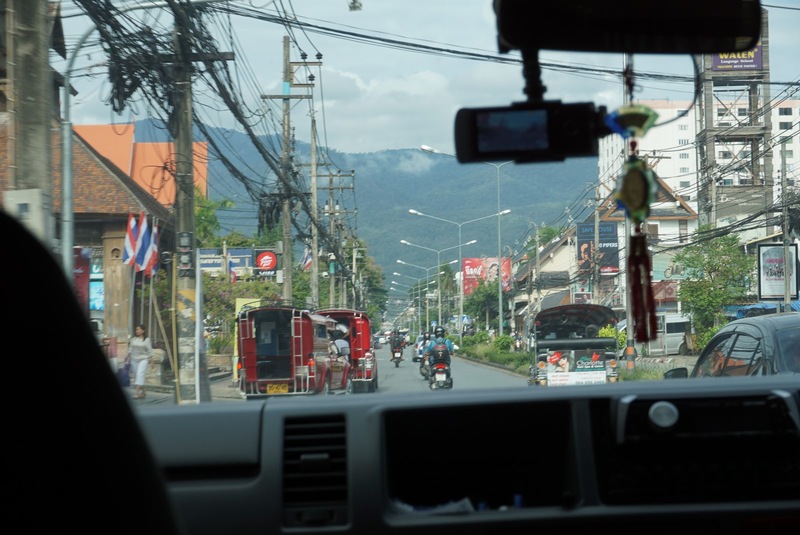 The journey from Chiang Mai city to the Wat Doi Suthep takes us pass windy mountainous routes where we saw a glimpse of the city resting on the plains at the foot of the mountain. 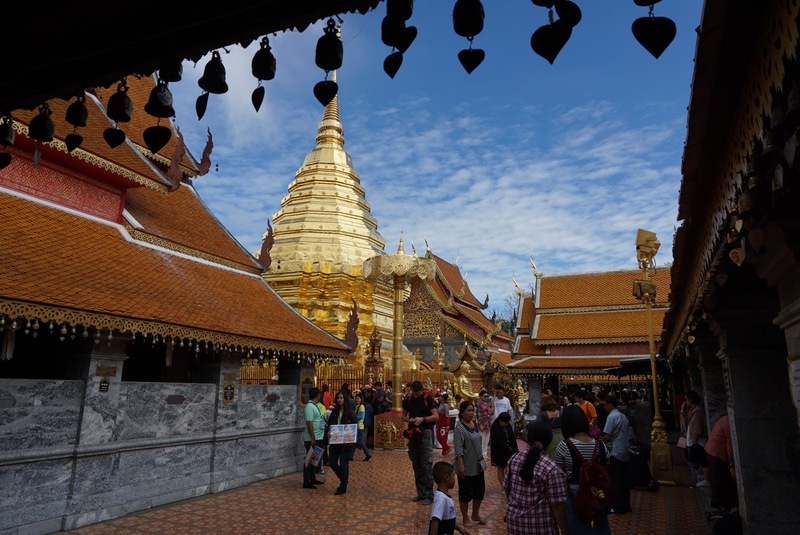 Wat Doi Suthep is perched on top of 309 stairs. 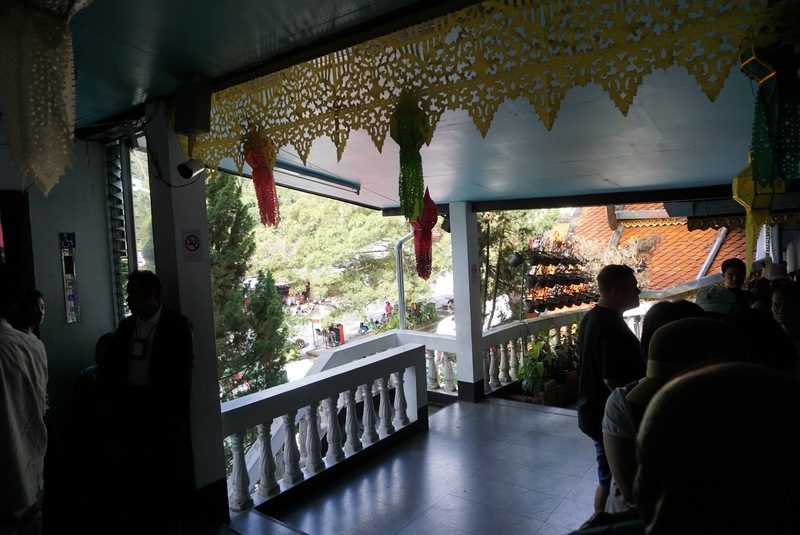 There is a tram service that ferries visitors to the top of the slope where the temple sits in around 5 mins. 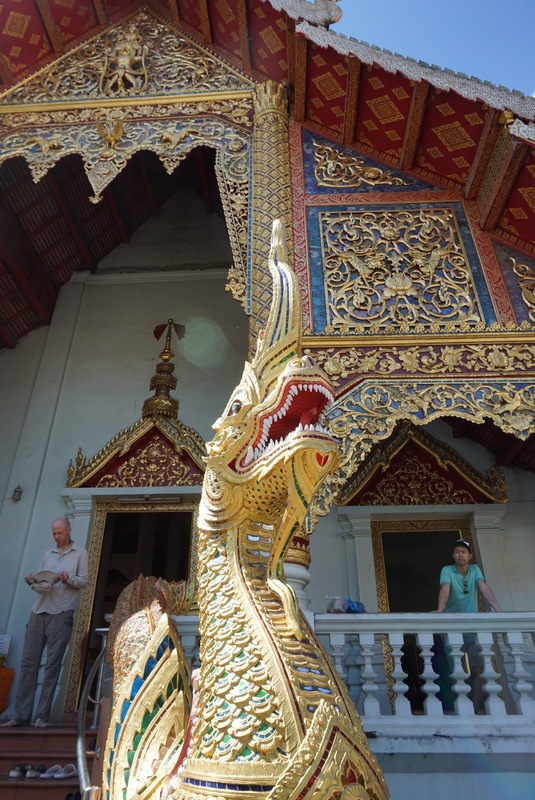 Wat Doi Suthep’s facade itself looks like a work of art. 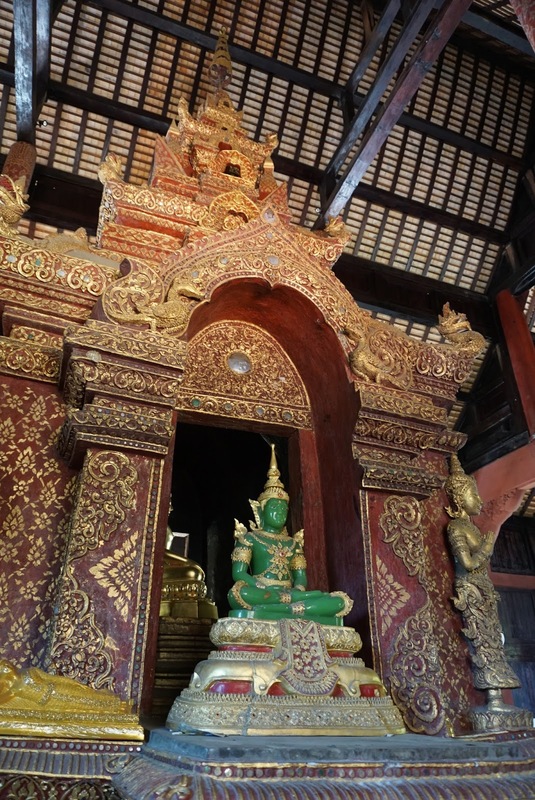 Decked with red, green and gold paints with intricate carvings, the layer roofed tall and slim structure that surrounds the temple is portrays distinctive Thai-style architecture. 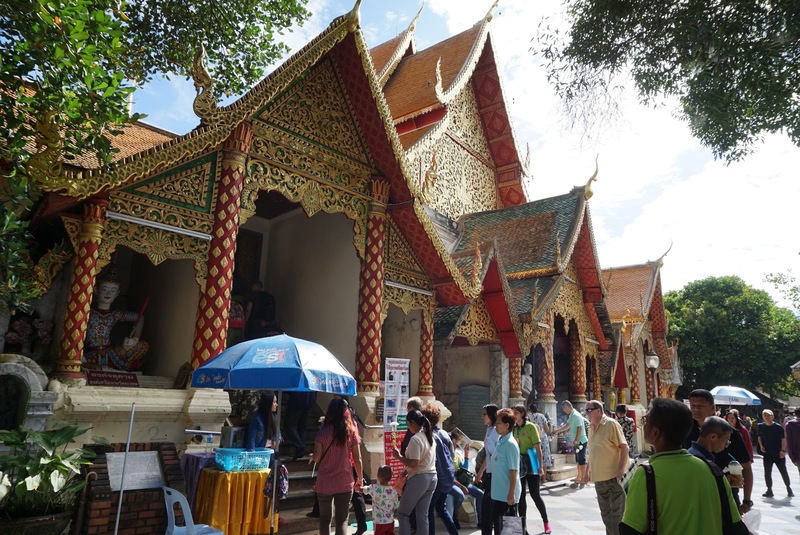 Like all other Thai temples, visitors are required to remove their footwear before entering the temple. 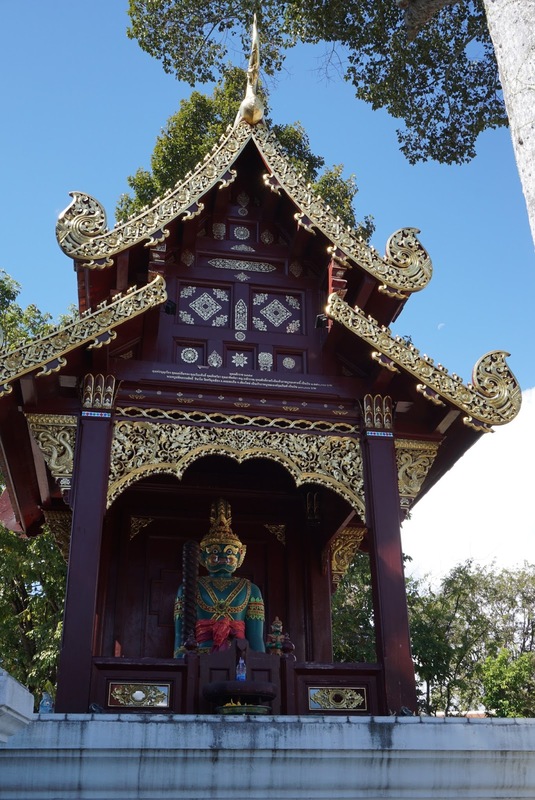 Unlike most of the Thai temples that I have visited throughout the years of my visit to Thailand, the temple grounds of Wat Doi Suthep is mostly outdoors. 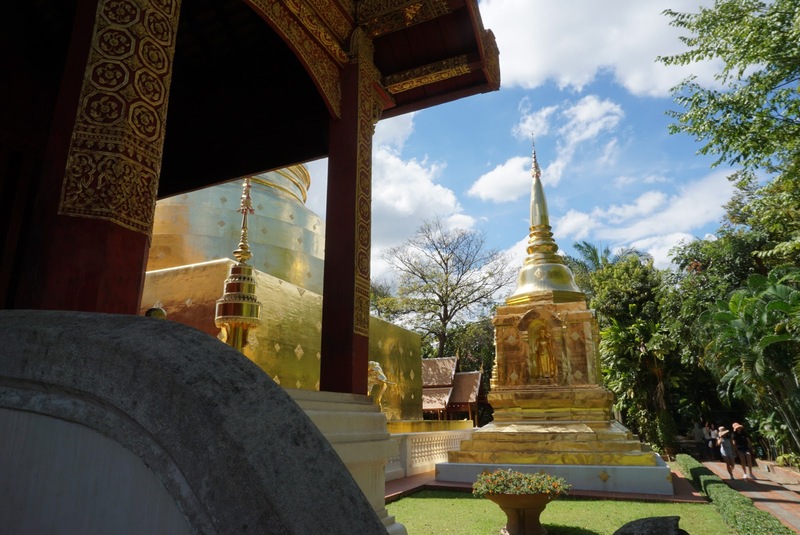 Passing through the outer walls of the temple, a large golden stupa lies in the centre of the temple grounds. The stupa is surrounded by 4 prayer halls, each in one direction. 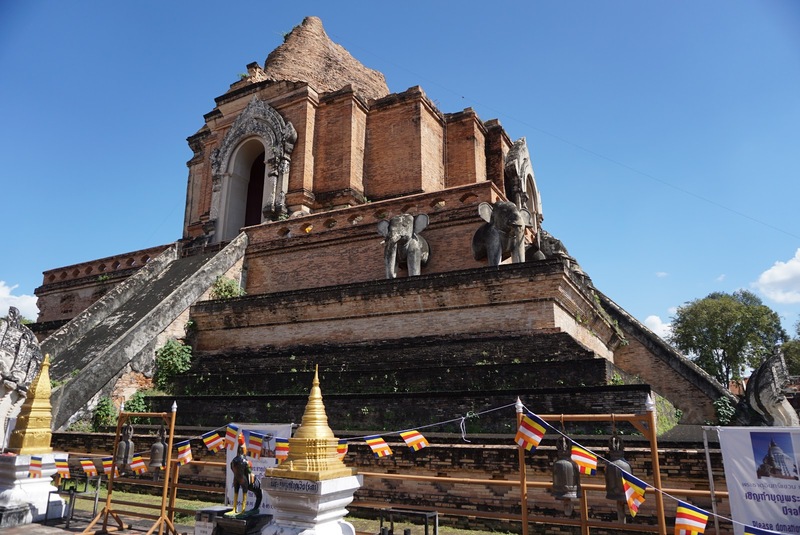 It is believed that the Buddha’s bone that the white elephant brought to this piece of land is buried under the stupa. The stupa has been fenced up, devotees are seen walking 3 times around the stupa chanting some sutra (which is available in English and Chinese other than Thai) at the same time. 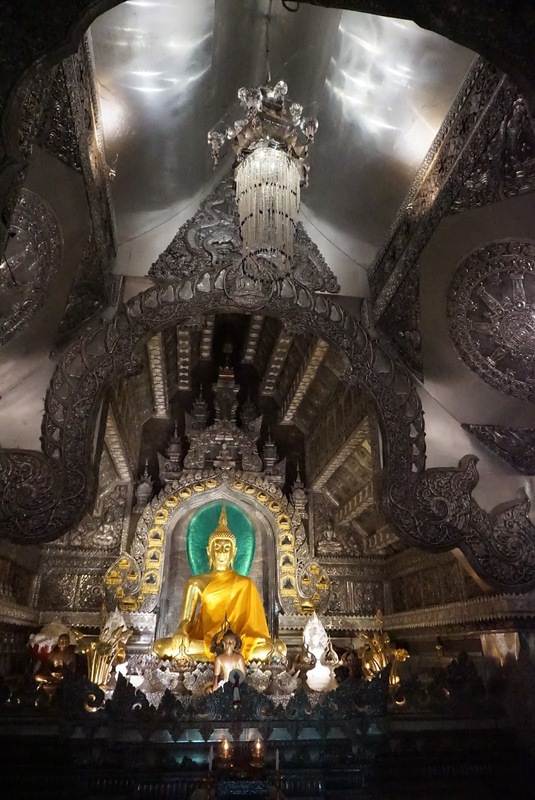 Statues of Buddhas decked in white stone, golden paint and green glass are placed around the parameters of the walkway. 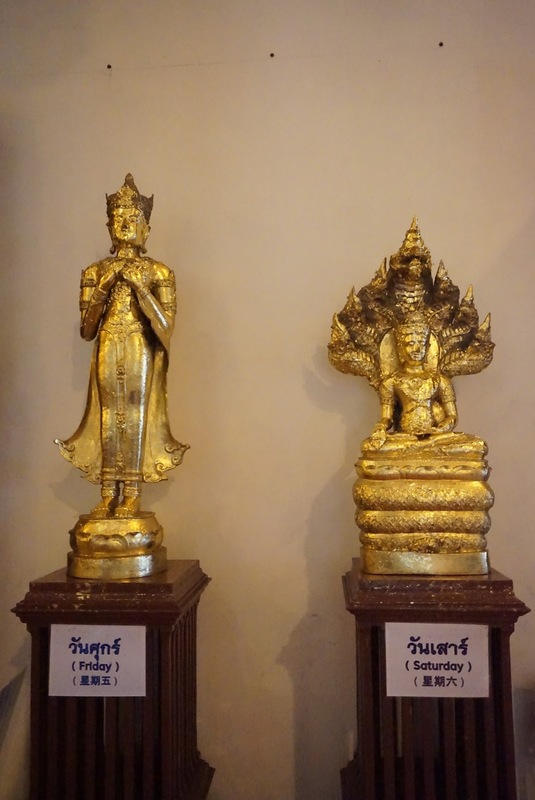 One can choose either of the 4 sides to pray to the Buddha in Wat Doi Suthep. 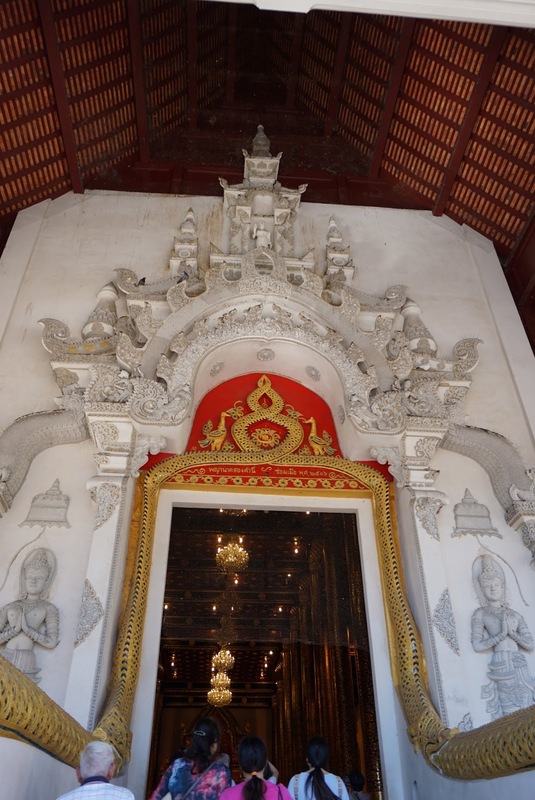 The main prayer hall, or wiharn, is next to the main entrance of the temple. 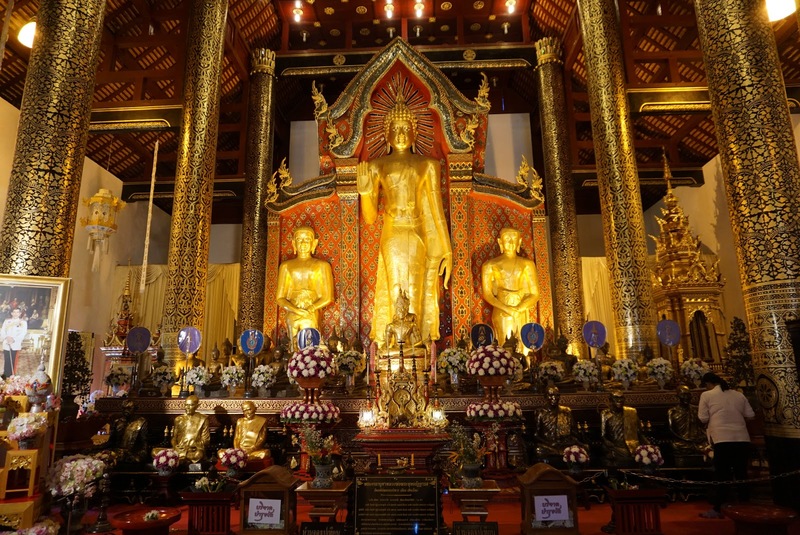 This is the largest wiharn with several golden statues of Buddha placed in front of an elaborately painted wall. 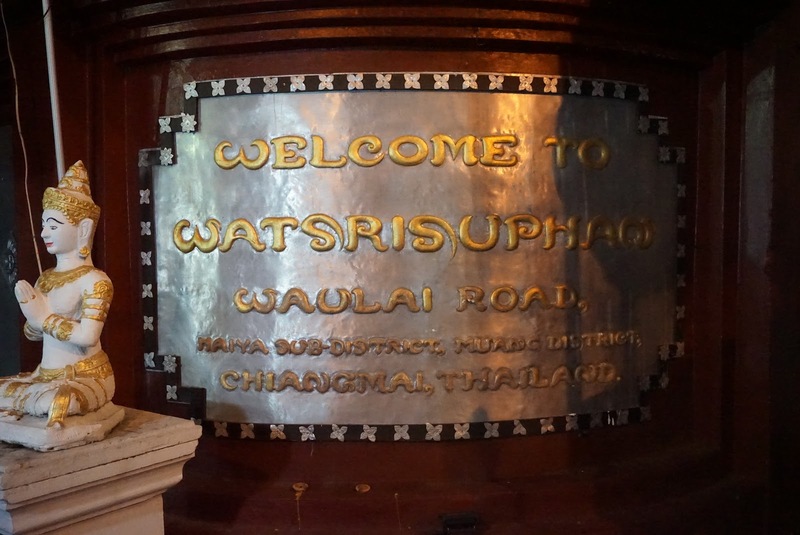 A smaller wiharn is situated opposite the main wiharn, where only 1 buddha statue is housed. 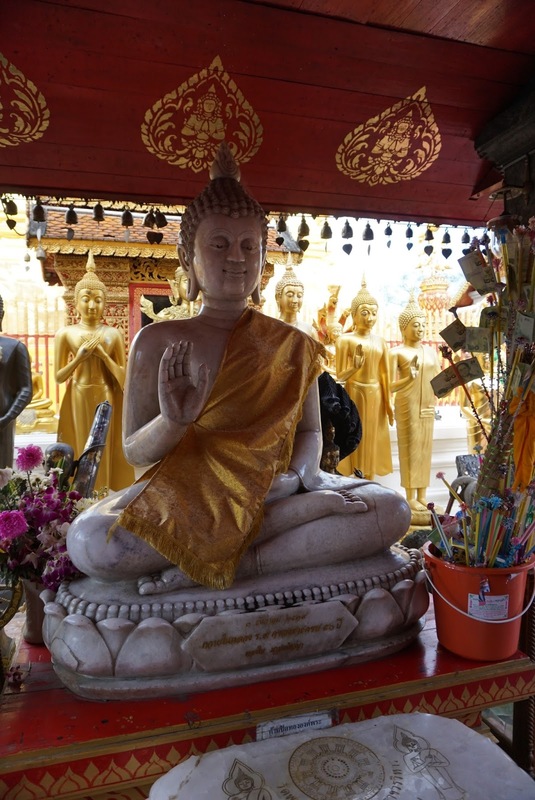 One can obtain blessings from the temple monk in either of the wiharns. 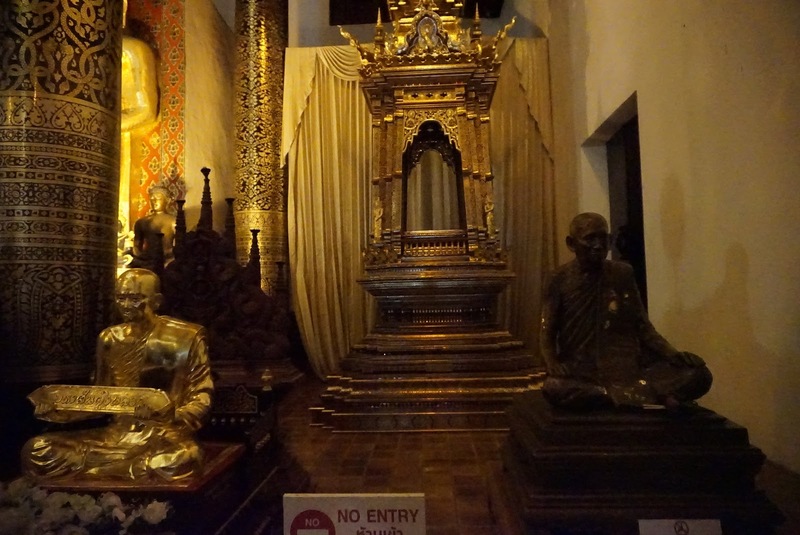 On either side of the wiharns are smaller shrines where statues of Buddhas, enclosed in glass panels. 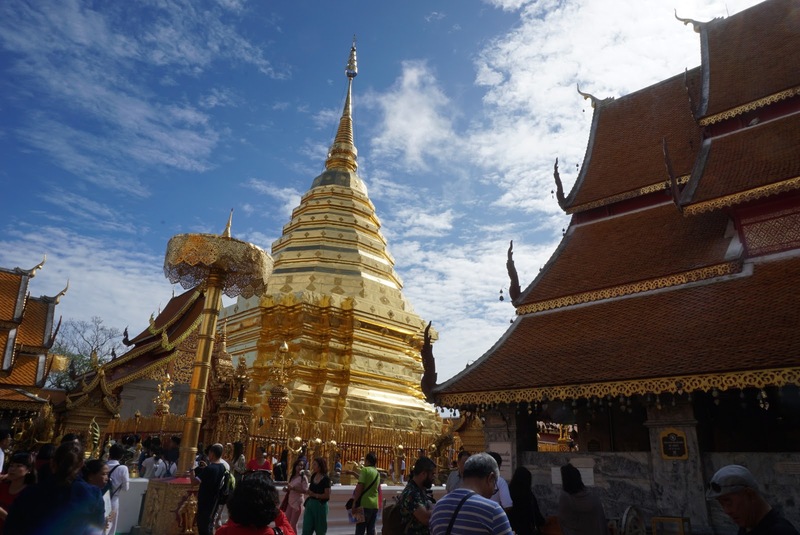 There are numerous spots for photo taking of the iconic golden stupa that defines Wat Doi Suthep. Most of the visitors are here to take the iconic pictures. 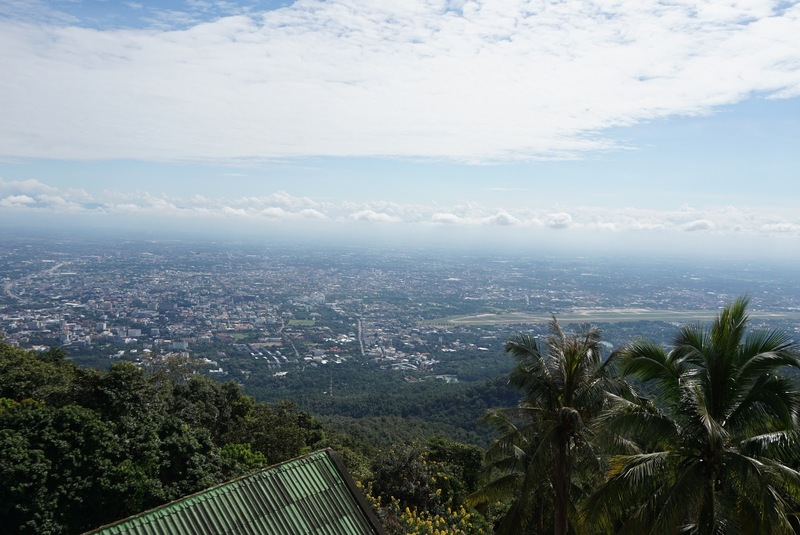 As Wat Doi Suthep is situated on Doi Suthep, we headed for the viewpoint at the back of the temple, that granted us views of Chiang Mai city. 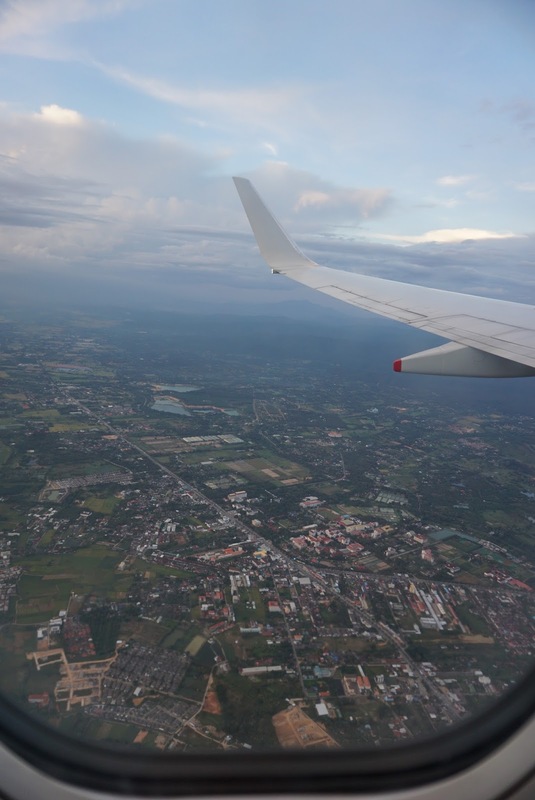 At the first viewpoint, we saw Chiang Mai International Airport and parts of Chiang Mai city. 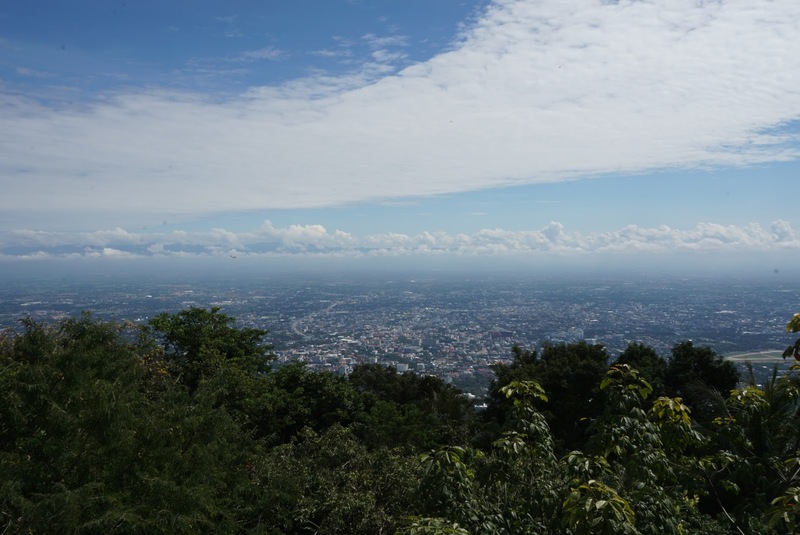 A little further from the first viewpoint is another viewpoint where we saw the entire Chiang Mai city. Both viewpoints offer great photo spots for visitors. 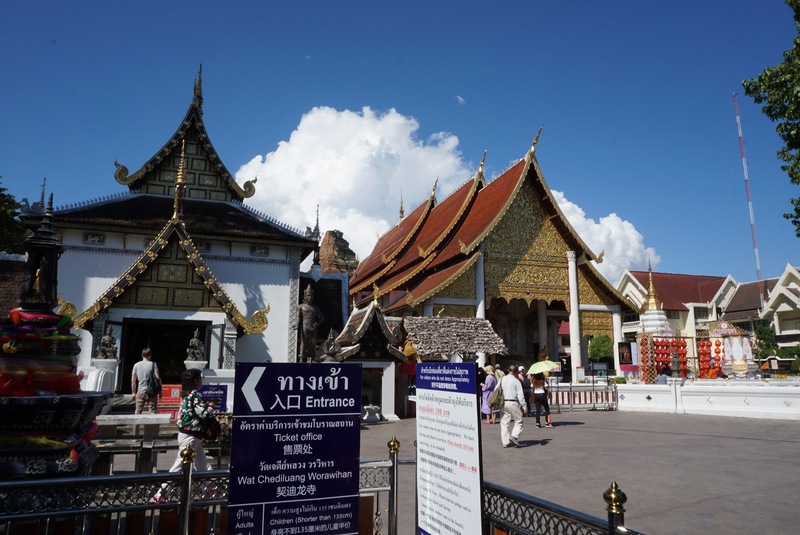 Leaving Doi Suthep, we headed to the nearby Wat Phra Singh, located in the western part of the Old City. 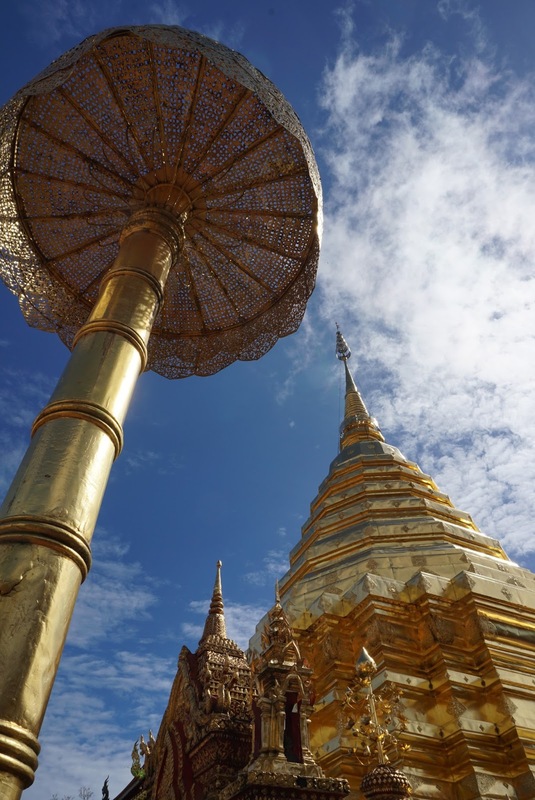 Wat Phra Singh is a temple typical of Lanna art and architecture. 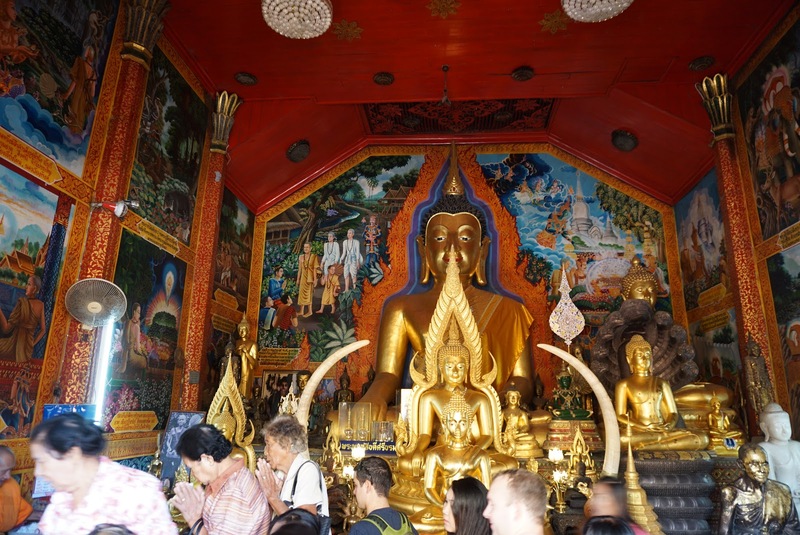 Wat Phra Singh is a temple dedicated to the Lion Buddha. 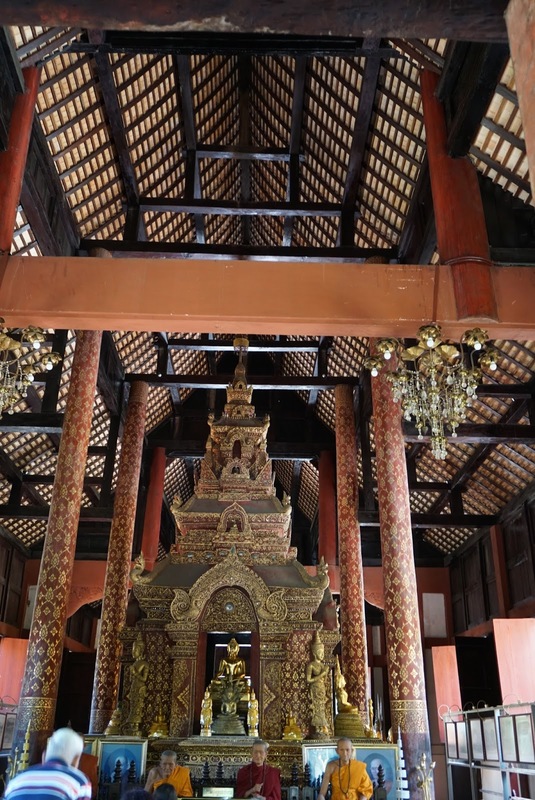 A Lanna styled and rather new large 3-layer roofed temple structure sits facing the main entrance to the temple greeting visitors. 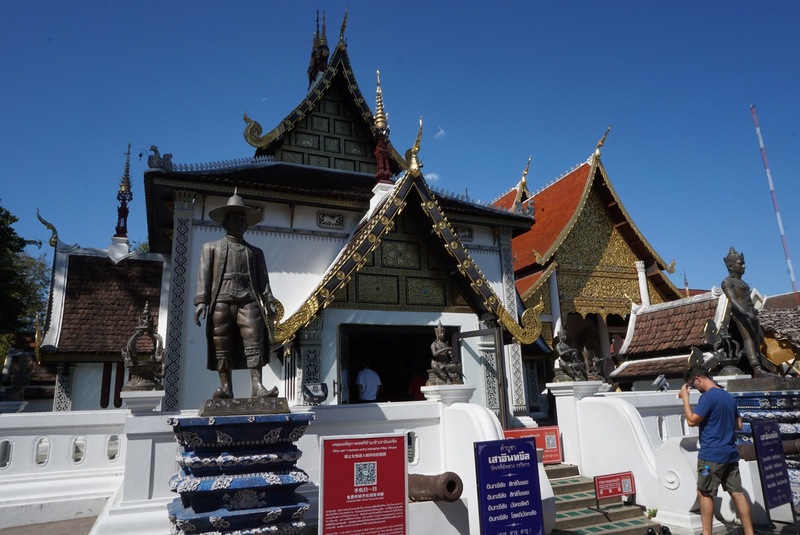 Most visitors would stop by this temple building during their visit to Wat Phra Singh. 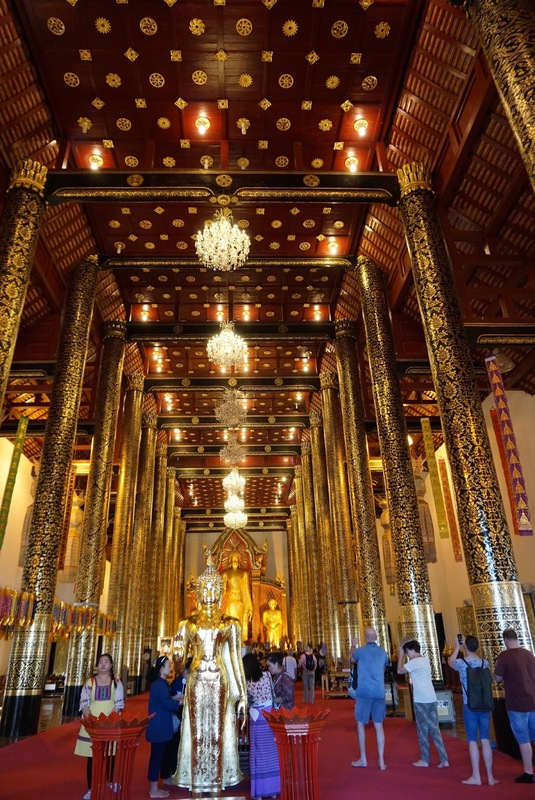 The decor inside this temple building exudes simple yet revered feel. 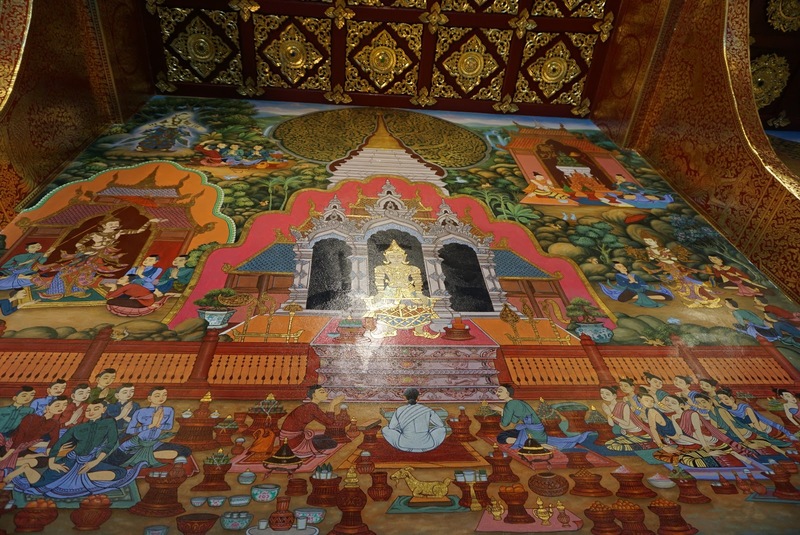 There are no elaborated paintings on its walls, nor detailed carvings inside this temple building. 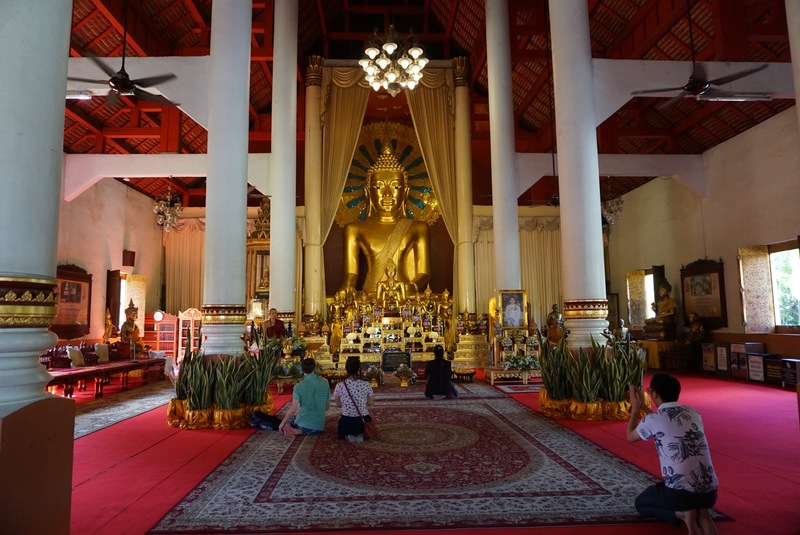 At the end of the building, a large Buddha statue sits solemnly, seemingly welcoming visitors offering their prayers. 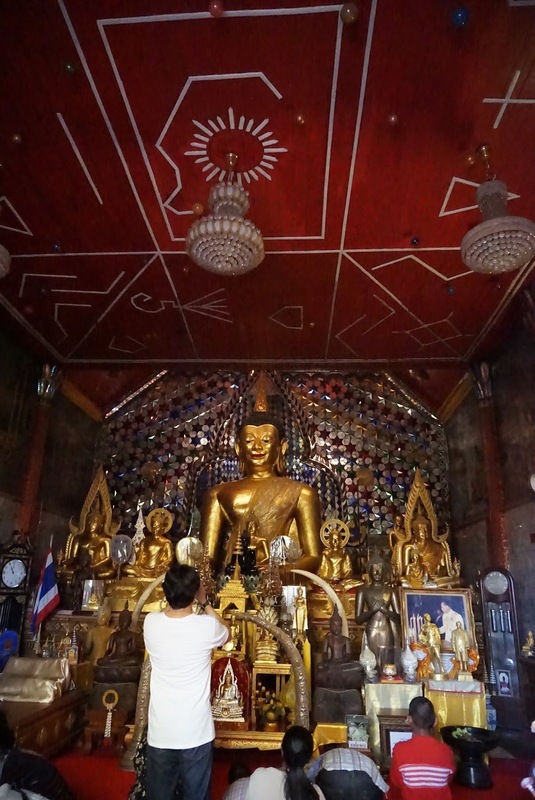 Next to this Buddha statue are several wax figurines of past abbots of Wat Phra Singh. 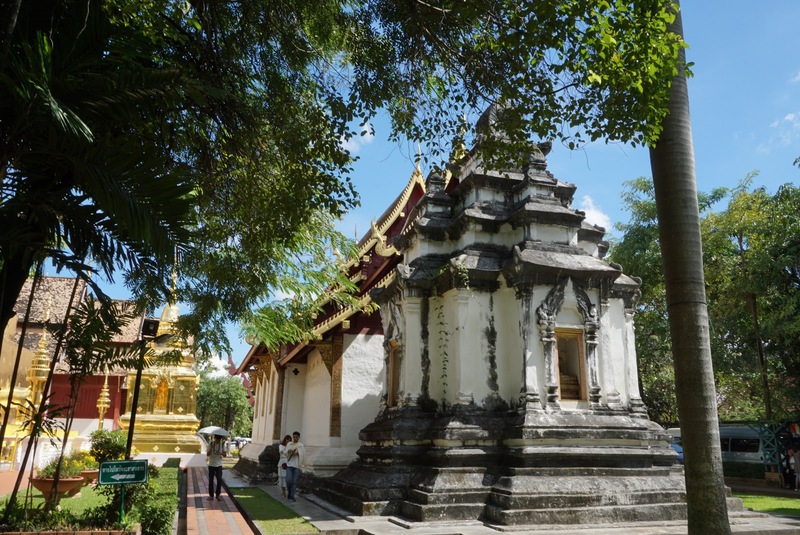 The treasure of Wat Phra Singh is not housed in this building, but in a less elaborated building further into the temple grounds. 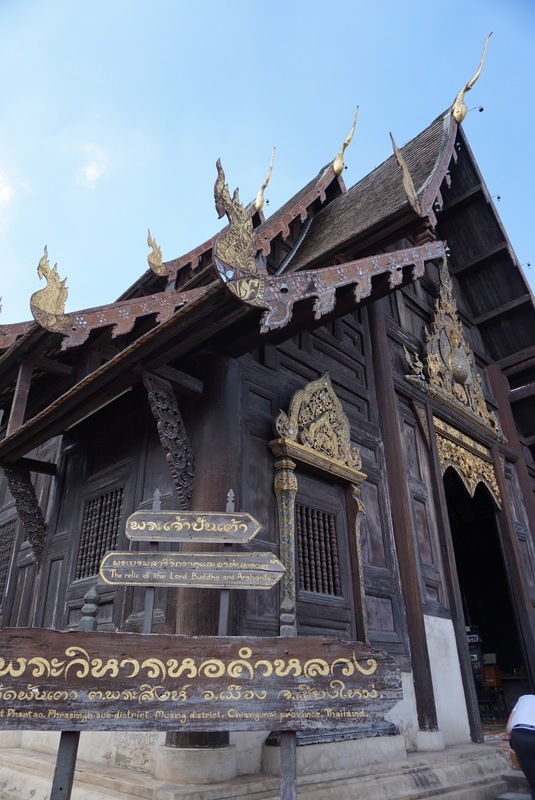 Behind the main temple building is a small inconspicuous wooden building, the Ubosot, used for the ordination of monks. 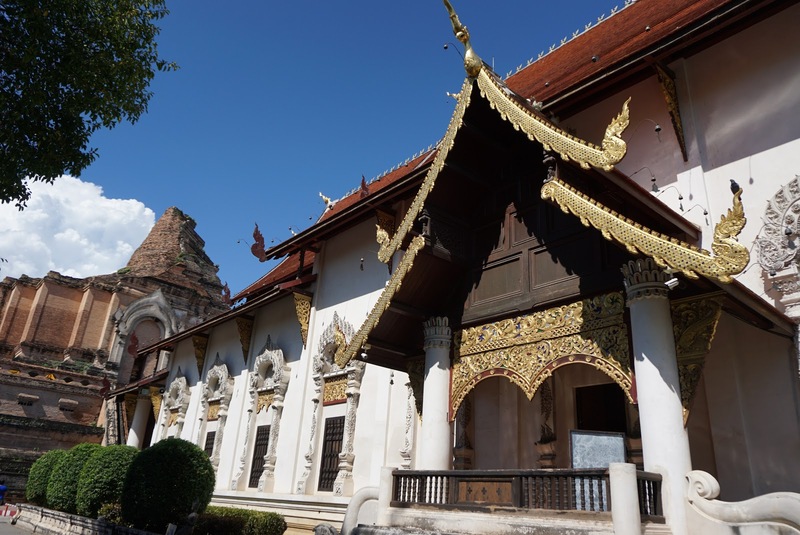 Built in 1806, this simply decorated building but richly decorated with wooden carvings, houses a smaller image of the Lion Buddha and a replica of the famed Emerald Buddha (now housed in the Grand Palace in Bangkok). 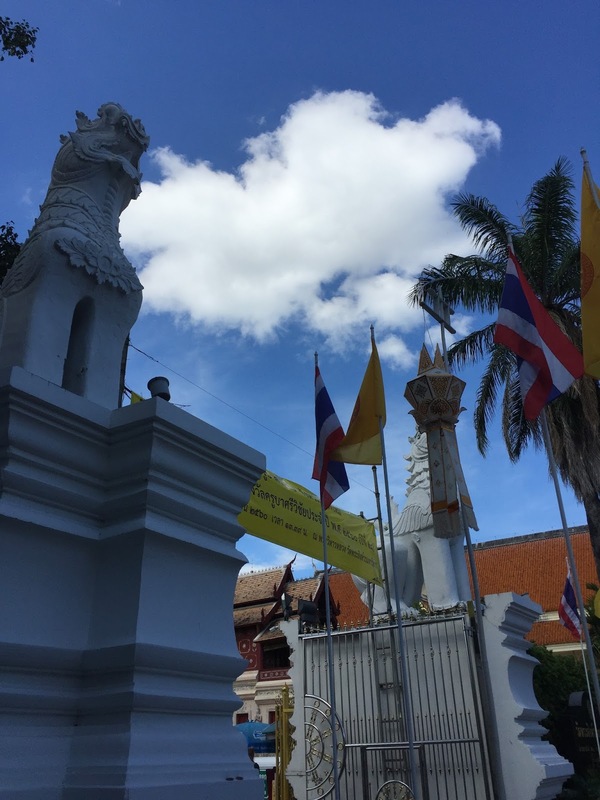 It is hard for anyone visiting Wat Phra Singh to miss the large Chedi beside the Ubosot. 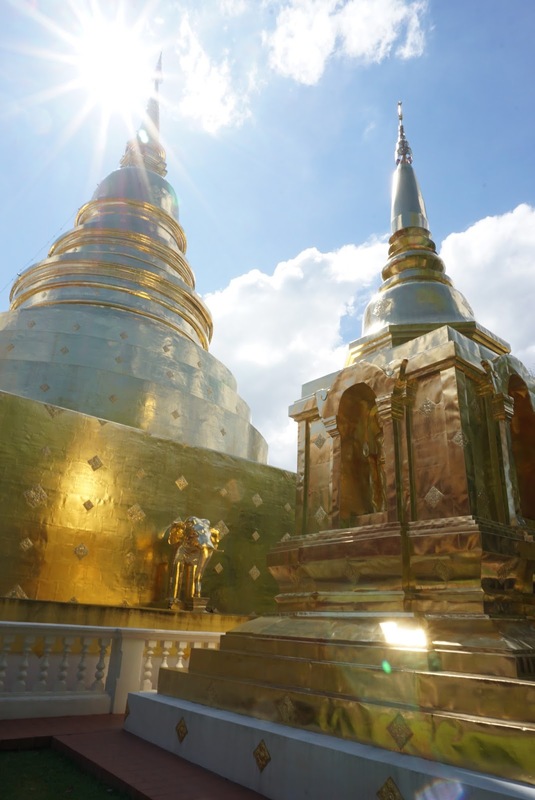 The golden stupa that stretches towards the sky, sits on a square base with images of elephants protruding out of the each of the sides of the square base. 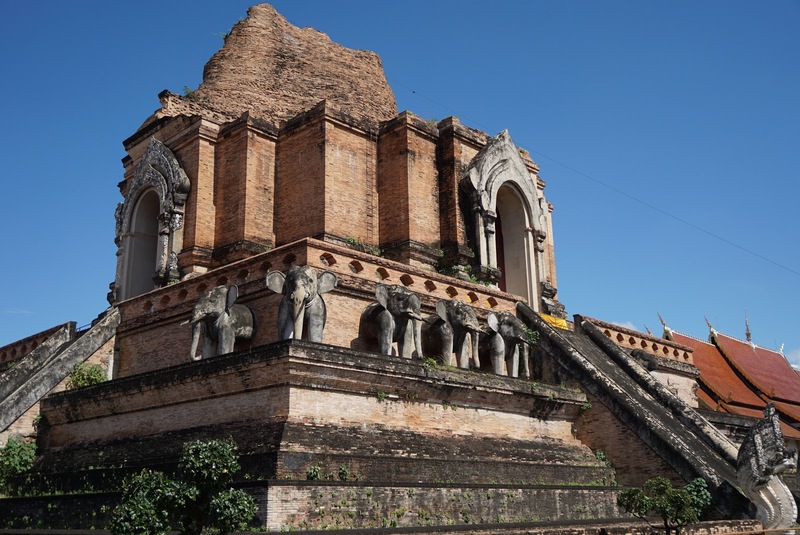 It seems like these elephants are carrying the chedi on their backs. 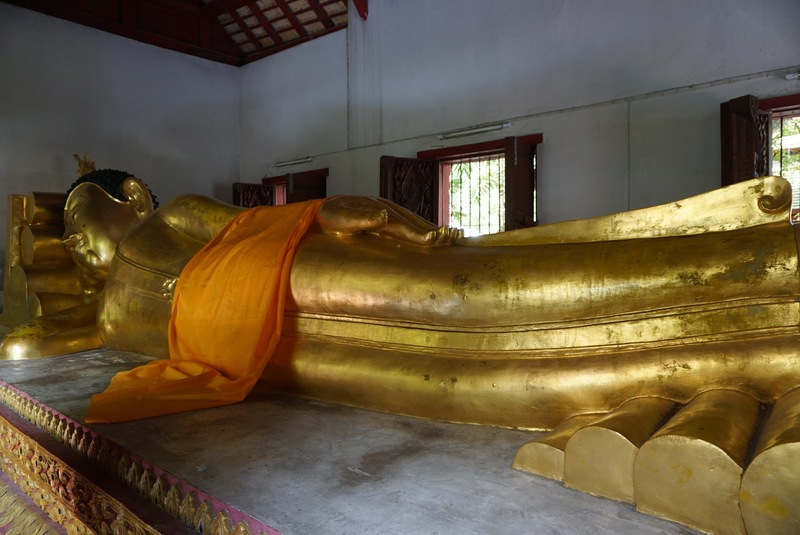 A statue of the sleeping Buddha, housed in a very simple small building at the back of the temple grounds. 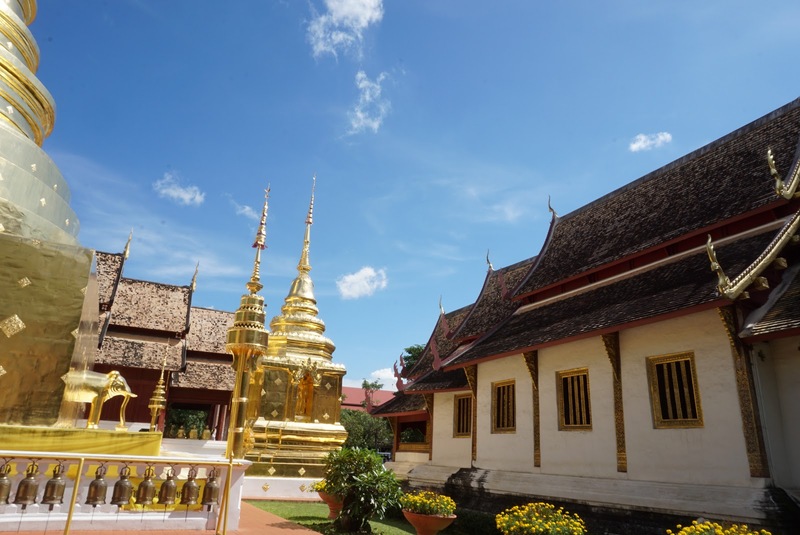 The treasure of Wat Phra Singh is housed in a very inconspicuous building tucked at the back of the temple grounds next to the golden chedi. 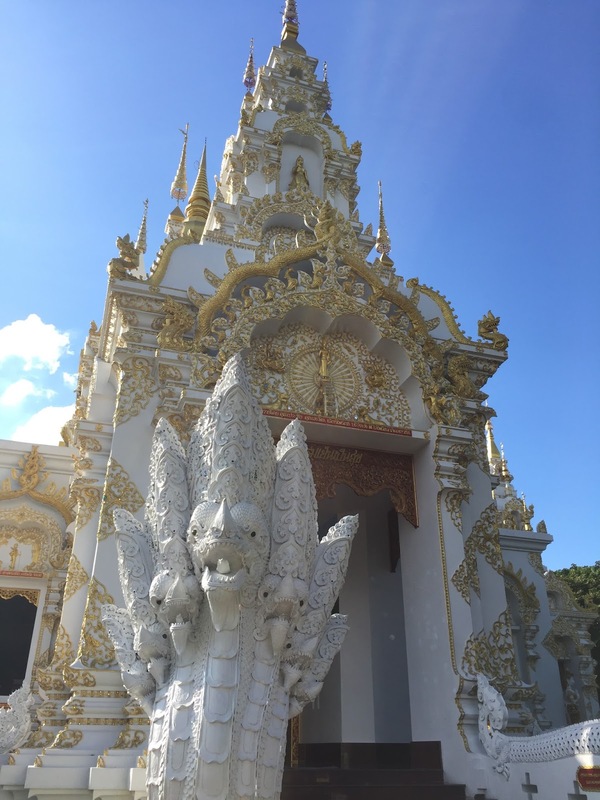 This white building is where the exalted statue of Lion Buddha rests since the 1360s. It is easy to miss out on this building. The third temple that we visited today is a local temple, with literally no foreign visitors. 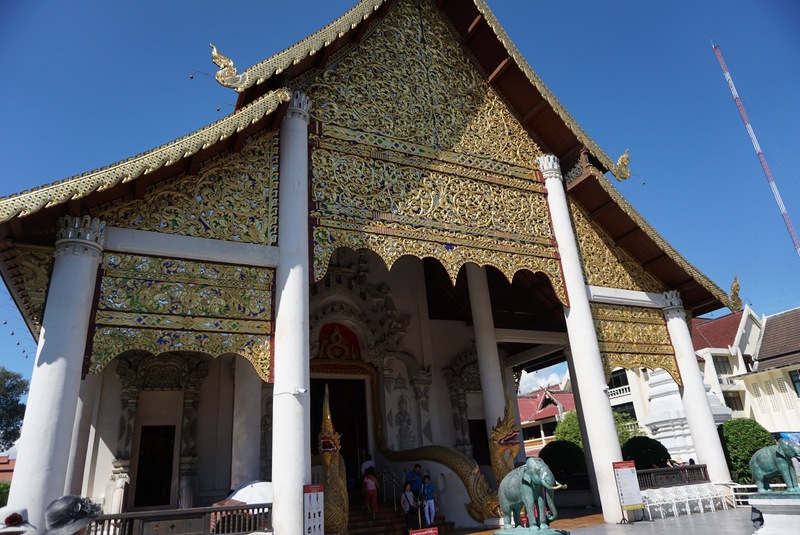 Unlike the previous 2 temples we visited so far, Wat Sri Don Moon does not charge entrance fees. 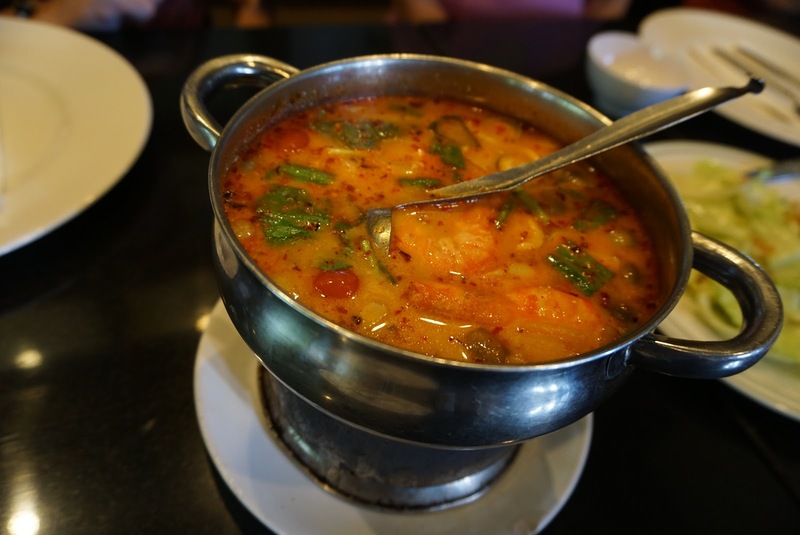 On our way to Wat Sri Don Moon, stopped at a Thai restaurant for lunch. 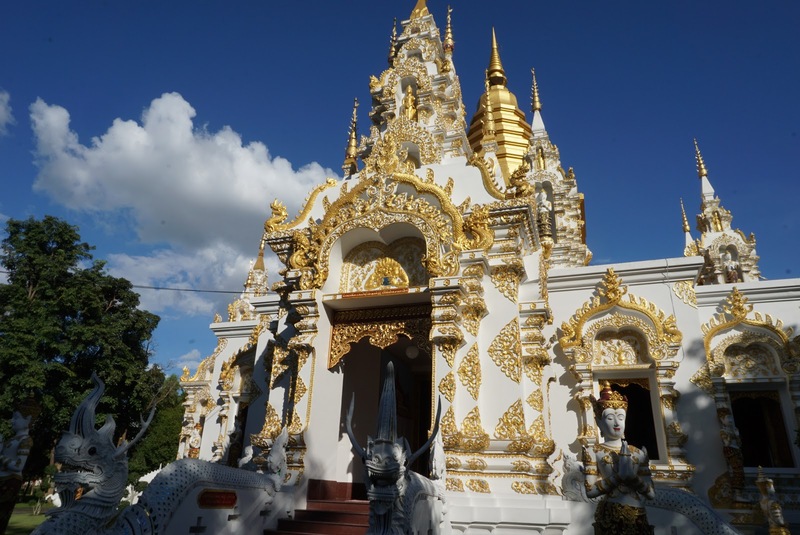 Wat Sri Don Moon is located southeast of Old City and is about 30 mins drive from Old City. 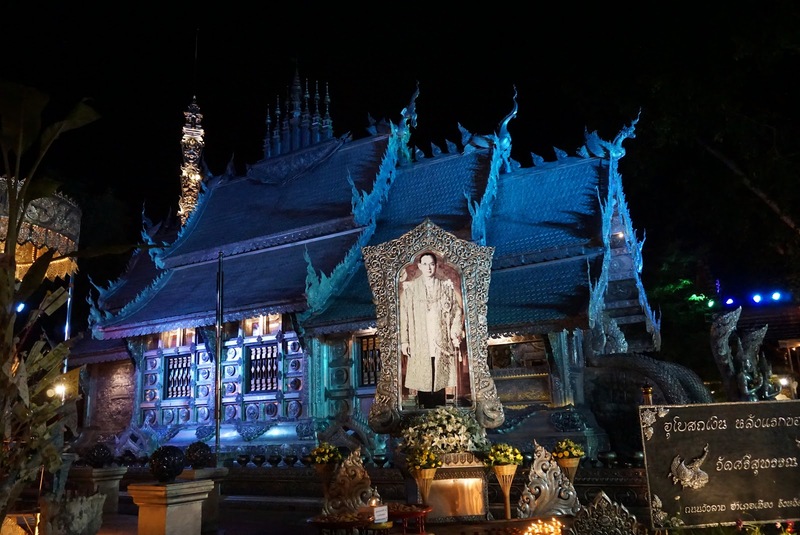 This temple can easily be missed by visitors to Chiang Mai as it is located in a remote part of the city. 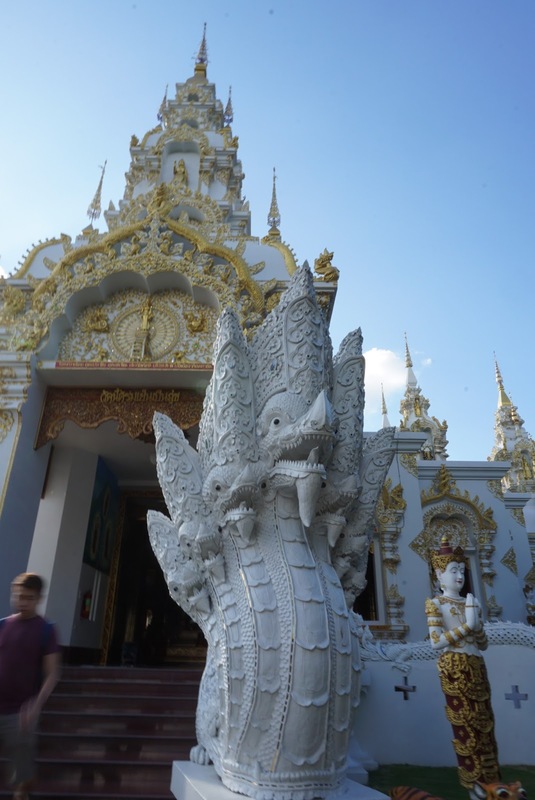 Wat Sri Don Moon is an all-white temple from the structure to the roof of the temple building. 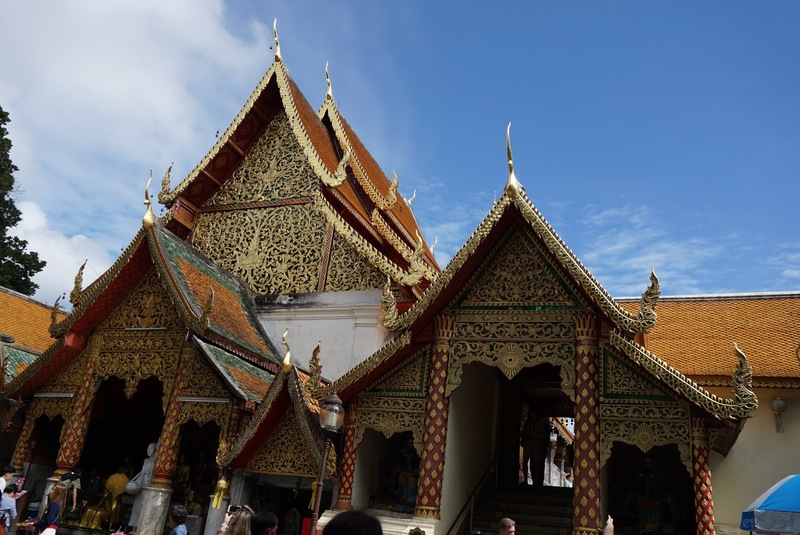 Unlike the temples we have visited so far, there is no layered roofing in Wat Sri Don Moon. 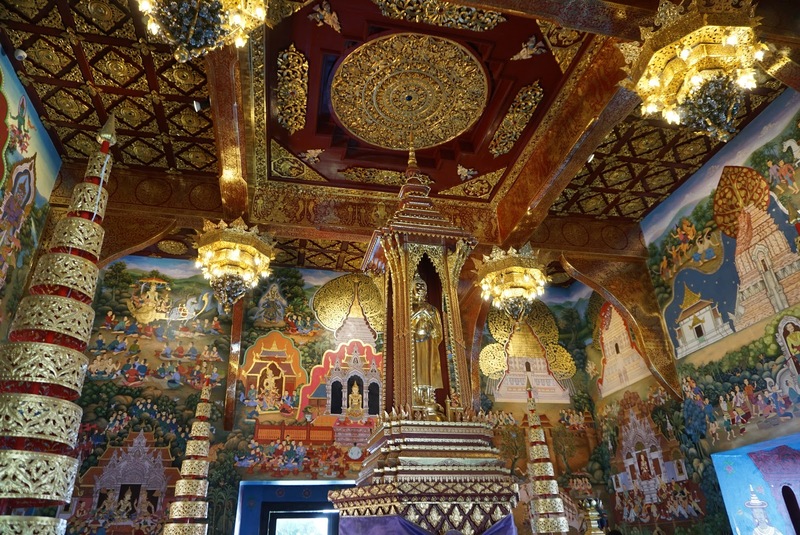 Instead the roof of this temple building is painted in gold, giving the temple a unique look. 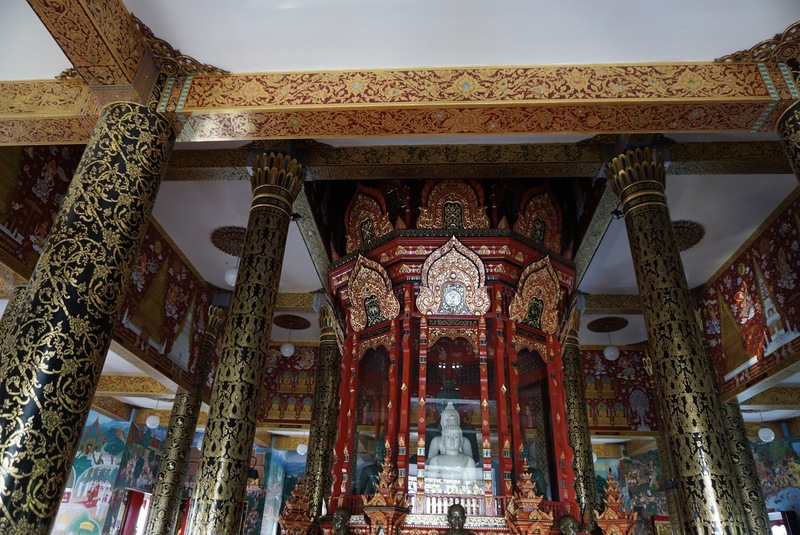 The interior of Wat Sri Don Moon is decked with colours of all hues, unlike its exterior. Inside the temple houses 2 statues of white Buddha, enclosed in a glass case. 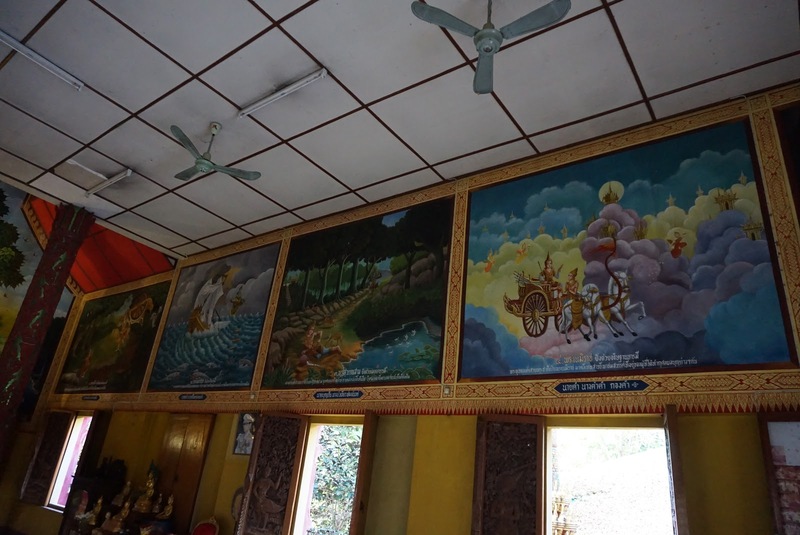 What attracts me most in this temple is the artwork painted on the walls of the temple. 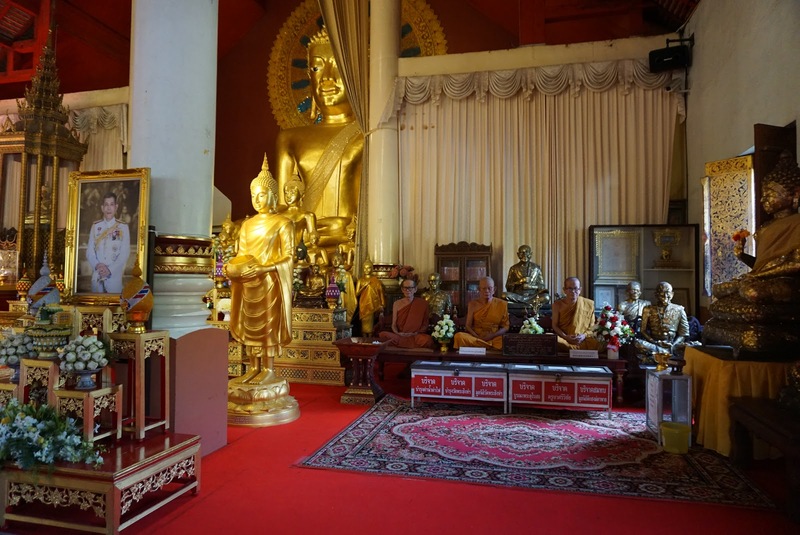 The paintings seem to relate the life of Buddha and how he attained nirvana. 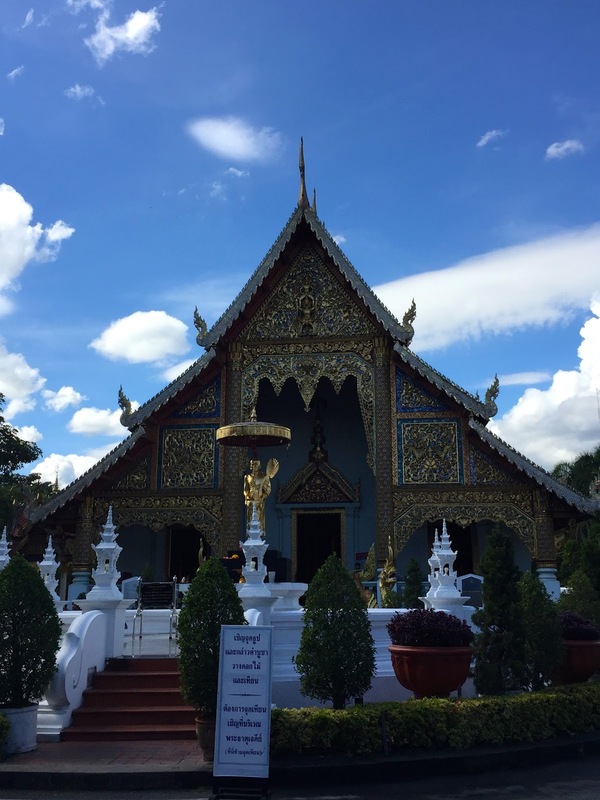 Perhaps due to the lack of visitors, Wat Sri Don Moon appears to me as more serene and peaceful. We headed back to the hotel to rest and have dinner before ending our day with shopping along the night bazaar just outside the hotel we stayed. 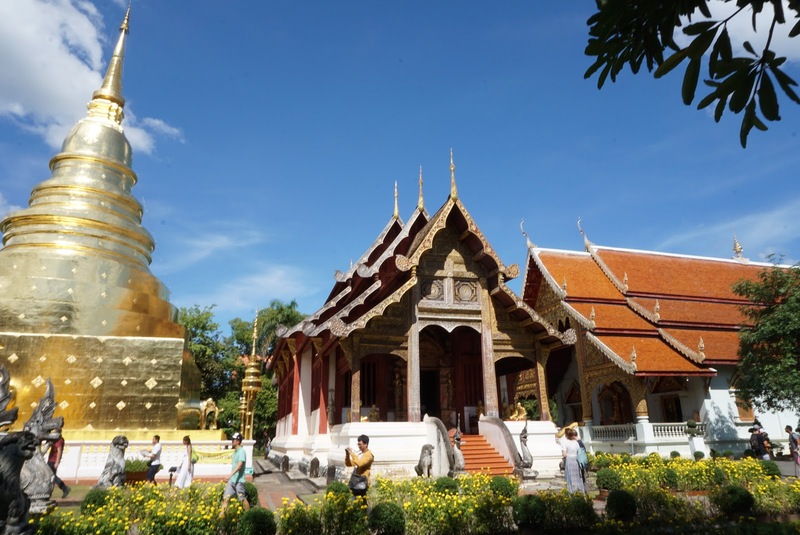 Chiang Mai is the second largest city in Thailand and is the northernmost city in the country. 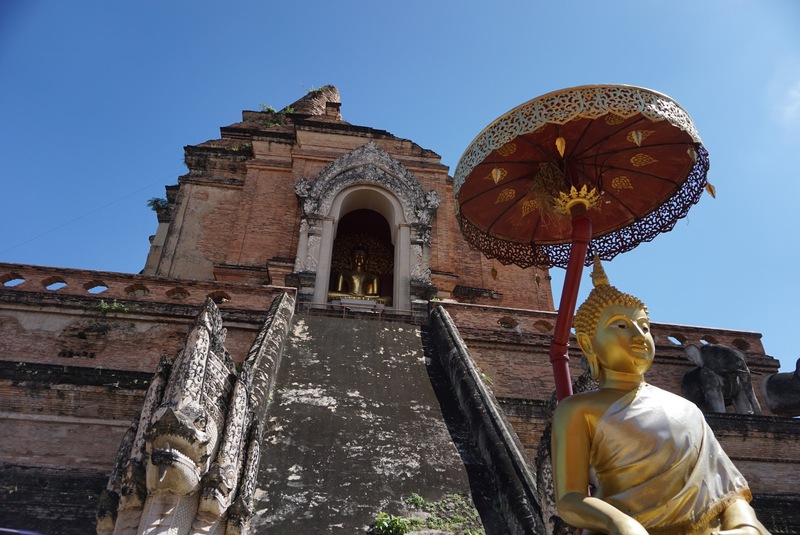 Chiang Mai used to be the capital of Siam, the old name for Thailand before the capital shifted to Ayuthaya and subsequently to the current city of Bangkok. 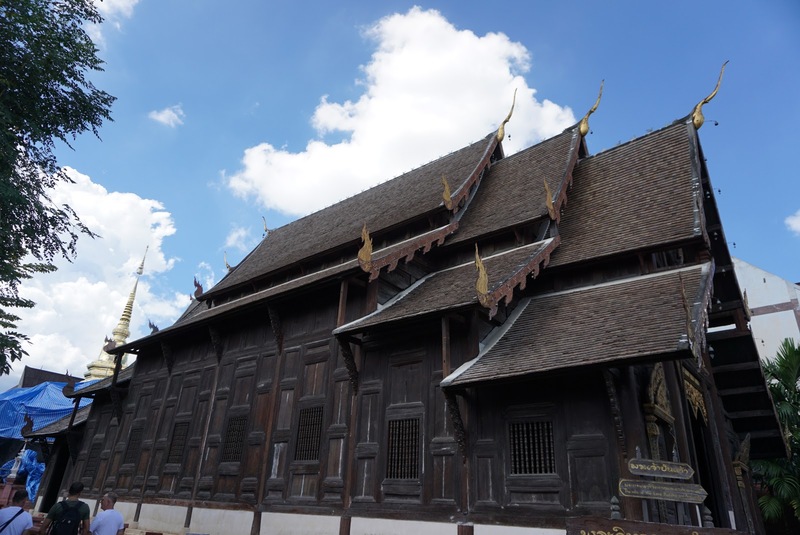 Chiang Mai is full of historic sites, mainly Thai temples. 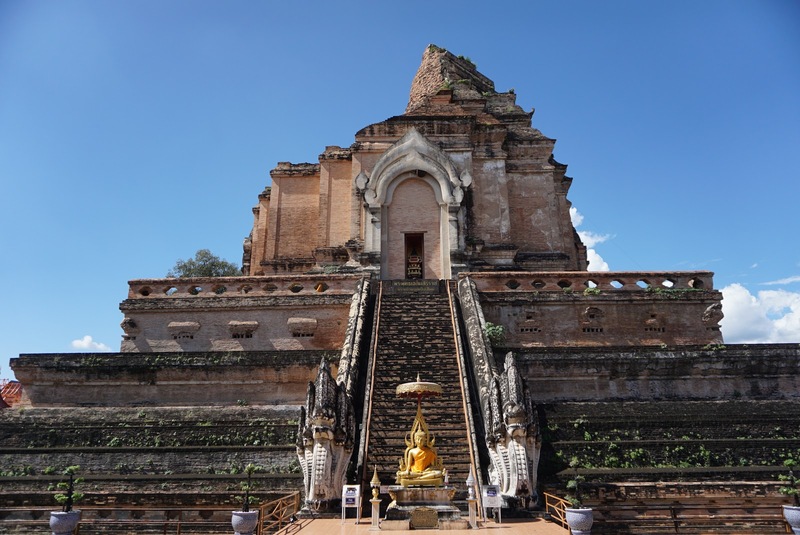 Other than temples and shopping, people visit Chiang Mai for the sceneries. 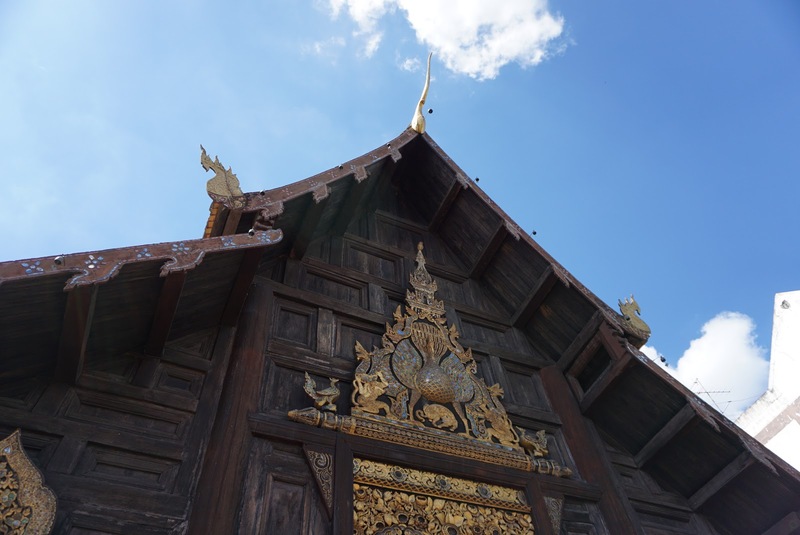 Chiang Mai houses Thailand’s highest peak, Doi Inthanon measuring an astounding 2,565m. 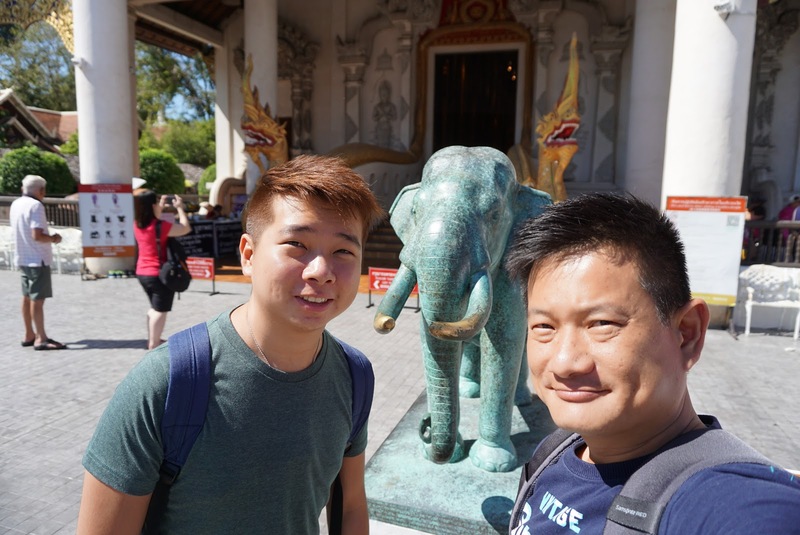 During this trip, I visited mostly temples and of course, shopping! As we were rather tired due to having to wake up early to catch our flight from Singapore to Chiang Mai, I planned today to be light. 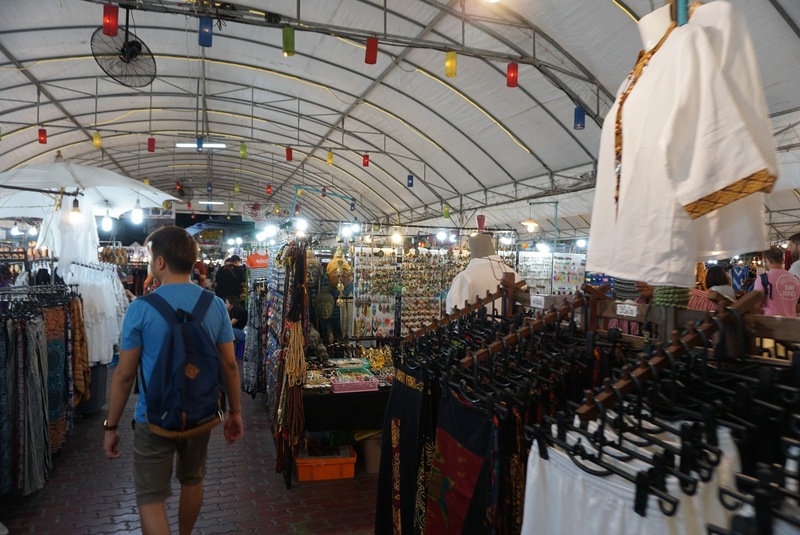 We plan to visit one of the few shopping malls in Chiang Mai followed by strolling along the night market in Chiang Mai. 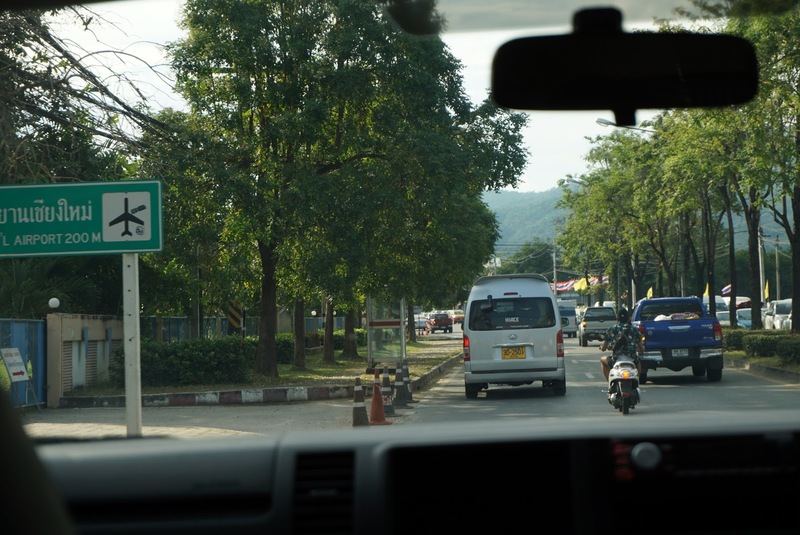 The taxis in Chiang Mai is unlike those we saw in Bangkok. The taxi in Chiang Mai is modified from pickup trucks, Songthaew which literally means 2 rows, can ferry up to as many passengers as it can take. Instead of running on meters, these Songthaews charges a flat fee of ฿30 per person that takes you anywhere in the city. Maya Lifestyle Shopping Centre is located across the city from the hotel we stayed. As we were driven across the Old City, remnants of the Old City Wall are still visible. 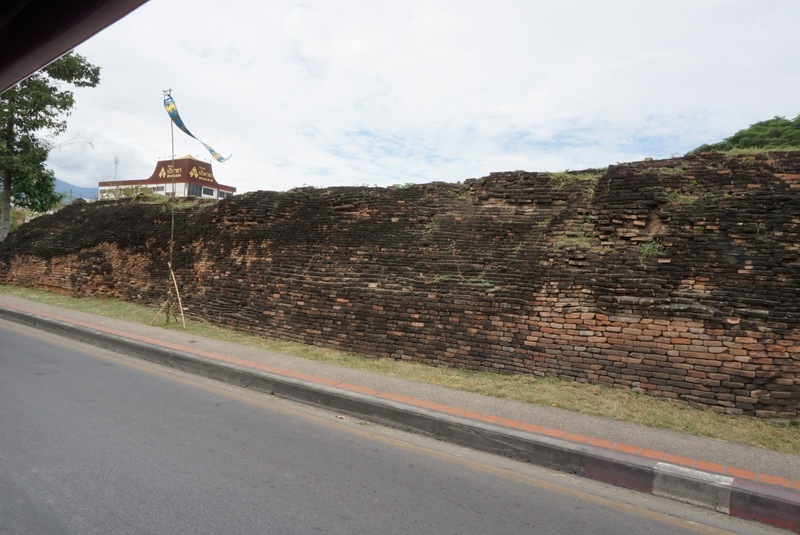 Most of the Old City walls are reduced to rumbles, except for the Eastern City Gate of Pratu Tha Phae, which seem to be have been restored either to attract tourists or to commemorate a glorious pass when these walls were useful. Driving across the Old City, we soon find ourselves arriving at Maya Lifestyle Shopping Centre. The facade of the shopping centre looks promising as a place where we can shop till we drop. 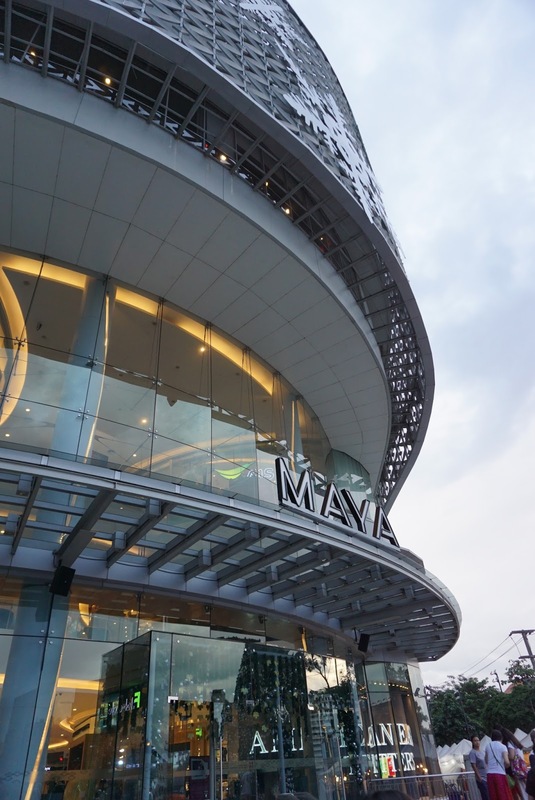 Maya Lifestyle Shopping Centre is a modern shopping mall with 7 floors of shopping including a basement. Our excitement soon died down as we entered Maya Lifestyle Shopping Centre. The shopping mall was dead and there are very few people shopping here. Even the effort to hold a Northern Thailand roadshow failed to draw in the crowd. As it passed lunchtime, we were more concern with filling our stomachs and did not let the lack of life in the shopping mall bothered us. We headed straight to the 4th floor to hunt for food. After walking around a couple of times, we did not find anything that suits us. 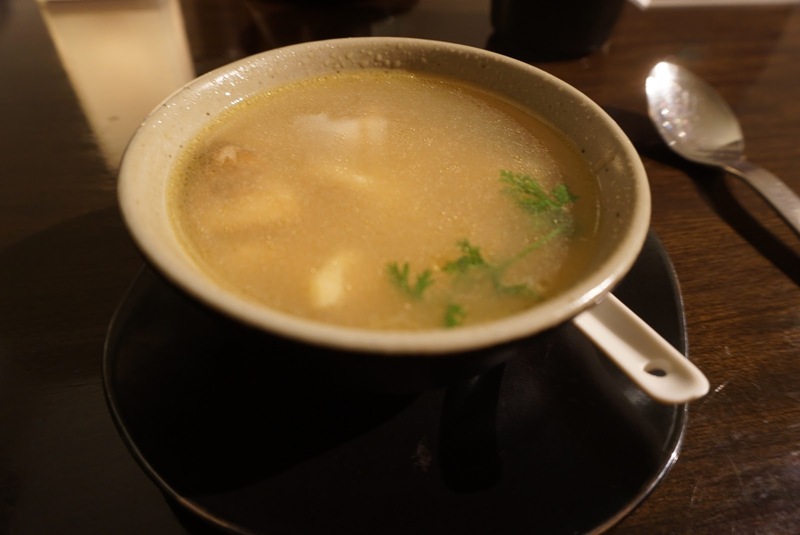 Instead, we settled our lunch at a Thai brand cafe that serves Thai food. 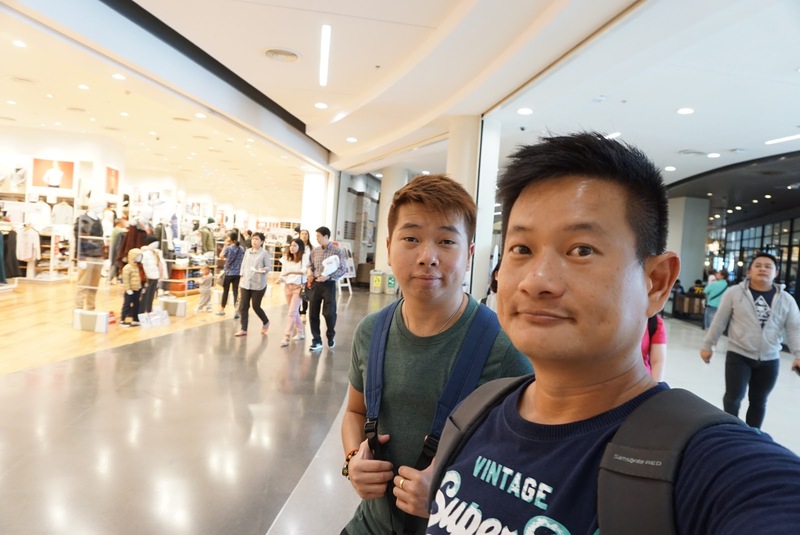 After lunch, we walked around the shopping mall, thinking that we might enjoy the shopping in here after all. However, no matter how we try to find things that might excite us in terms of the shopping here, we fail to do so. Most of the time, we find ourselves walking in the mall like zombies. Perhaps due to the lack of crowd that makes the entire shopping mall boring. Finally, we decided to give up and head back to the hotel to rest and get ready for dinner. 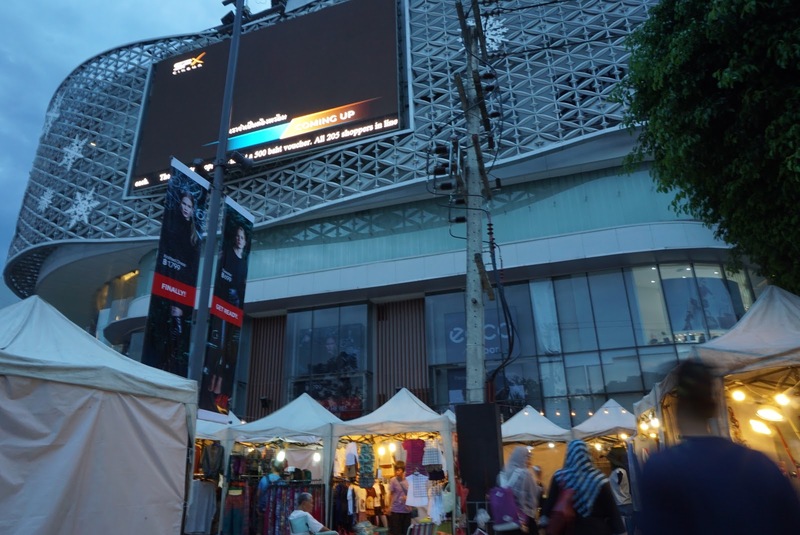 As we were walking out of Maya Lifestyle Shopping Centre, the night market outside the shopping mall started operations. 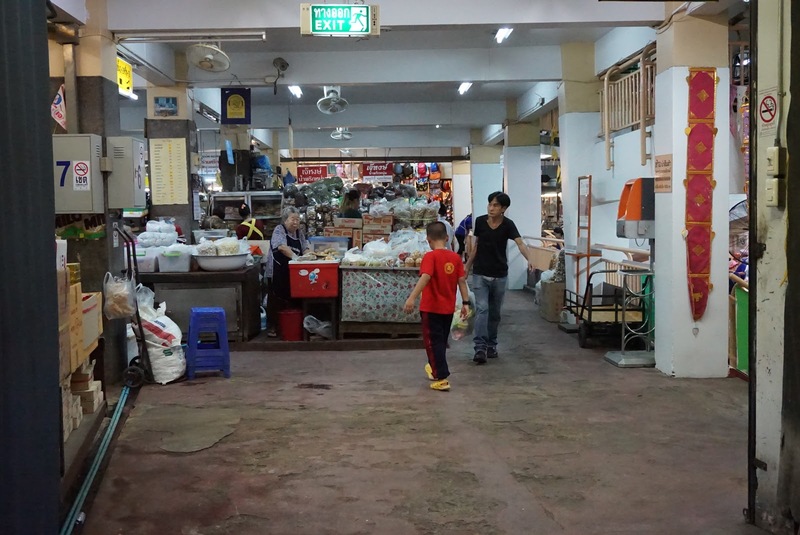 This is where we saw more people walking around these night market stores in the shopping mall. 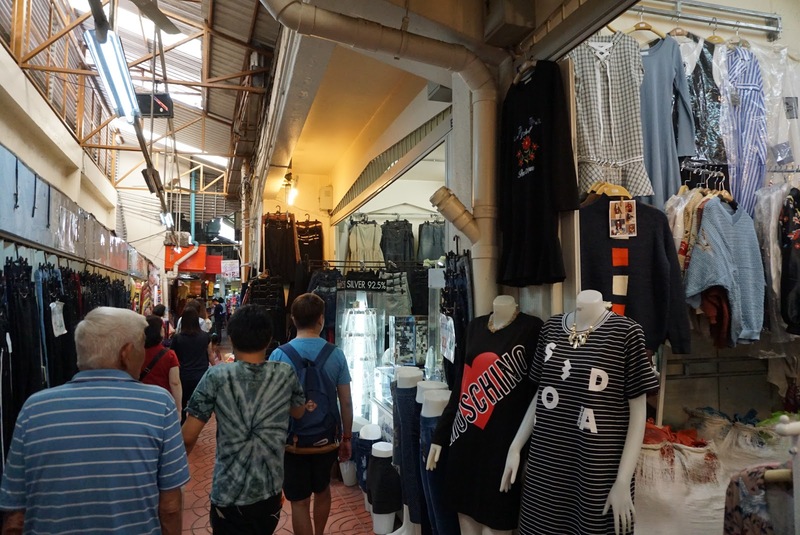 There are stores selling everyday stuff such as clothing and footwear, as well as a section where one can find delicious street food. We headed back to the hotel and rest a little before heading to the restaurant in the hotel for dinner, that is part of the hotel package we booked. After dinner, it is time to explore the night bazaar that is just outside the hotel we are staying. 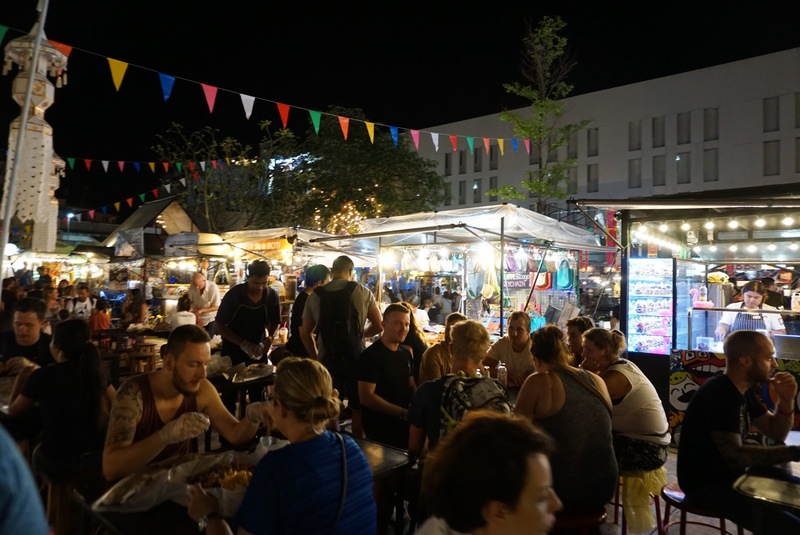 The night bazaar opens daily from 6pm to midnight and is situated east of the Old City, between Ping River and the East gate of Tha Phae along Chang Khlan Road. 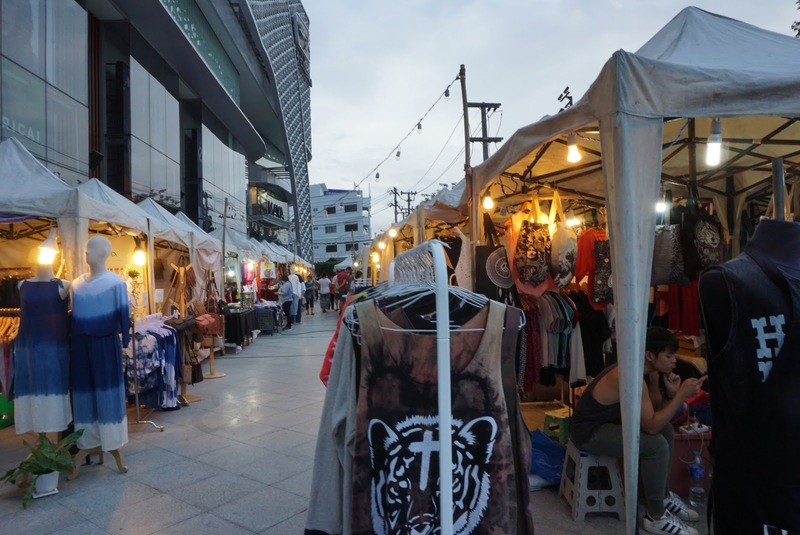 Countless stalls that seem to stretch forever lined up along both sides of Chang Khlan Road, mostly selling T-shirts and handicraft items. Generally, I find things being sold in this Night Bazaar cheaper than what one would find in the night markets of Bangkok. 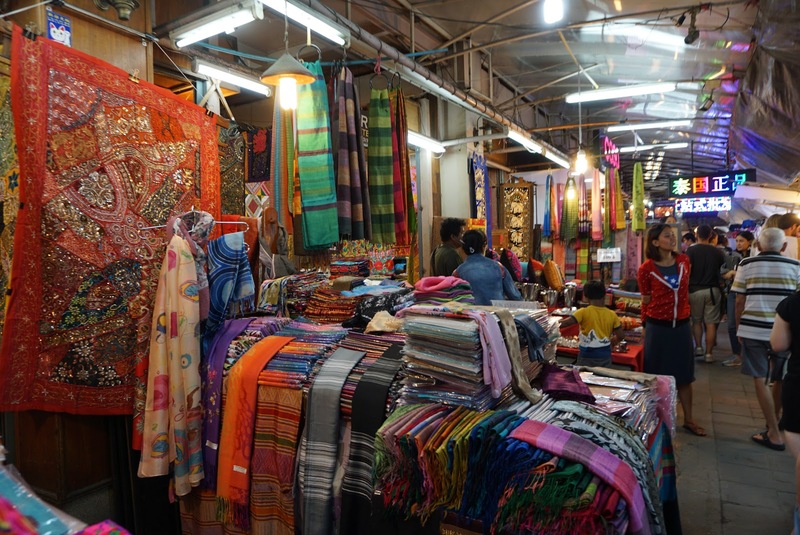 Walking along the street of stalls is sufficient to occupy one’s night with the endless shopping. 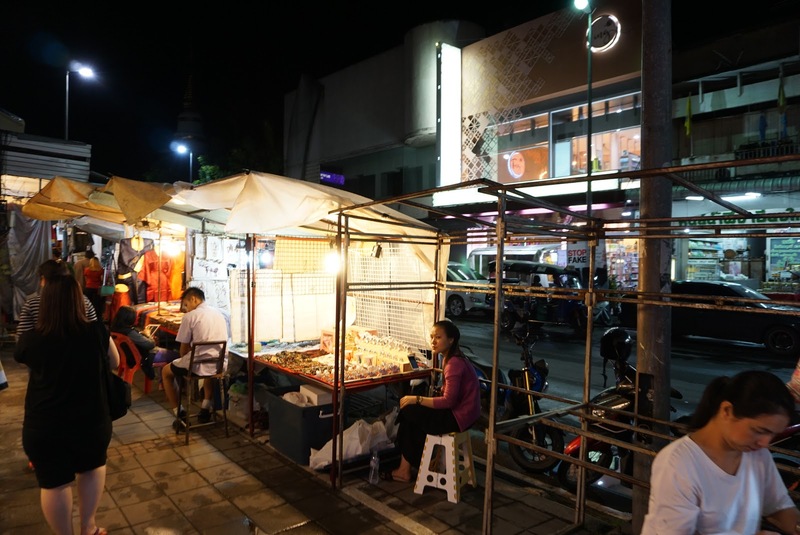 As though these make-shift night market stalls are insufficient to satisfy visitors’ shopping needs, there are some shops on either side of Chang Khlan Road that operates late into the night every day. 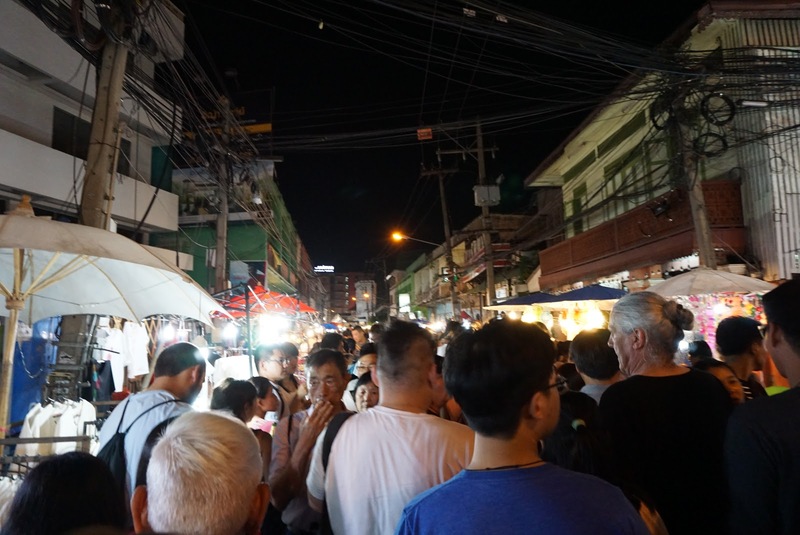 As we walked along the street full of stalls that burst into life at night, there are some pockets of entrances that lead to more night market shops. There is one such entrance leads to a large food area. 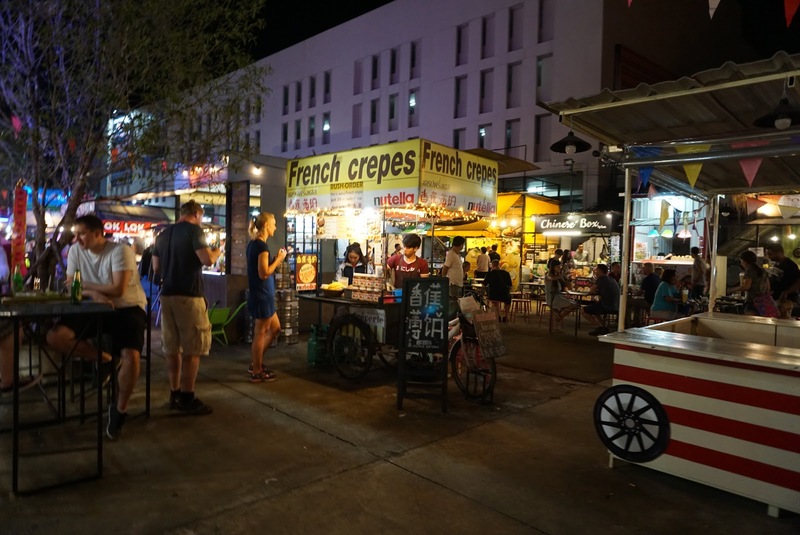 Stalls lined up around the parameter of this area where one can find Thai cuisine being sold alongside cuisines from other countries. 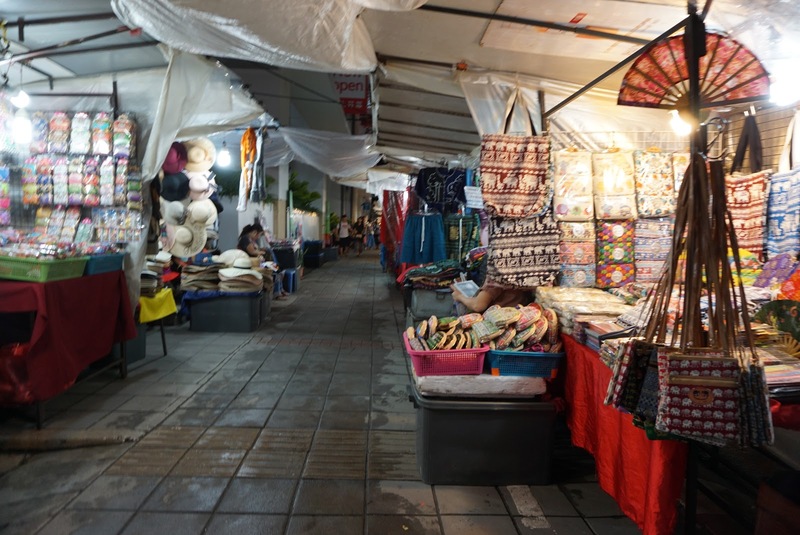 Along Chang Khlan Road, there are entrances that lead one to huge areas of night market stalls under the shelter provided by huge tentages, which makes these areas weatherproof. The stalls here mainly sells clothing. 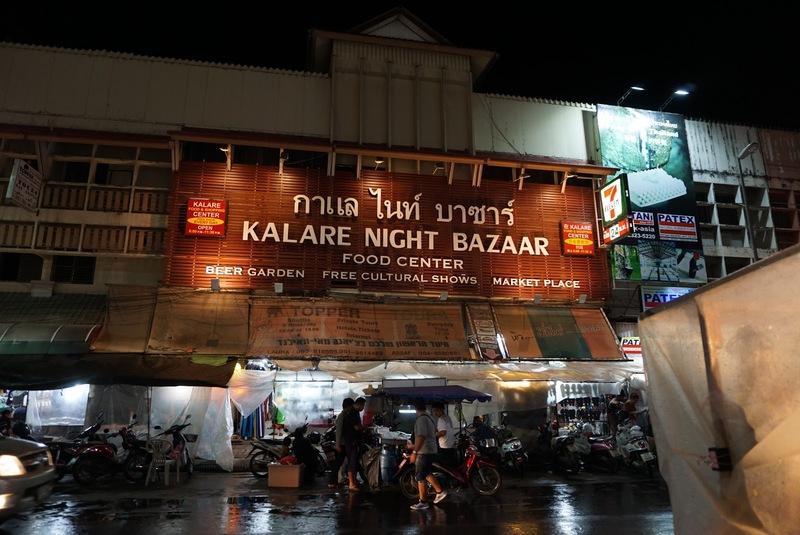 2 wooden structured buildings, one on either side of the road, with huge letters that spell “Night Bazaar” seem to promise more shopping inside. 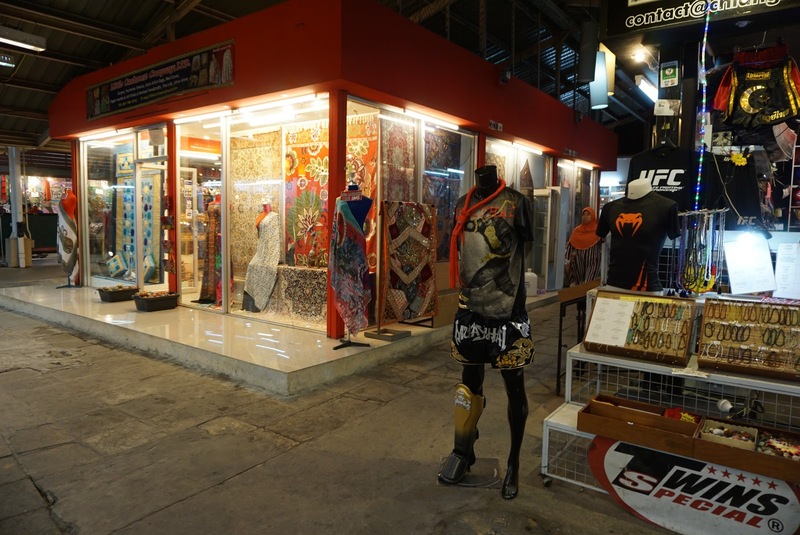 These night bazaars are a lot quieter than the main streets, with stalls selling mostly art pieces. There isn’t a lot of crowd inside these night bazaars. 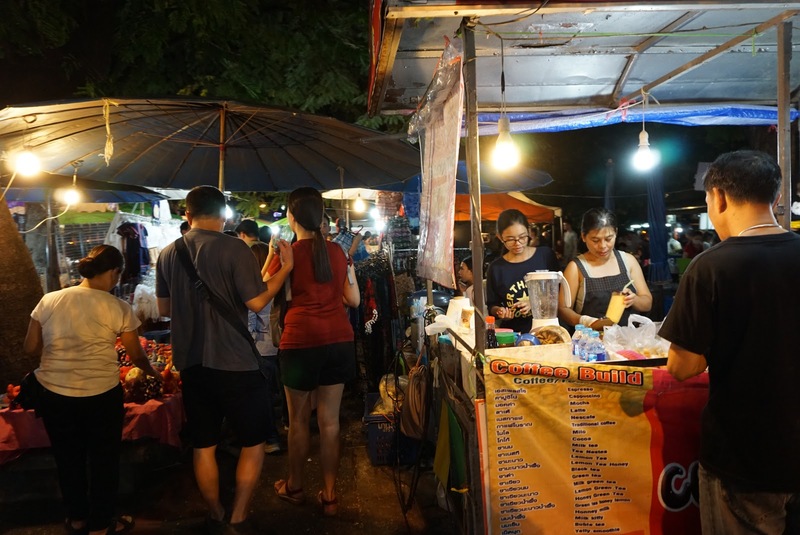 After walking around the Chiang Mai Night Bazaar for a while, the stalls seem to be repetitive, selling mostly the same items. Our mood shifted from finding out what’s on sale to which stall offers a better deal. 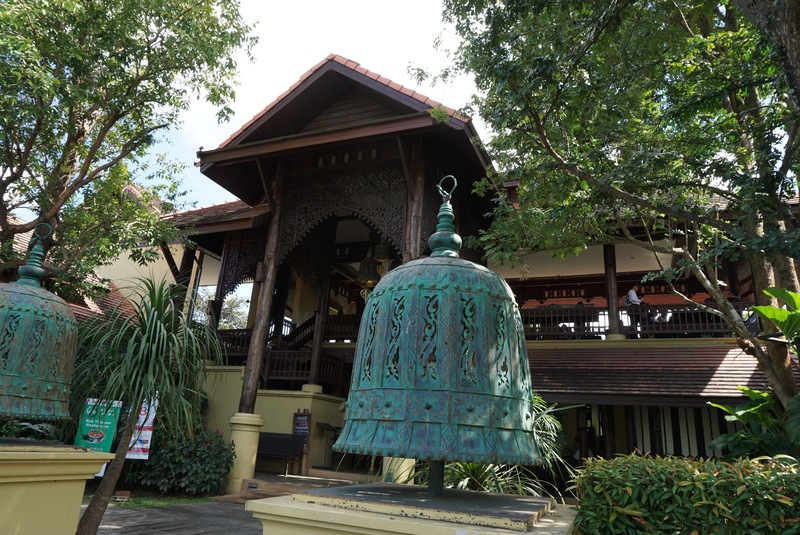 Dusit D2 Chiang Mai is located just outside the East of the Old City of Chiang Mai, within 15 min walk to the eastern Tha Phae Gate. 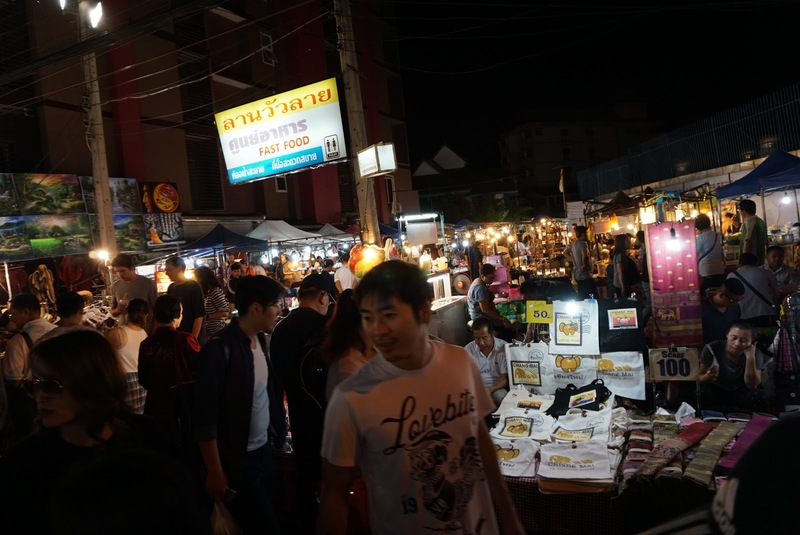 The hotel’s location is nearby 2 night markets in the vicinity. 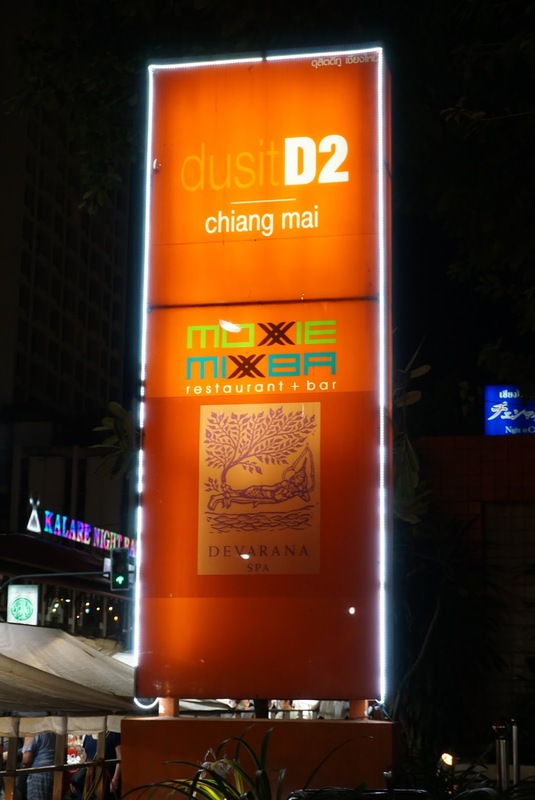 Dusit D2 Chiang Mai is 2 min walk from the Night Bazaar and 5 min walk from the Night Market. It is 10 min away from the Ping River. 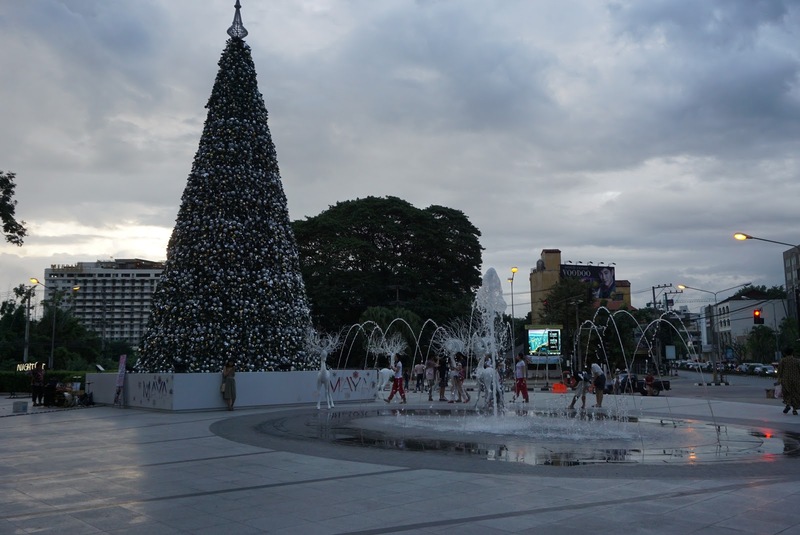 However, the hotel is rather far from shopping malls in the city such as Maya Lifestyle Shopping Mall and Central Festival Chiang Mai. 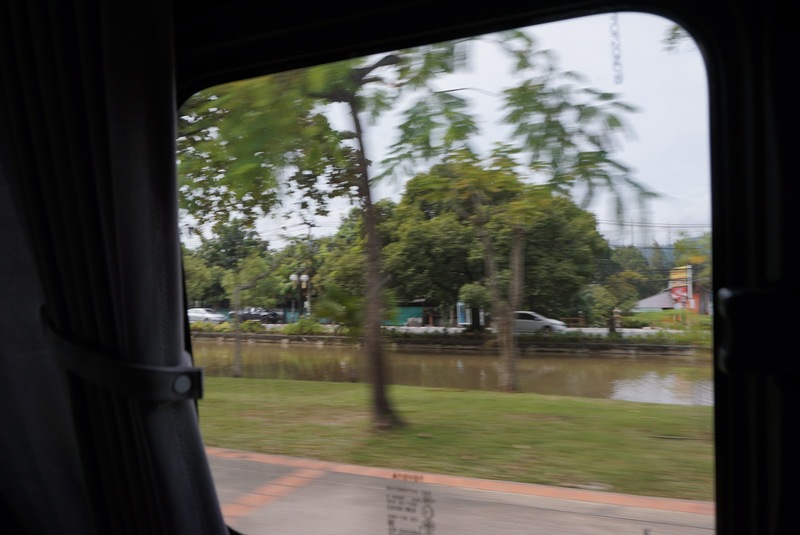 One point to note, Central Festival Chiang Mai offers shuttle bus service that stops by Dusit D2 Chiang Mai at scheduled timing. 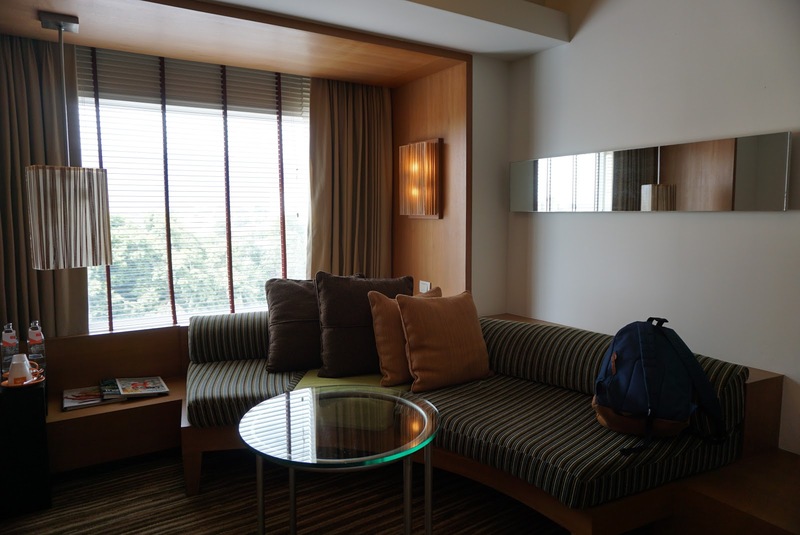 There are 2 types of suites in Dusit D2 Chiang Mai, namely Studio Suite and the larger D’Suite. I stayed in the Studio Suite which has a total room size of 64㎡ . 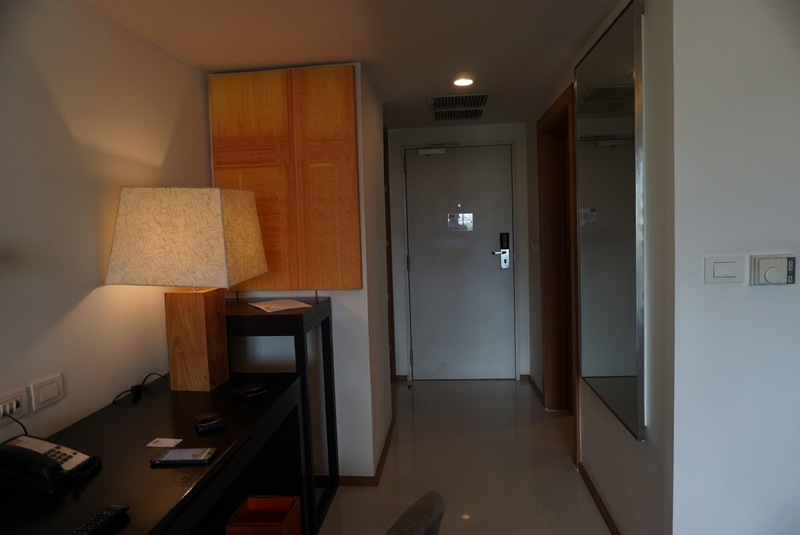 The Studio Suite in Dusit D2 Chiang Mai has 3 sections to the suite, namely Living Room, Bedroom, and Bathroom. Entering the suite in Dusit D2 Chiang Mai, the minibar is hidden in the wooden cabinet to the right of the main entrance. Here is where one would find the mini fridge, electric kettle and glasses. Opposite the minibar, a door leads to the walk-in wardrobe, which is also linked to the bathroom (more about the walk-in wardrobe later). Further into the little corridor from the main entrance, the suite opens up to a spacious living room. The decoration in the living room is contemporary yet exudes a Thai flavour,. 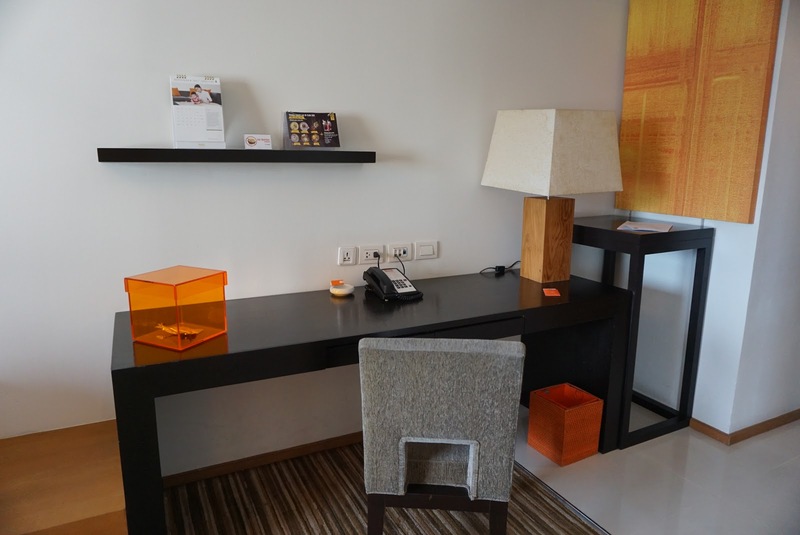 The choice of colour in the suite is also in line with the familiar bright orange we have seen in the hotel lobby, extending the vibrant and energetic spirit into the suite. The furnishings in the living are stylish yet functional. A large work desk, tucked into the wall of the living room on the right side, extends from the hidden minibar to the midpoint in the living room. This large work desk serves as an alternate space for me to put my things onto. There are a few power sockets on the wall, which makes it an excellent place to work and to charge my lifestyle devices. A small table built into the wall next to the work desk functions as extra space which is perfect for me to place my shopping. A curved couch, capable of sitting 4 persons wraps around the corner of the living room all the way to the wall separating the living room from the bedroom. At the end of the couch is where one would find complimentary beverages such as coffee, tea and bottled water with a coffee machine nicely tucked in the corner of the living room. A couple of wall lights on either side of the wall, in front of the large panel window that looks out into Doi Suthep, provides additional lighting in the living room of the suite. Across the curved couch is a large LED TV mounted onto the angled wall, which is perfectly angled for watching TV. A small glass top coffee table is placed between the TV and the couch. 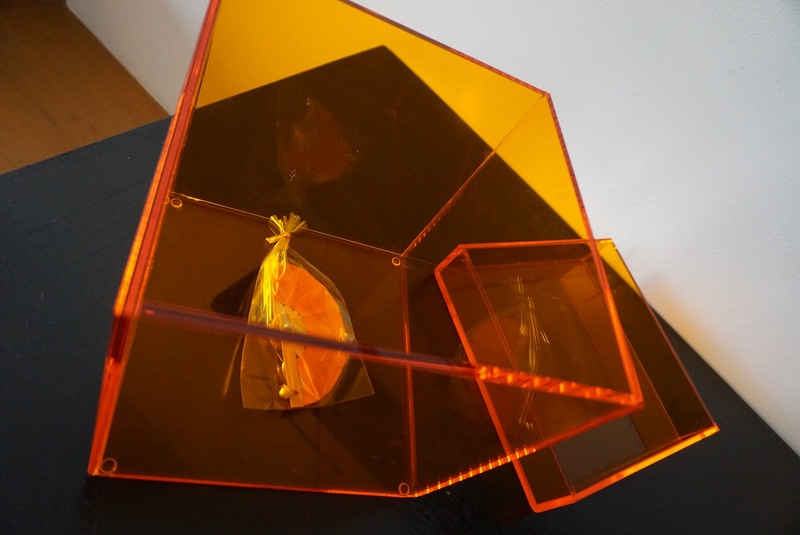 There is a single seat orange couch chair placed at the corner of the living room, providing the additional seat for guests to entertain their guests. The entire living room did not feel cramp and has loads of space to move around, as the furniture is arranged flushed to the wall around the living room. A large wooden sliding door serves as the entrance to the bedroom from the living room. 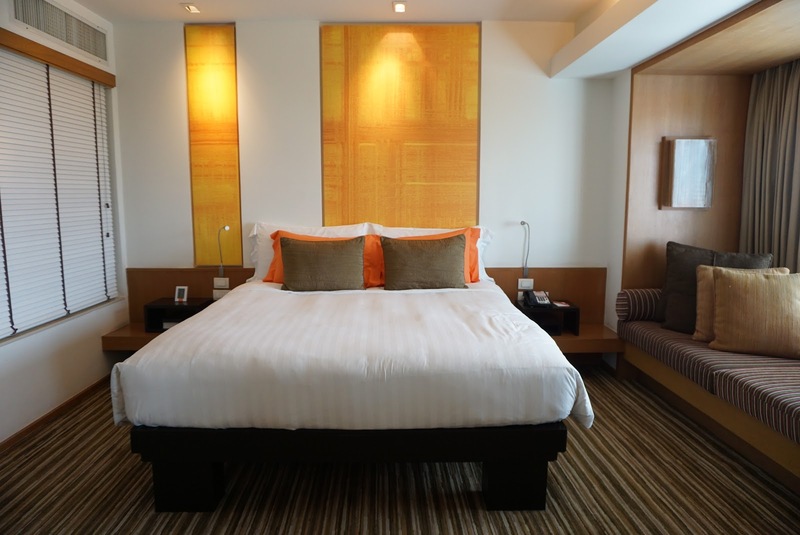 The bedroom is also heavily decorated with a Thai theme, together with the bright orange colour theme that is seen throughout Dusit D2 Chiang Mai. The bedroom feels cosy due to the colour scheme used and the lighting, making the entire bedroom feels very comfortable visually. Entering the bedroom, a wooden-framed king bed sits in the centre of the room. The height of the bed is a tad high, nonetheless, the sleep quality is excellent on the bed. However, I find the pillows too soft to my liking. On either side of the bed are bedside tables, but only the table nearer to the window has power sockets. Tucked by the large window panel on the right side of the bed is a couch, perfect for watching the TV in the bedroom or just for relaxing and enjoy the views of the mountain from the bedroom. Opposite the king bed, mounted on the wall, is a small TV. Despite the placement of this TV is a little off, guests are still able to watch the TV from the comforts of the king bed. 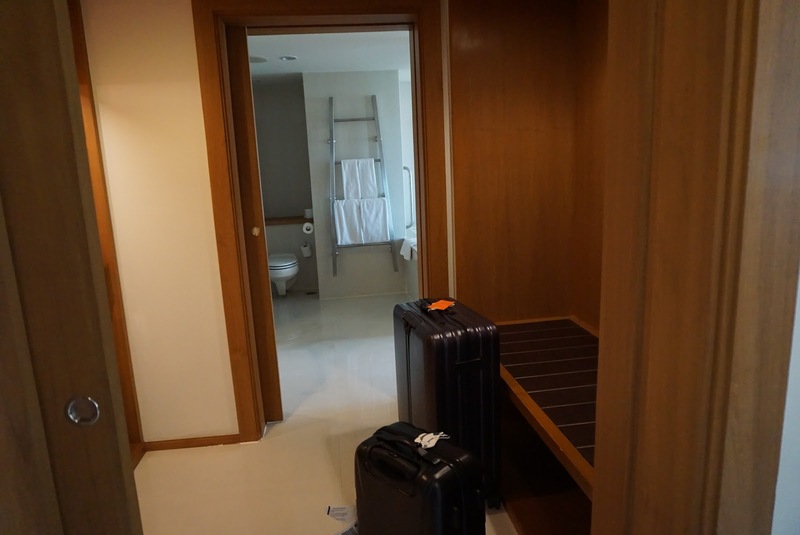 Dusit D2 Chiang Mai Studio Suite has a large bathroom. The bathroom is accessible from the bedroom and the living room. Entering the bathroom from the bedroom, a shower cubicle sits opposite the door. 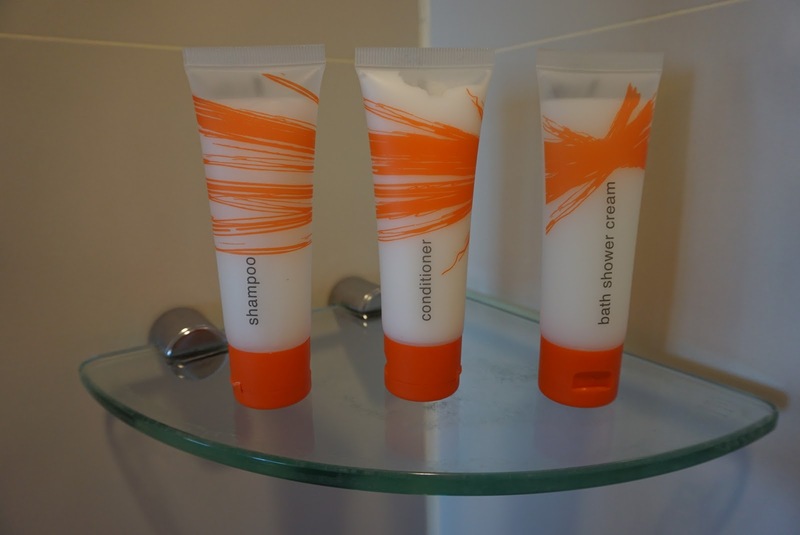 Only regular shower head is found in the shower cubicle, however, the pressure from the shower head is great. 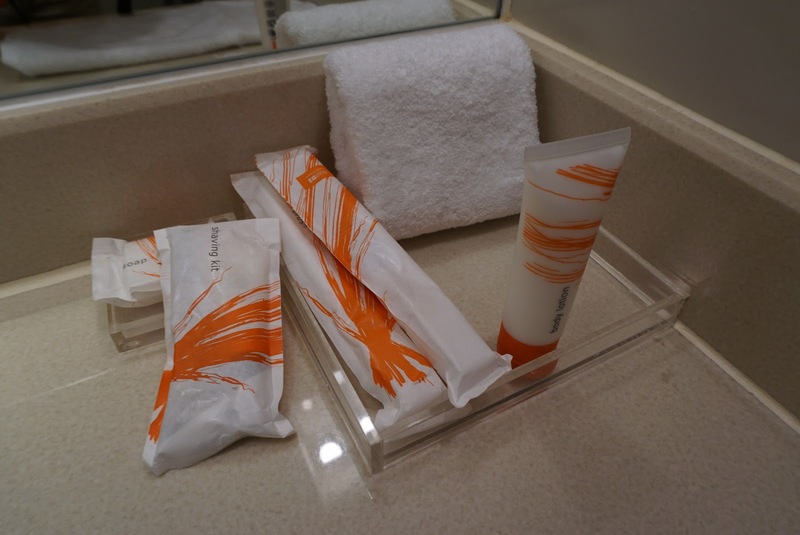 The sink is located next to the shower cubicle where one can find ample space to put additional toiletries on the sink countertop. To the right of the sink, tucked into the corner of the bathroom is where the toilet is located. Opposite the sink, next to the large panel window that looks out into the bedroom is the bathtub. The bathtub seems to be tucked in a corner, making getting in and out of the bathtub difficult. I appreciate the window panel as it allows guests to watch TV from the bathtub. The sound from the TV in the bedroom is also piped into the bathroom, making it ideal to watch TV while relaxing in the bathtub. Dusit D2 Chiang Mai provides their house brand bath amenities, which is both of good quality and feels luxurious. The walk-in wardrobe is found in between the bathroom and the living room. 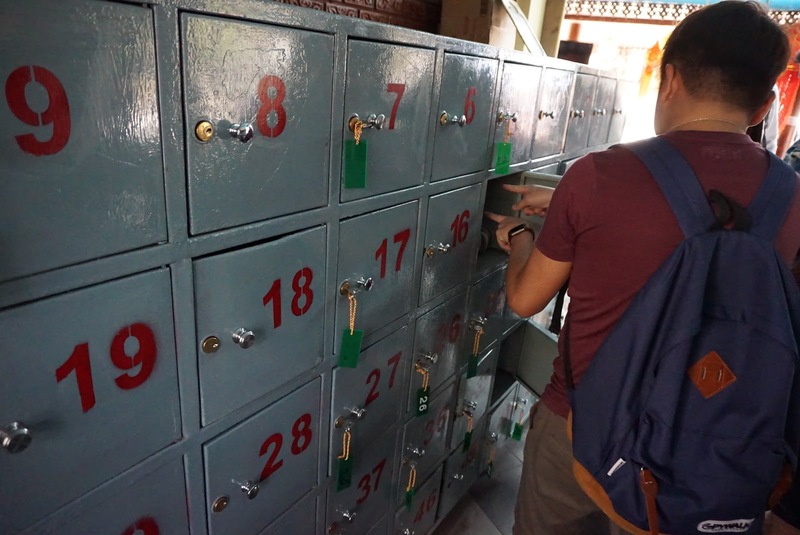 Dusit D2 Chiang Mai employs an open concept for their walk-in wardrobe. Other than the 2 doors accessing the wardrobe, there are no wardrobe doors. The wardrobe space is large, allowing guests to change up after their shower. Next to the door to the bathroom, is where a 3 tiered drawer is located. These drawers provided additional storage space for small personal items. On top of the drawer is the in-room safe. 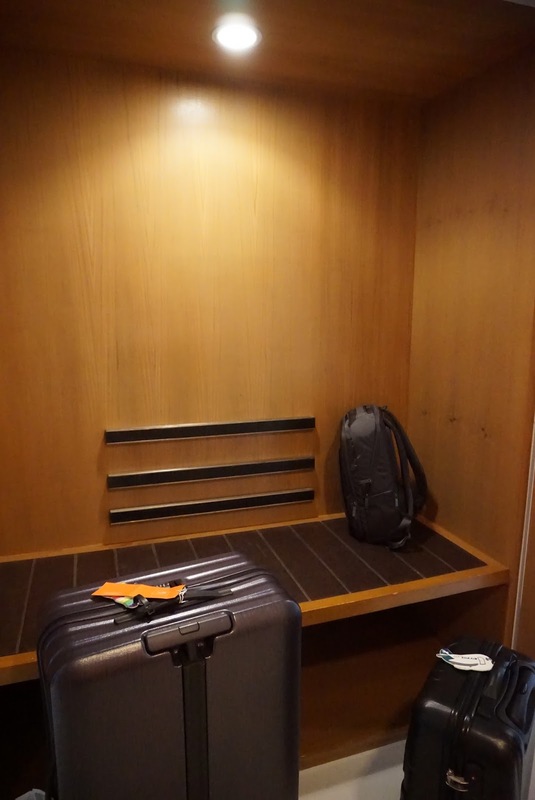 A large ledge for guests to put their luggage on is located opposite the wardrobe. 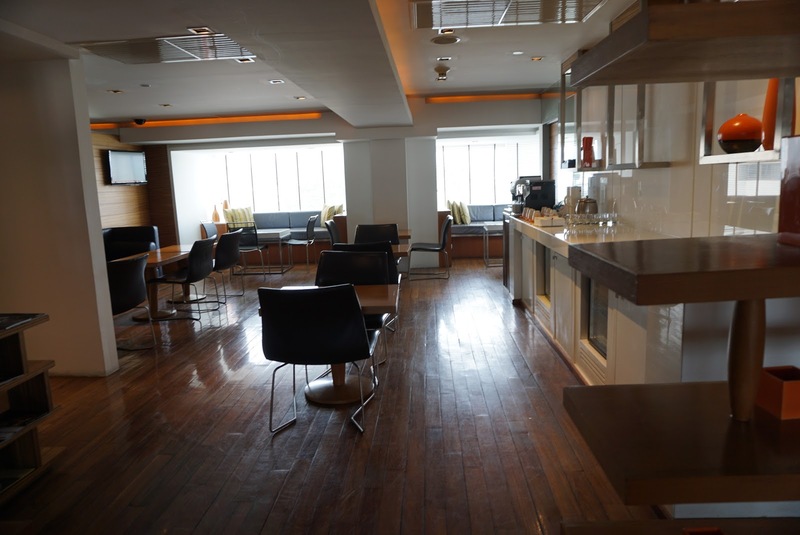 The Club Lounge in Dusit D2 Chiang Mai is located on level 7 of the hotel. There are armchairs for smaller groups and several dining tables capable of sitting up to 6 guests for larger groups. 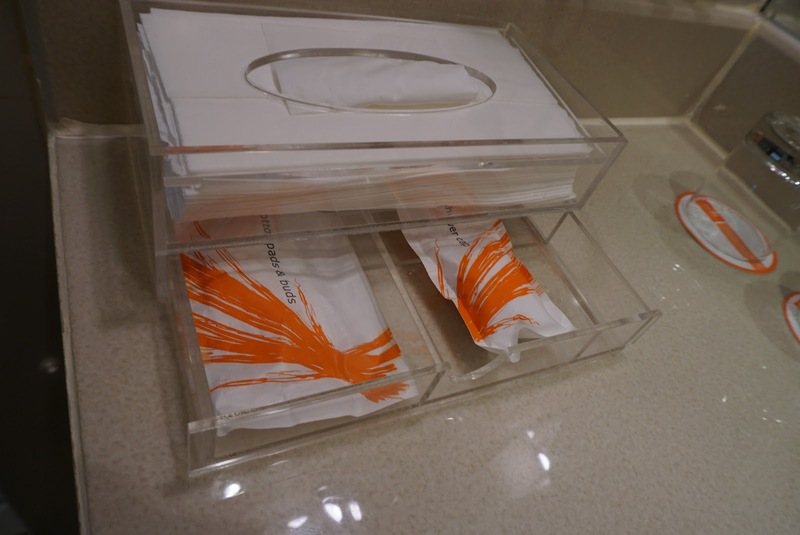 Guests staying in Club rooms and suites can check in and out from the Club Lounge. 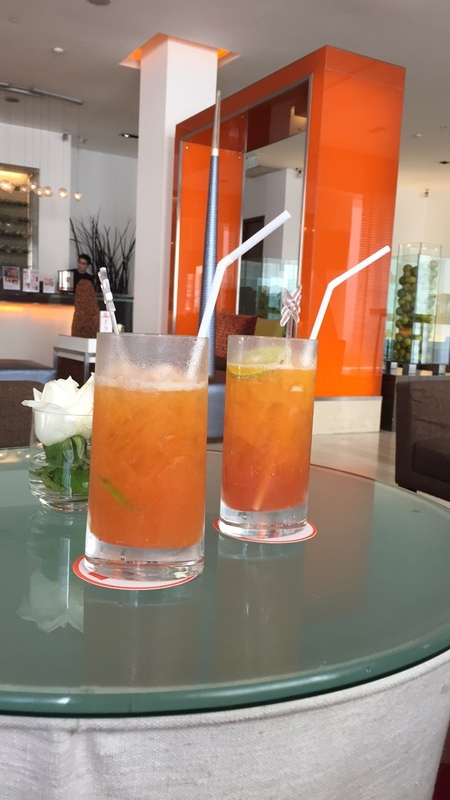 Guests can walk in during the opening hours for complimentary drinks. Hors-d’oeuvre are served every evening in the Club lounge, where guests staying a club room and suites in Dusit D2 Chiang Mai can enjoy. The selection for Hors-d’oevure in the Club Lounge is, however, limited. 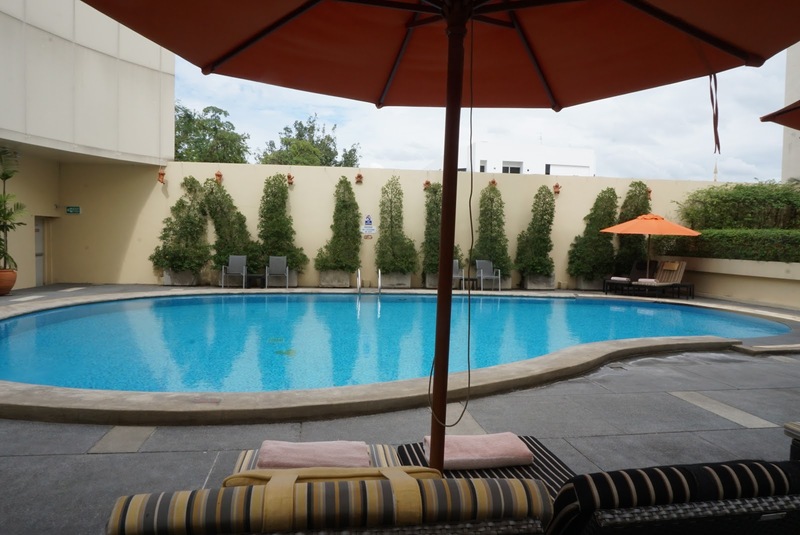 The swimming pool in Dusit D2 Chiang Mai is located on level 1M. The freeform swimming pool is a little small but is still capable of letting guests to swim a few laps in. There is a limited number of suntan chairs at the pool area. 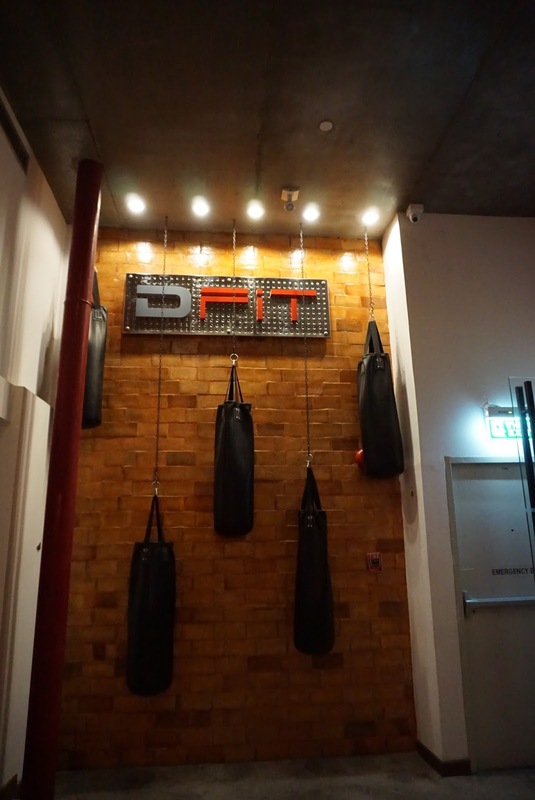 D:Fit is the gym in Dusit D2 Chiang Mai. 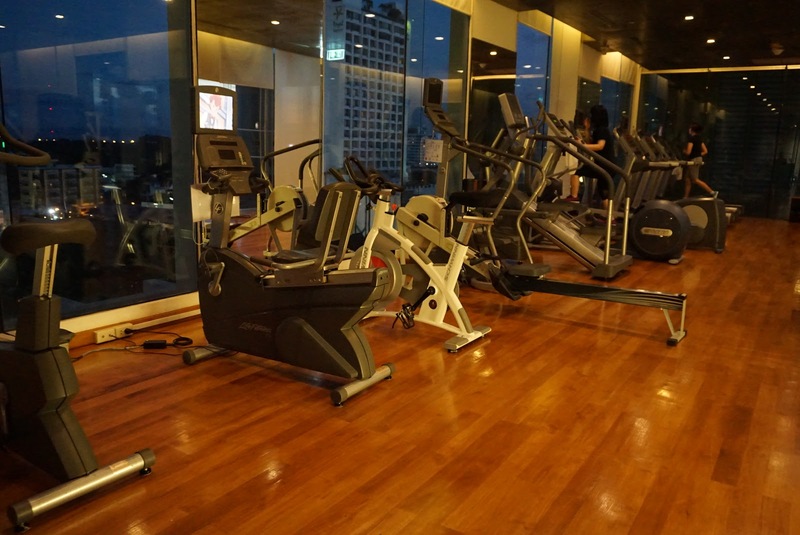 The gym is located on the 10th floor of the hotel, with the entire floor dedicated to the gym. There are the standard treadmills and elliptical machines in the gym. which allows guests to do a decent workout. There are also some weight machines in the gym. There is a steam room inside the toilet in the gym. The package that we booked includes breakfast and dinner. 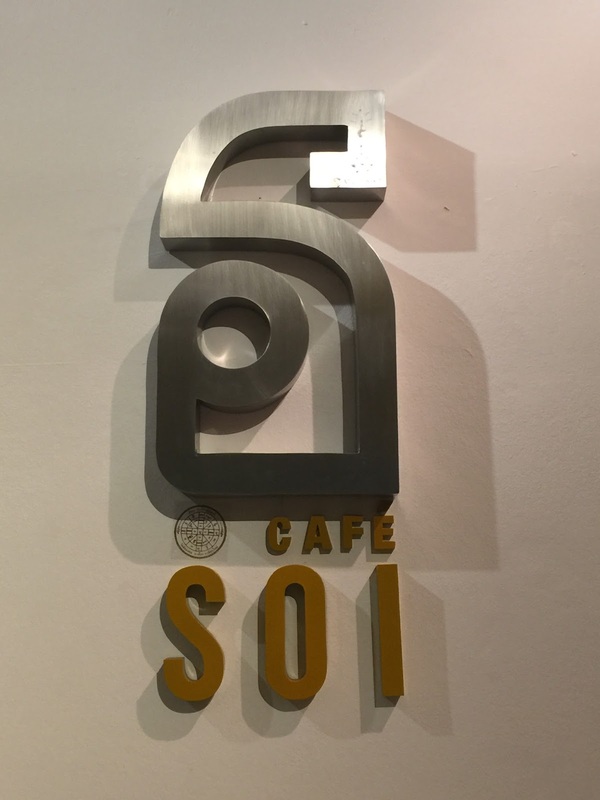 Both meals are served in Soi Cafe, located on the ground floor, next to the lift lobby in Dusit D2 Chiang Mai. 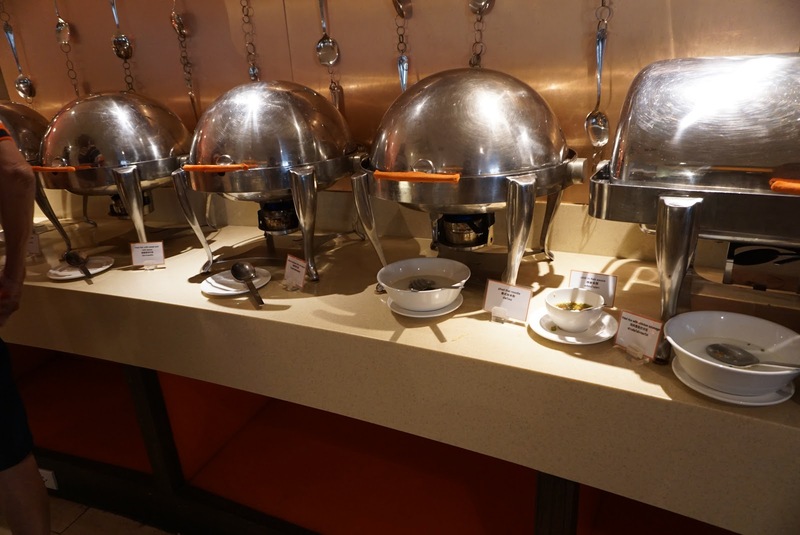 Similar to many hotels, buffet breakfast was served in Dusit D2 Chiang Mai. 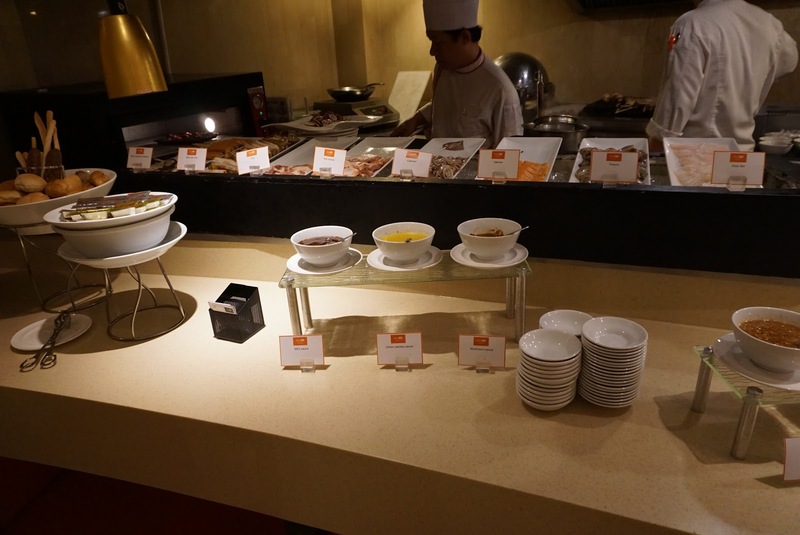 Breakfast includes both oriental and western options, such as porridge, salad, bread to name a few. 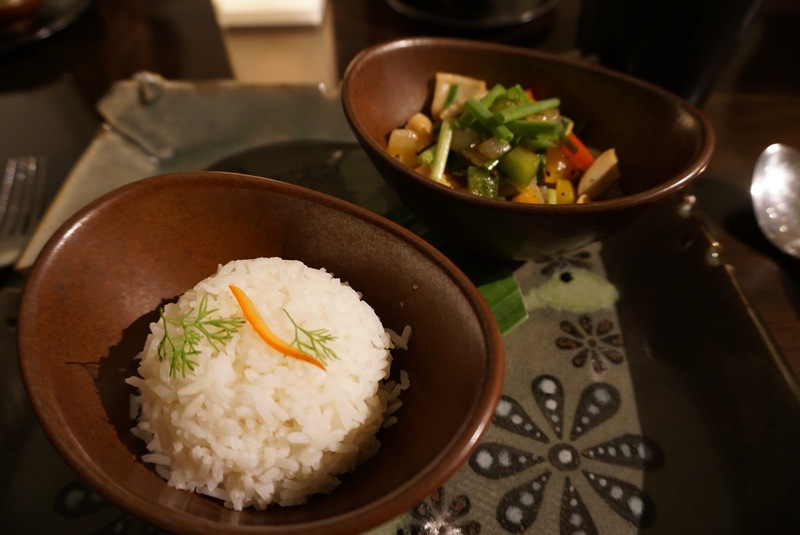 There is also a small selection of Thai food available during breakfast. 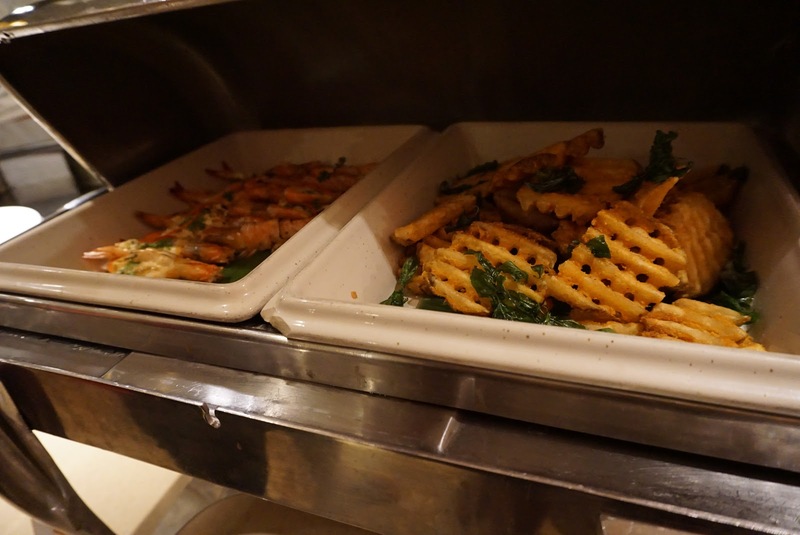 There is a hot counter which prepares eggs, chicken noodles, pancakes and waffles that are prepared a la minute. 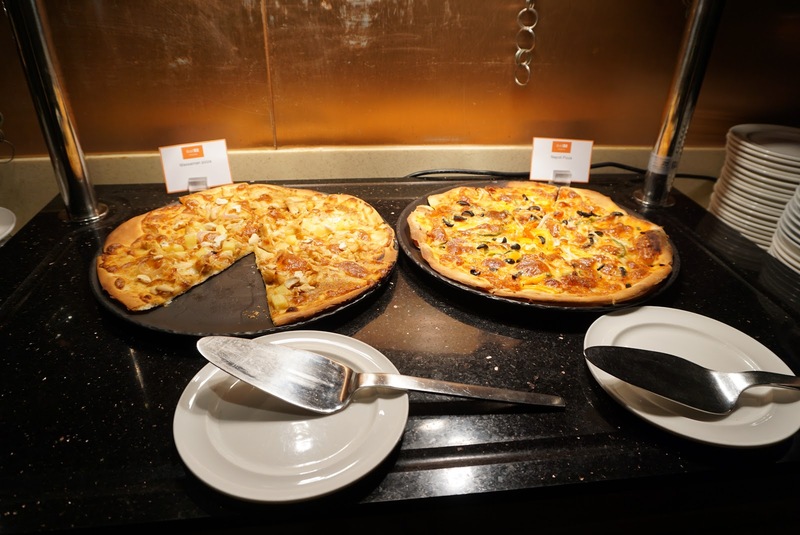 Food on offer during breakfast is fresh and delicious. There are some variations in the breakfast served daily. Dinner was served in Soi Cafe as well. During our first night there, we were given options of Thai cuisine (fish in black pepper sauce) and western cuisine (chicken steak). We opted for the Thai cuisine. The food was delicious and flavourful. 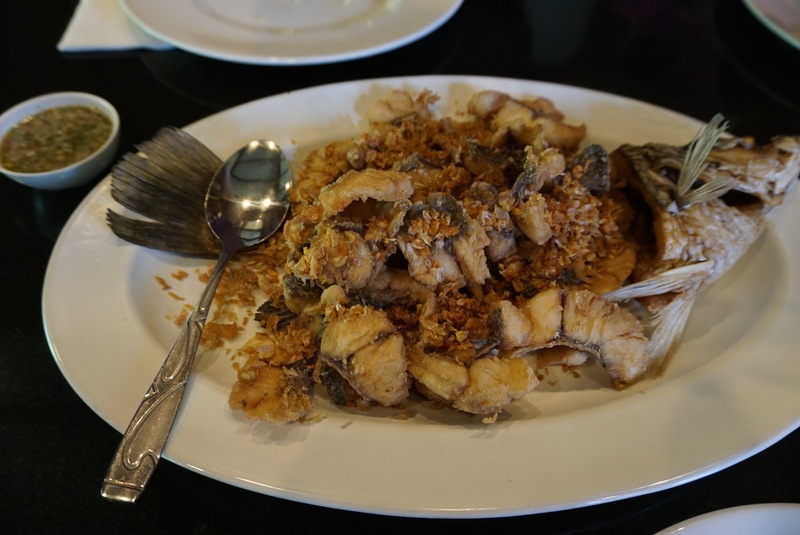 During the subsequent 2 nights, instead of set dinner, Dusit D2 Chiang Mai offered us seafood buffet dinner. There was a good spread of food during dinner service. Cold dishes are placed in the centre of the restaurant, with options such as sea snails, cockles, cold soba shots and salads made available to guests. There is a section where guests can choose from a range of raw meats such as pork, pork ribs, chicken, salmon and dory fish, where the chefs will barbecue for guests. 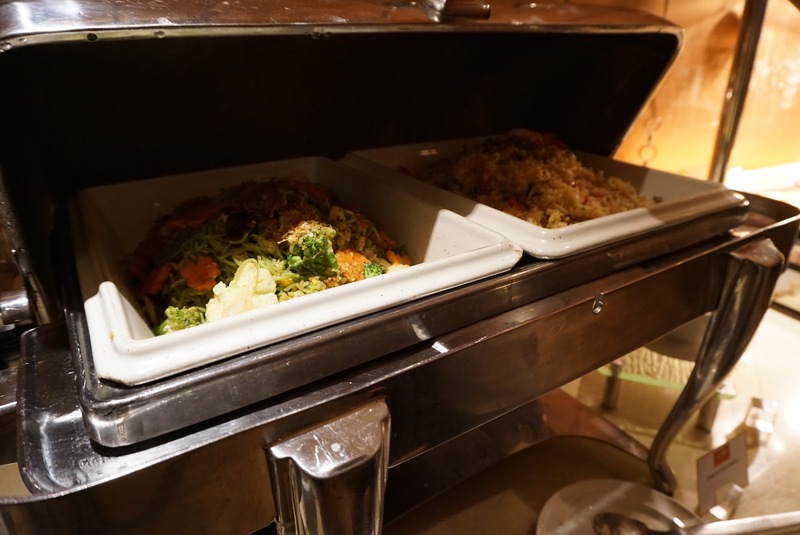 There are also cooked sections with fried rice, noodles, pizza available. 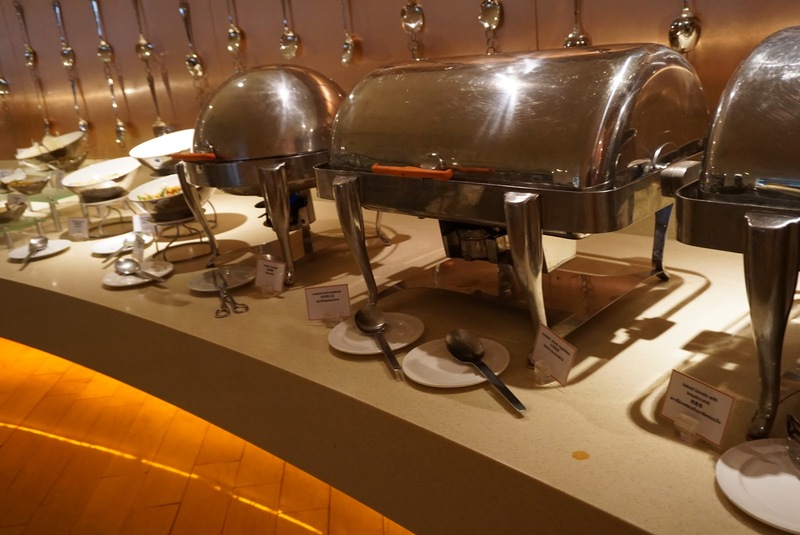 As with breakfast, there is a minor variation during dinner service to the cooked food. The food on offer was delicious, with the right amount of flavouring to them. The service we received in Dusit D2 Chiang Mai is impeccable. 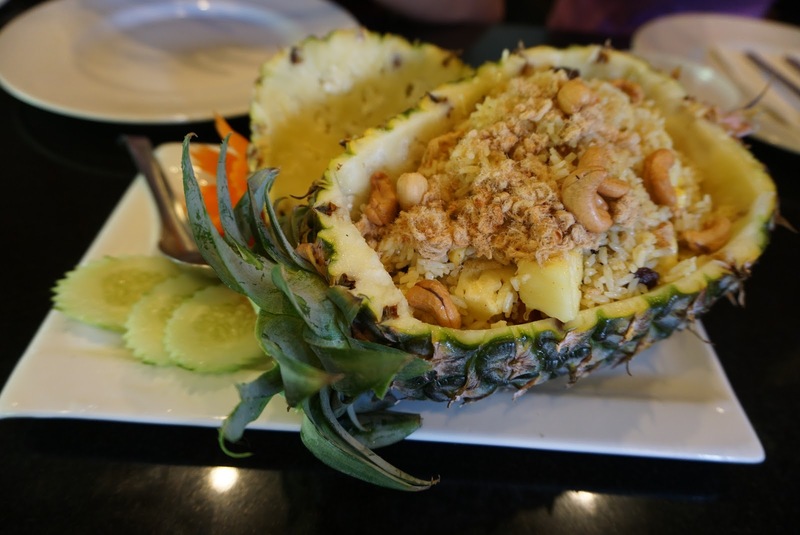 Every staff who we came across displayed the nature of the Thais that we have all came to know about, hospitable and warm. They seem to go all out to ensure we feel comfortable in Dusit D2 Chiang Mai and our requests are being met with. 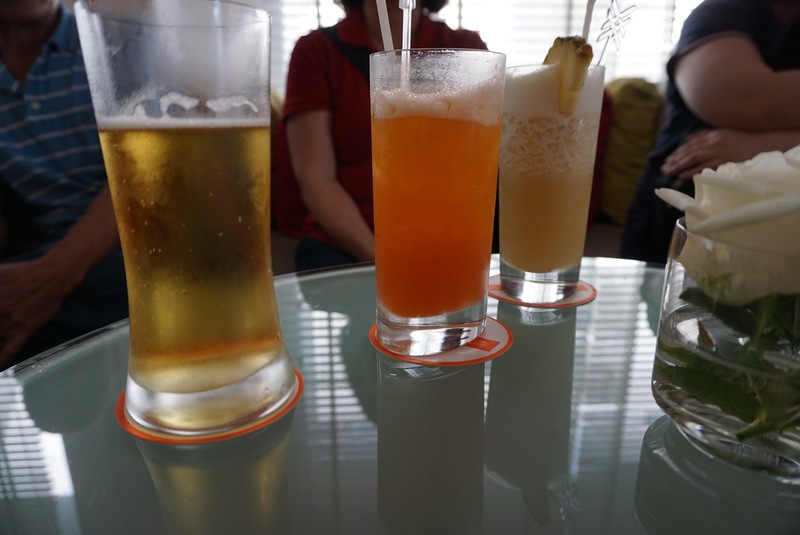 The excellent service came weeks before we even departed for Chiang Mai when I coordinated with the hotel via email. The reservation supervisor, Panatsaya, was very prompt in her replies and gave us assurance that our requests are being captured. 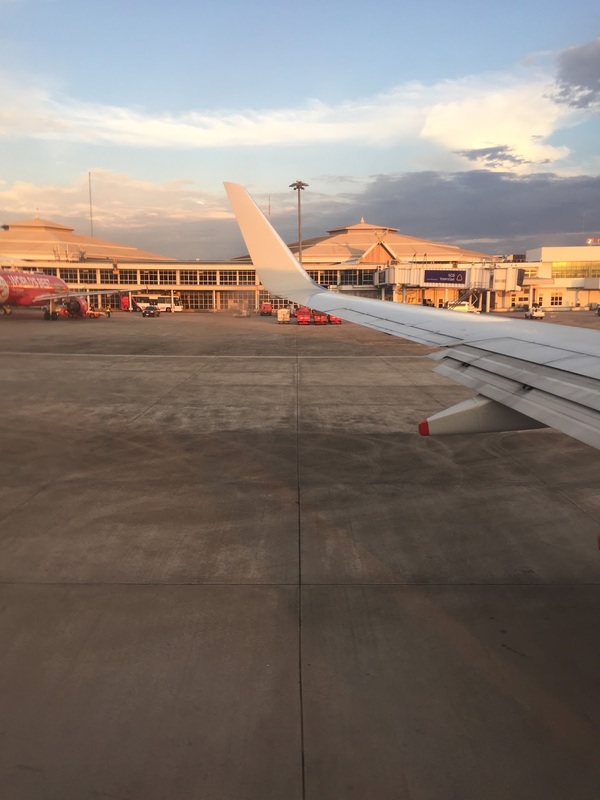 As the package we booked comes with return airport transfer and a vehicle for us to use for 8 hours, Panatsaya was able to quickly coordinated our requests and our flight details to arrange for the drivers to pick us up. During her absence, the coordination continued with her colleagues, Preenan and Pennapa. 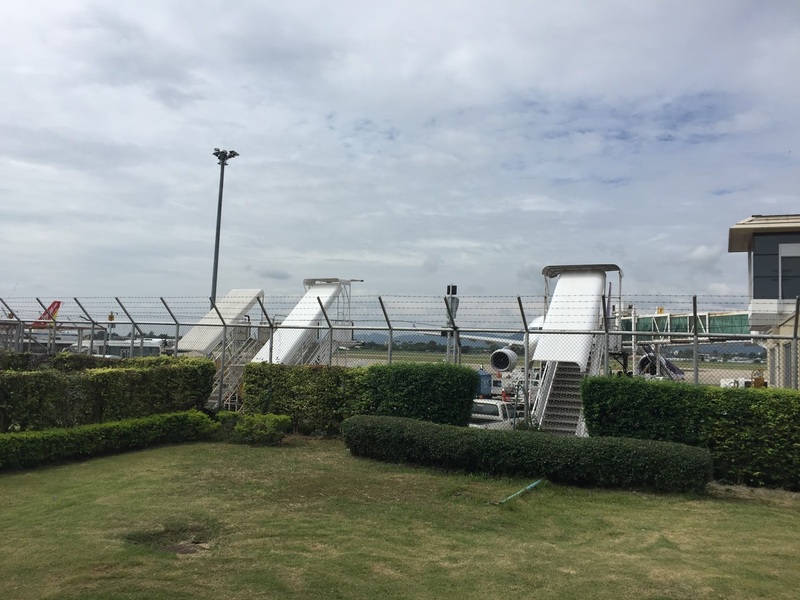 We were being picked up by the hotel staff the moment we walked out of the restricted area in Chiang Mai airport upon our arrival. The staff at the main entrance, Young, welcomed us and quickly unloaded our luggage when we reached the hotel. 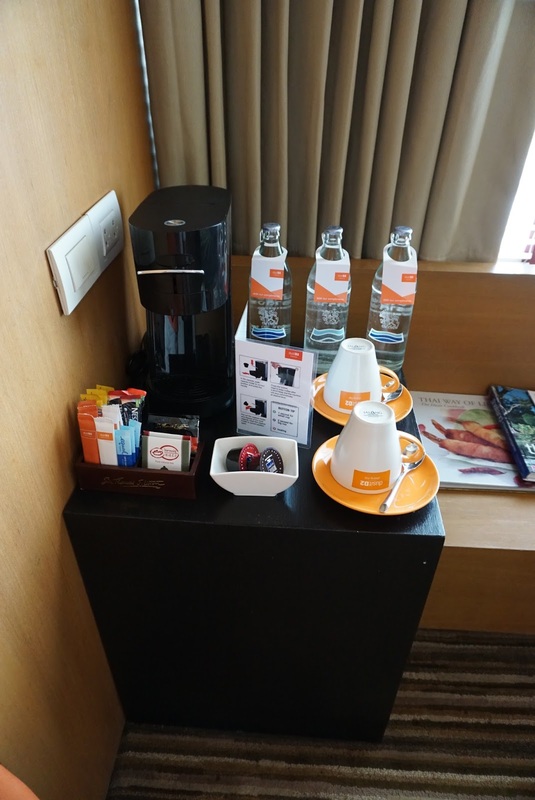 By the time we were done with the check-in procedures and proceeded to our suites, our luggage was already waiting for us in our suites. When Young saw us heading out and helped us hail a taxi. He helped us translate to the cabby on our destination and even ensured that we were not overcharged. Young is always very welcoming and gave us the warmest smile whenever we bumped into him at the entrance to the hotel. Young drove us to the airport during our departure and refused to let us handle our luggage. At the airport, he even took the initiative to help us get trolleys and loaded our luggage onto them. The staffs at Soi Cafe did a tremendous job in making us feel welcome. Phet showed us to tour table on the first night we had dinner. She was welcoming and made us feel like VIP. We requested for warm water from Phet during our dinner. 2 nights later, we met Phet again at Soi Cafe. After showing us to our table, she asked if we prefer to have warm water. Such observant and taking the extra mile in remembering our preference, despite being 2 days ago goes to show that the level of service rendered by Phet was impeccable. I don’t even remember what I had eaten the night before, let alone expecting Phet to remember our preference for small items such as water. 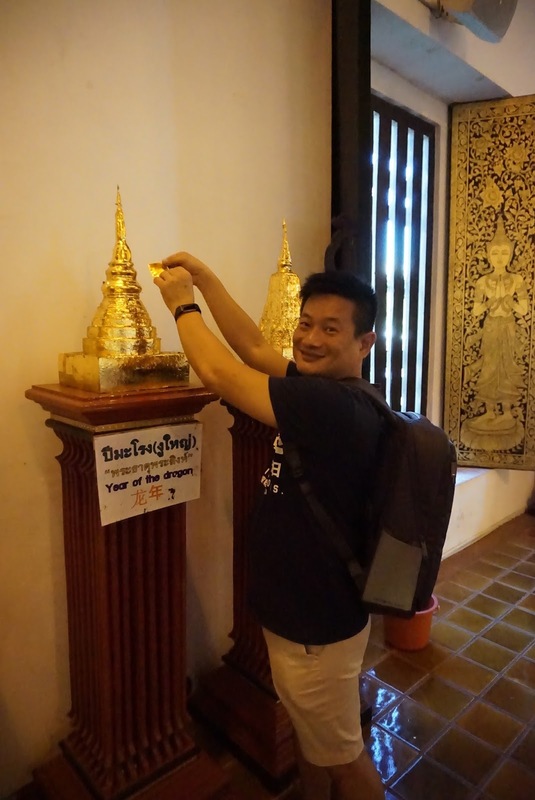 I was pleasantly surprised by Phet. Poy is another staff working in Soi Cafe in Dusit D2 Chiang Mai. We would see her every morning during breakfast service, standing at the entrance to the restaurant welcoming guests. I am glad to find that we only have to mention our room number on the first day during breakfast and Poy took the effort to remember our room numbers. During subsequent days, Poy did not even asked our room numbers and showed us to our table without delay. As one of the members of our group is a vegetarian due to religious reasons, I requested to Poy if the kitchen was able to prepare some vegetarian meal for my friend. To my surprise, instead of rejecting us, Poy got the kitchen to whip up a vegetarian meal and even checked if my friend like the taste. Subsequent mornings during breakfast, Poy would sit us at a table and quickly went into the kitchen to place the vegetarian meal order without us reminding her. She would never fail to check if the meal was sufficient for my friend. Puchong is another staff working at Soi Cafe. 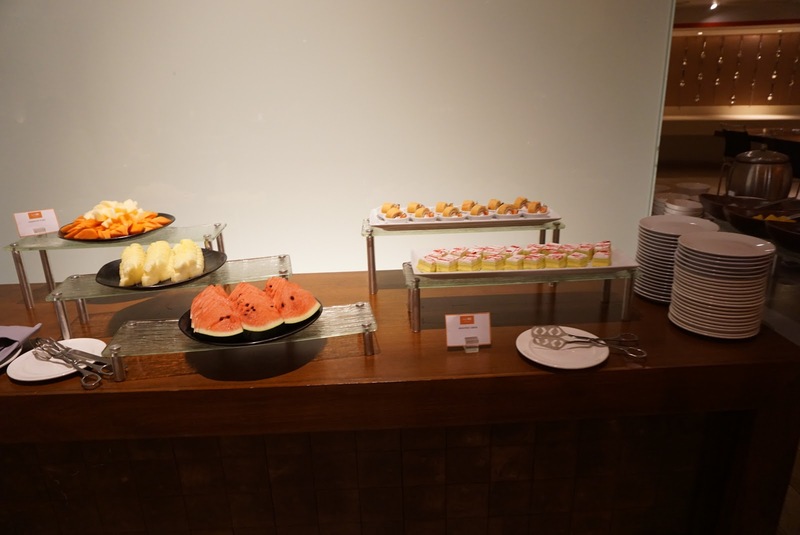 During one of the dinner service, Puchong showed us around on the food options for the buffet dinner. He recommended us to try out the barbecue ala minute and would help us take our order and brought the cooked food to us. Puchong even took the initiative to bring us some sauces which he had recommended us to try with which food. Indeed, the sauces did make the food taste better (not as though the food is not good enough). Puchong would always check on us and ensured that empty plates are cleared and our water is being topped up. There are still many unsung heroes, who either work in the background (such as the housekeepers) or whose name I did not manage to get. They made us feel welcomed in Dusit D2 Chiang Mai and portrayed the traits of Thais that the world has come to know of. 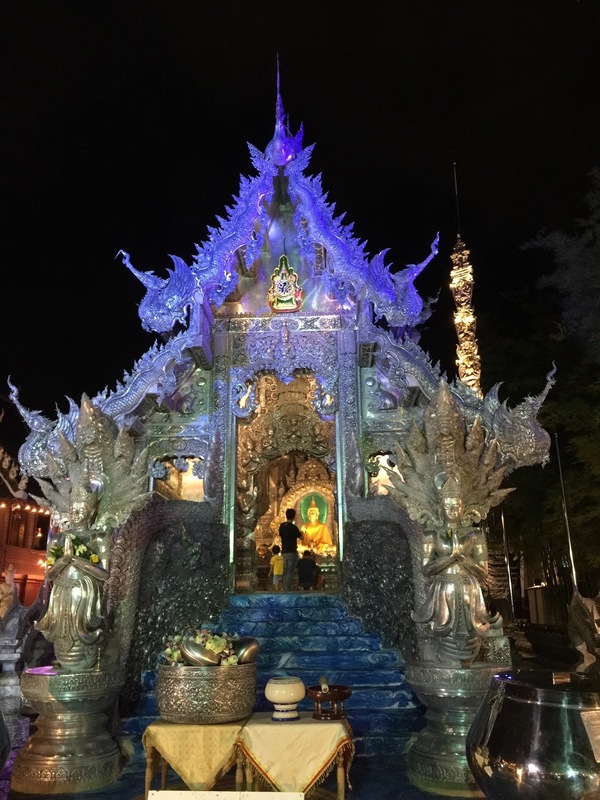 I have travelled to Thailand many times a year and this is the first time I experienced the warmness and hospitality of the Thai people in Thailand. I highly recommend one to come stay in Dusit D2 Chiang Mai should one visits this Northen Thailand City. The Studio Suite in the hotel is very spacious and comfortable. The design of the suite is functional and the infusion of Thai elements and contemporary decor makes the suite feel very cosy. 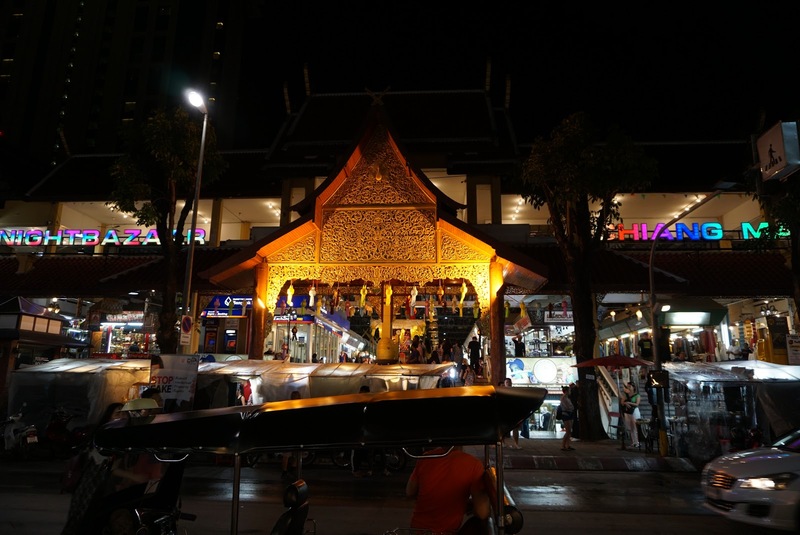 The location of Dusit D2 Chiang Mai is excellent to explore the daily night markets and the rest of Chiang Mai. 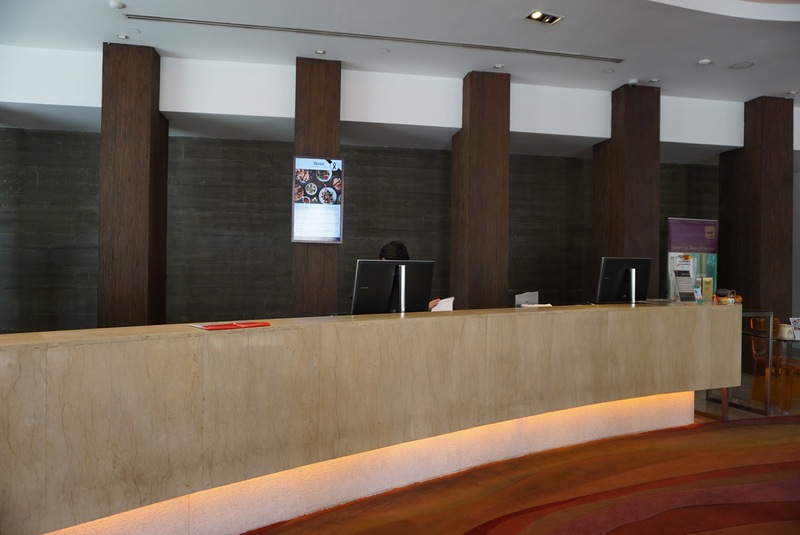 What left a good impression on us was the impeccable service. Every staff member truly embraced customer-centric and displayed the hospitality and the warmness that the Thais came to be known about. The staffs always saw with a smile and are very welcoming. I would come back to Dusit D2 Chiang Mai the next time I return to the city. SilkAir leaves from Singapore Changi Airport Terminal 2. 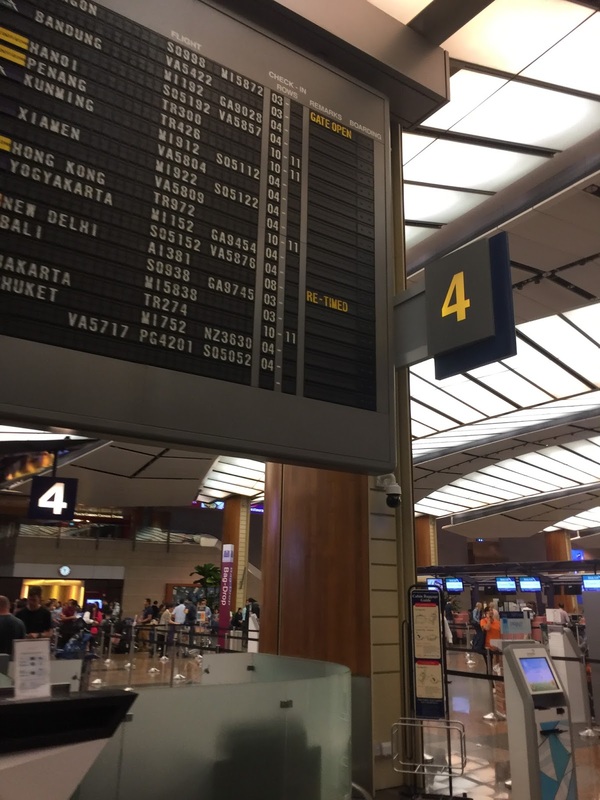 Check-in counters are located in rows 4 and 5 in the terminal. I always have the habit to check-in online via the Singapore Airlines App, which means shorter queues. 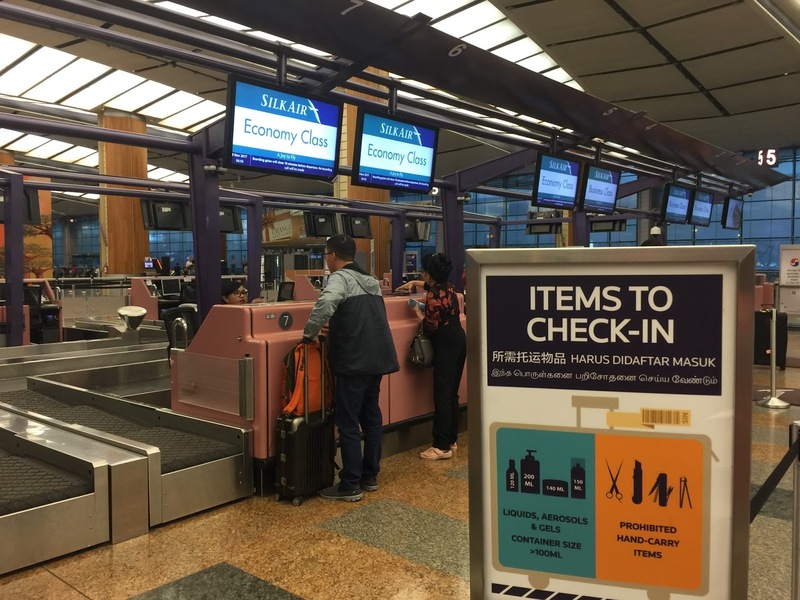 However, since SilkAir does not have a counter dedicated to internet check-ins at Changi Airport, we had to join the regular queue. The queue was short at the time we were there, hence we were promptly being served within moments after joining the queue. Check-in was swift and the ground staff took our luggage before handing us our boarding passes and reminded us of the boarding gate and the boarding timing. 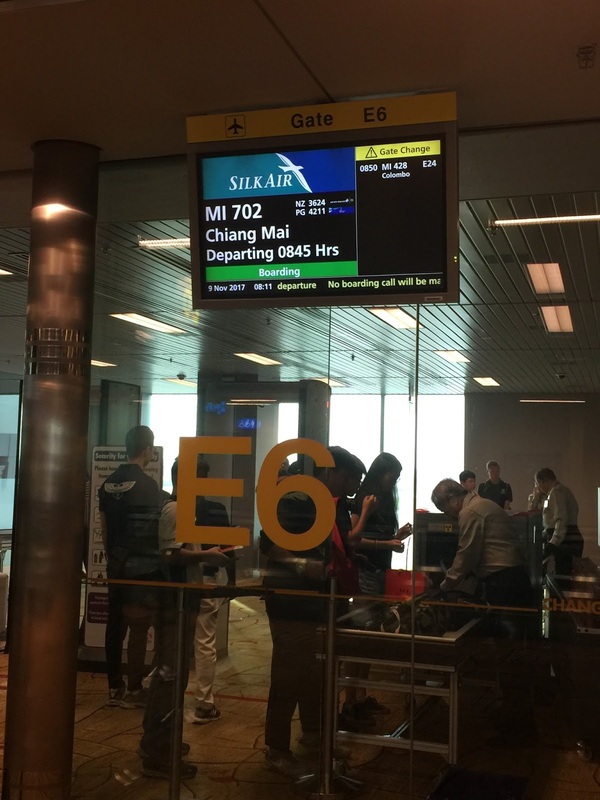 SilkAir leaves at boarding gate E6. 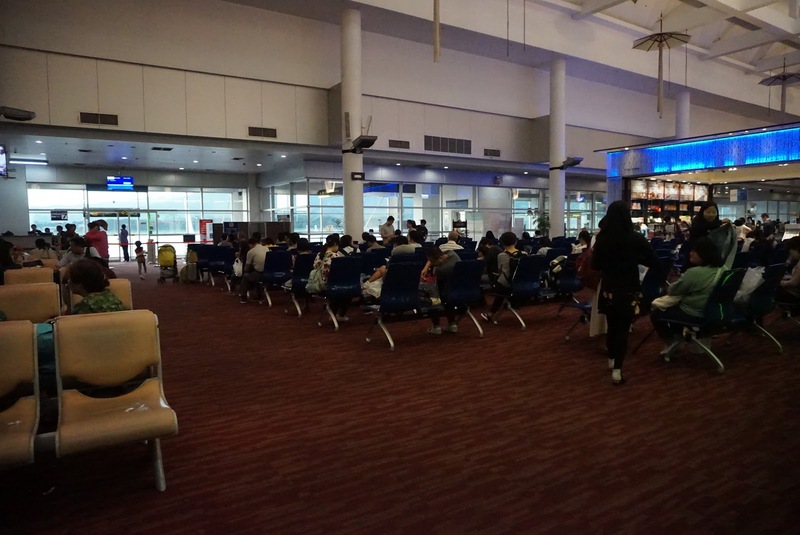 As it is operating at full load, the boarding gate is full of passengers waiting to board the aircraft. 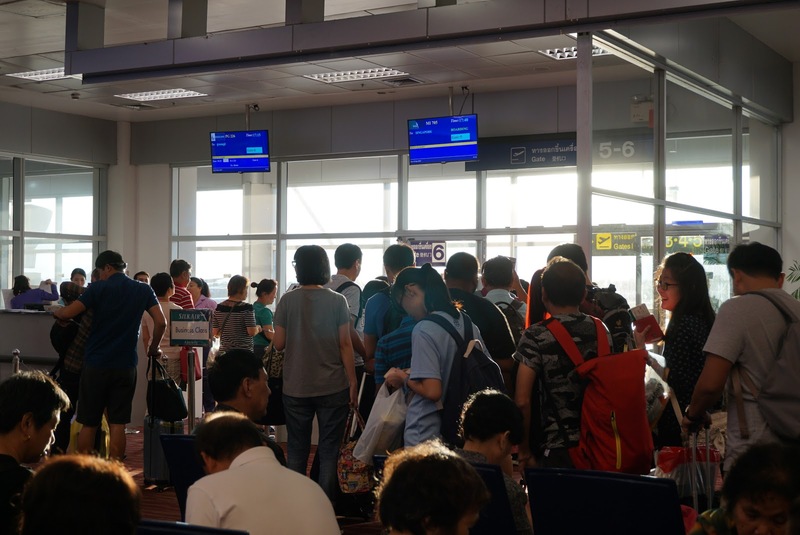 As we arrived at the boarding gate close to the boarding timing, most of the passengers were already waiting inside the gate, the queue for security screening at the gate is rather short. 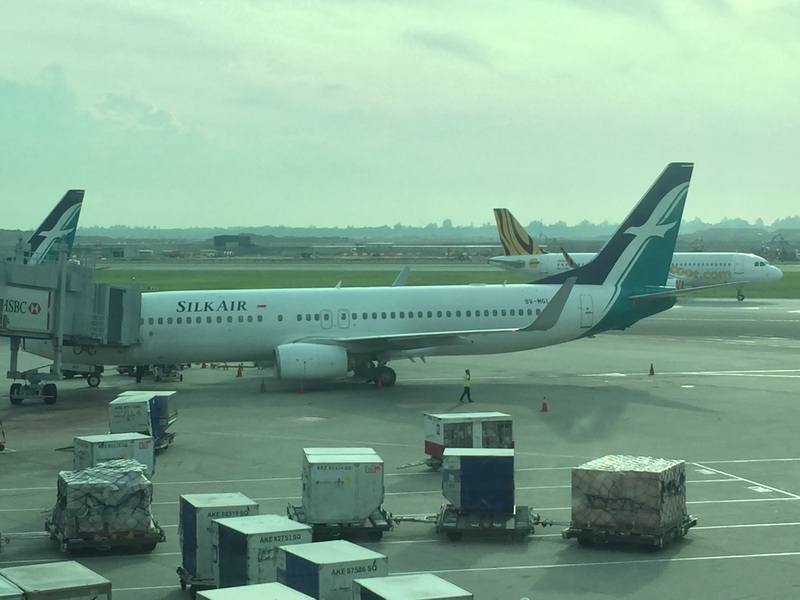 Despite operating on full loading (the aircraft is booked out), SilkAir was able to cope with the queue by boarding passengers according to rows. 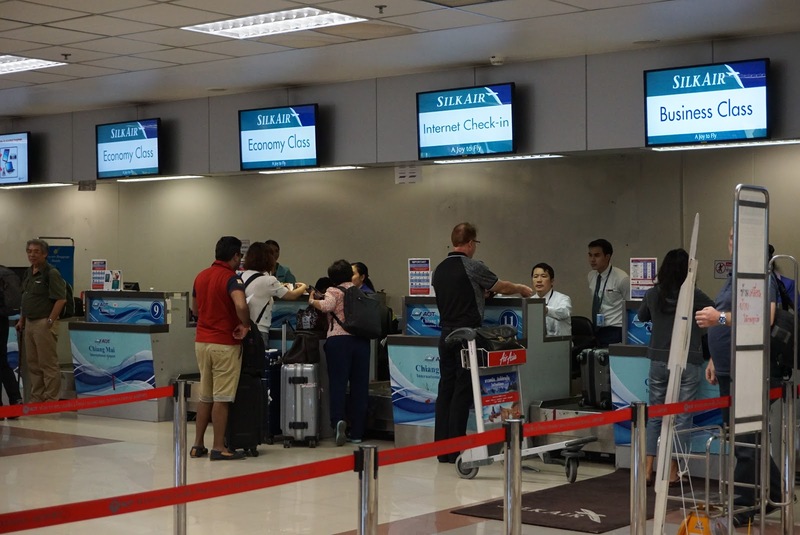 SilkAir check-in counters are located from counters 9 to 12, located in the centre of the international departure check-in hall. 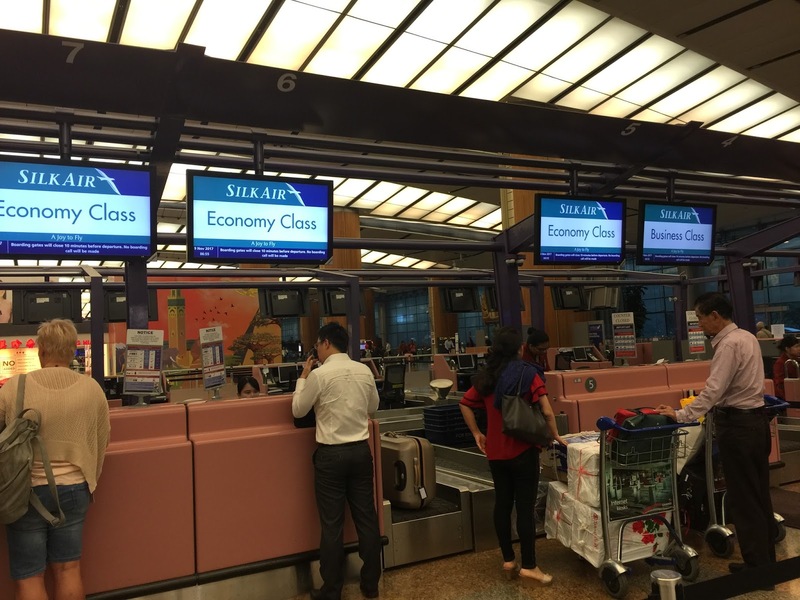 2 counters are dedicated to Economy Class passengers and 1 for Business Class passengers. 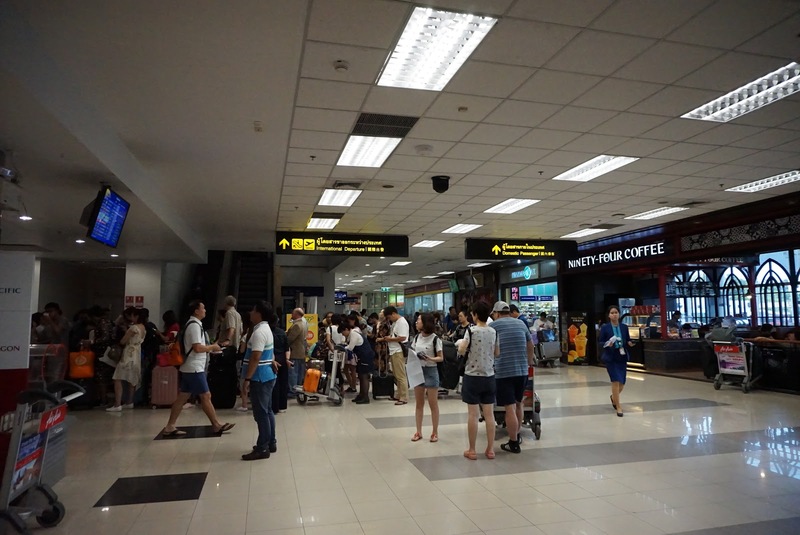 Unlike Singapore Changi Airport, 1 counter in Chiang Mai Airport is dedicated to passengers who do internet check-in. 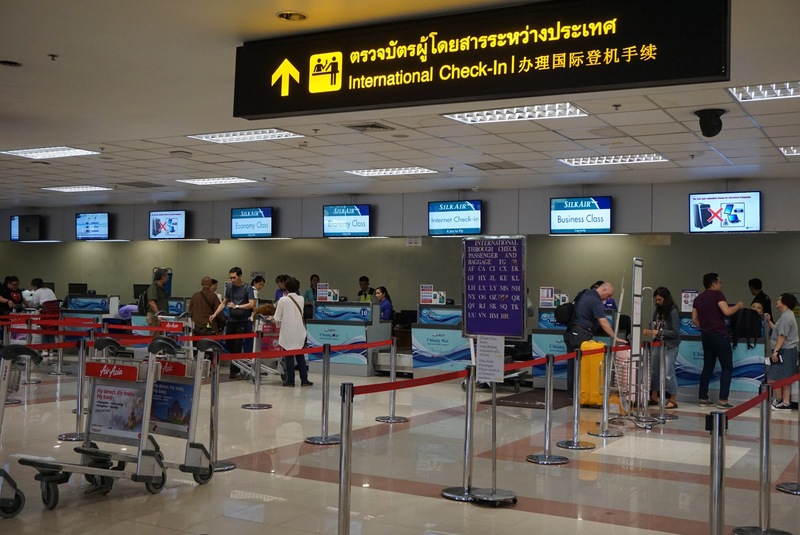 There are no queues in all 3 types of counters when I checked in at Chiang Mai International Airport. We were promptly served by a ground staff in the Economy Class queue. The agent took in our luggage and processed our check-in swiftly. She reminded us of the boarding gate and the time to appear at there before handing our boarding pass to us. 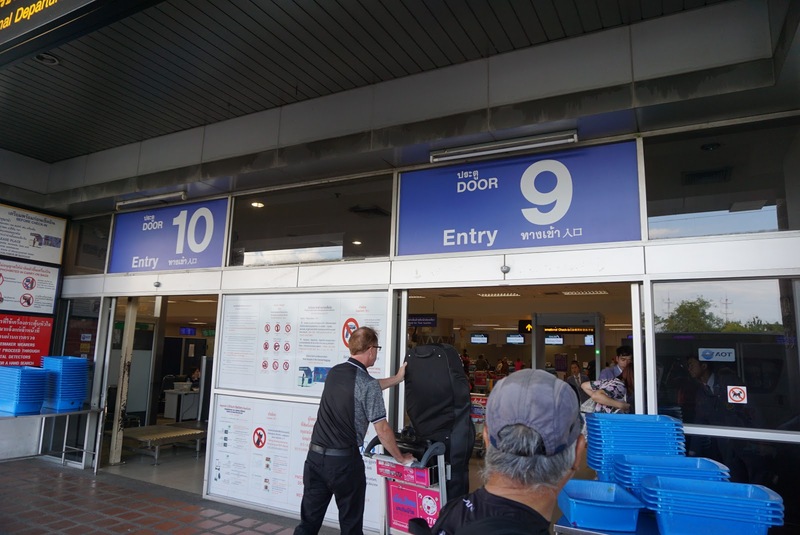 One point to note while flying out of Chiang Mai Airport, there are 2 security checks: one at the entrance to the terminal building, where all passengers are to put their luggage through an X-ray machine; another security check is located at the entrance to the airside area, before the immigration. Do note that due to the influx of tourists from China, the queue here can be rather long. 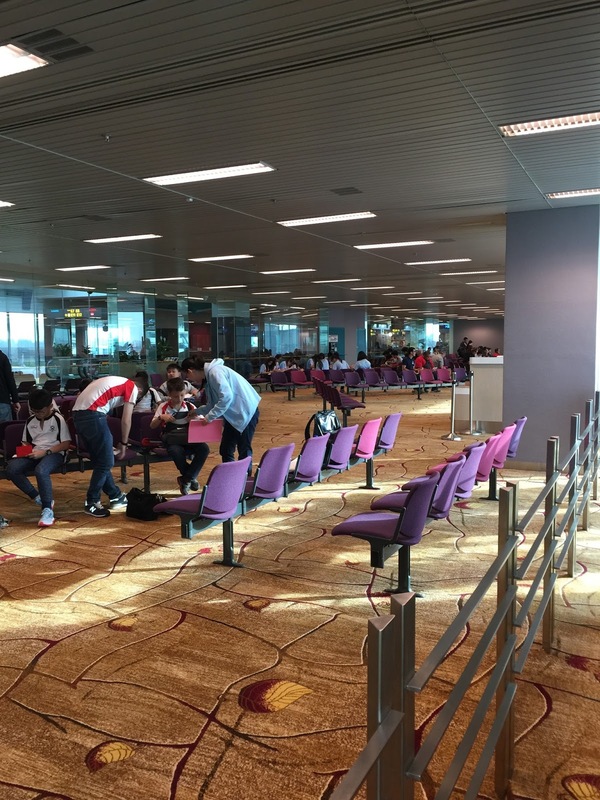 It is advised to arrive at the second security check area early in order not to miss one’s flight. 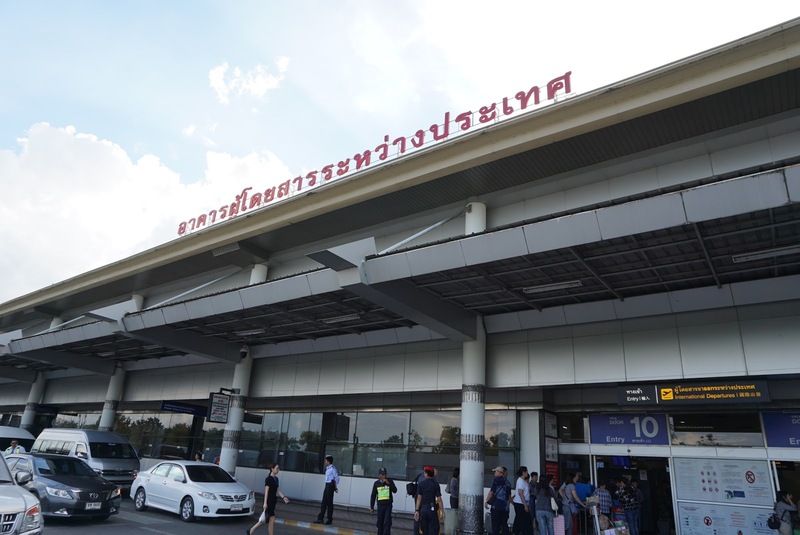 Once pass the immigration, the airside is a huge hall with shops located at the parameters of the terminal building. 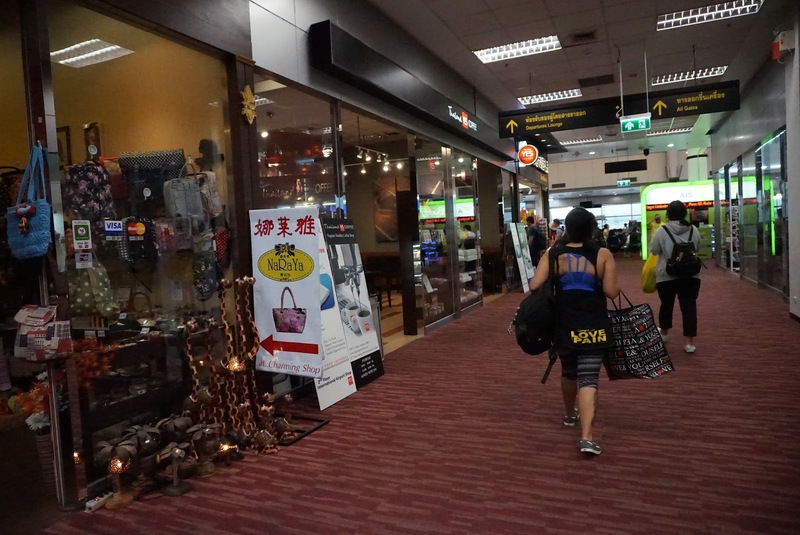 Other than the standard duty free shops selling liquors, tobacco and cosmetics, there are also several shops selling souvenirs for travelers who need to get some prior to their flight. 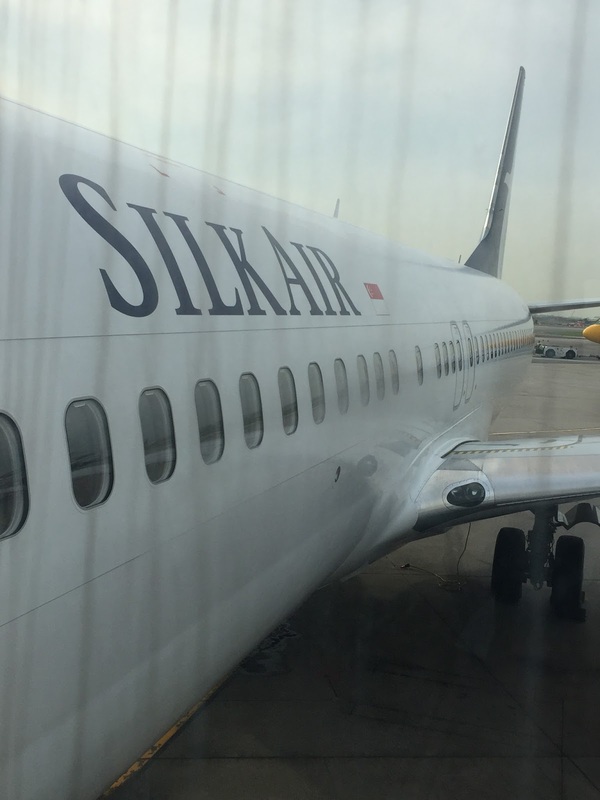 SilkAir uses the single-aisle B737-800 for the SIN-CNX route. There are 12 seats in Business Class Section and 150 seats in Economy Class Section. 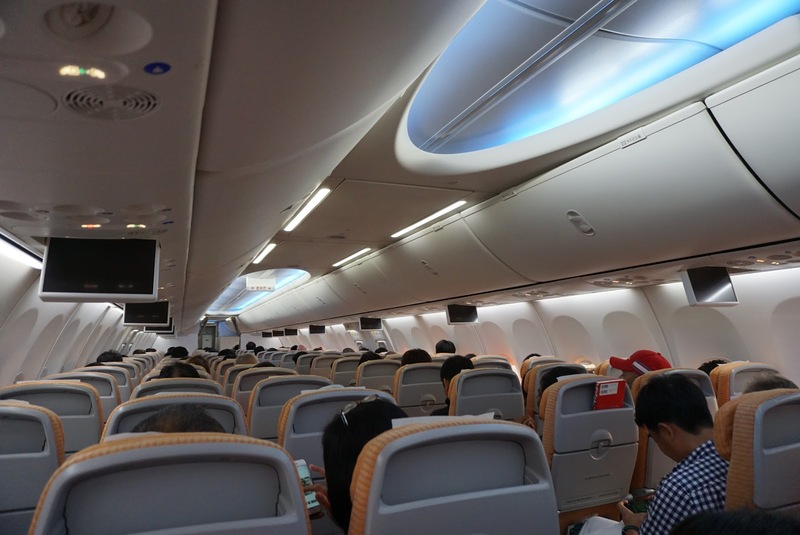 The Economy Class section is decked out with bright light orange seats, coupled with the bright mood lighting was used during boarding and the white bulkheads, the aircraft look spacious and clean. The use of these colours also exudes a sense of youthfulness and cheerfulness in the Economy Class Cabin. Economy Class cabin is arranged in 3-3 configuration. 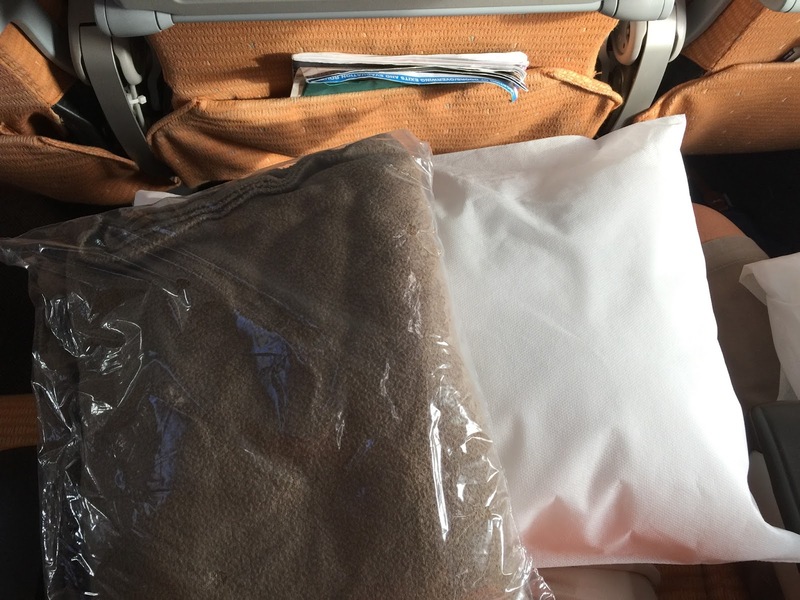 Blankets and pillows are not found in the seats of the Economy Class cabin, however, the flight attendants will gladly offer one set when requested. 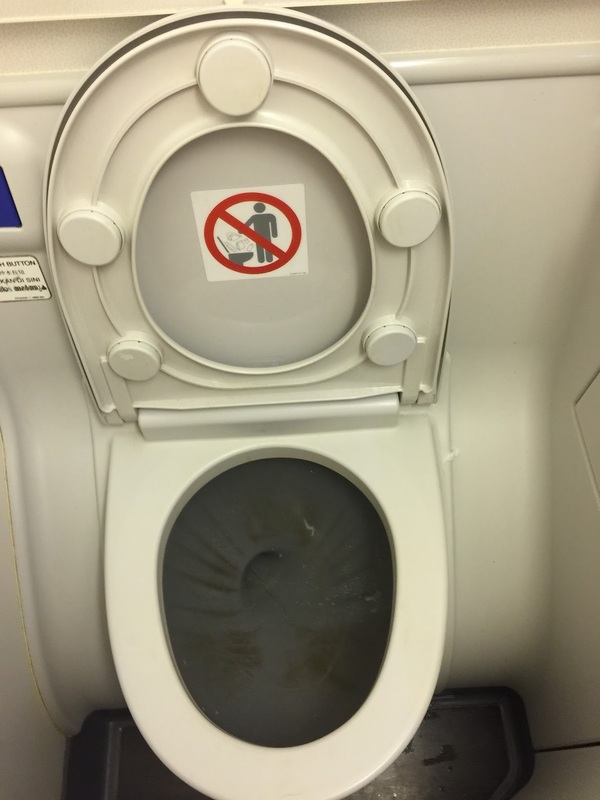 There are only 2 lavatories, located at the rear of the aircraft in the Economy Class section. 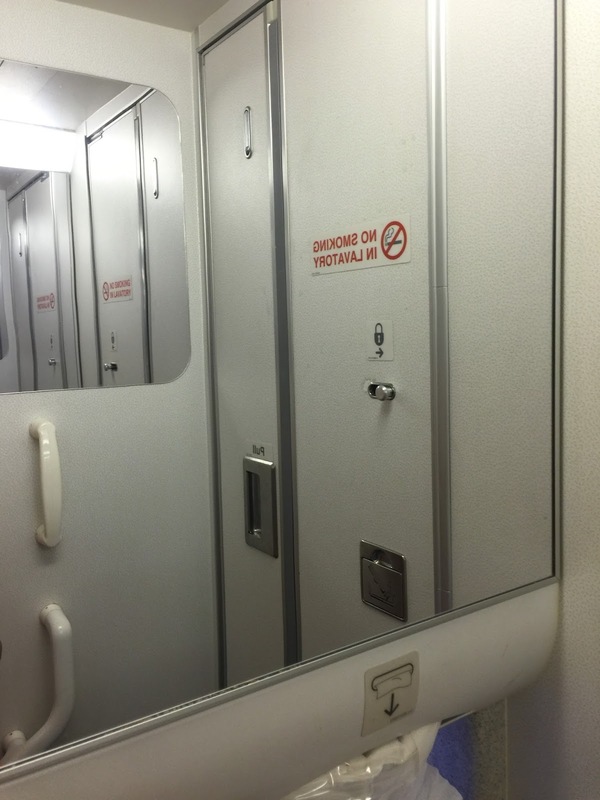 The lavatories are rather small, due to the limited real estate in the B737-800. 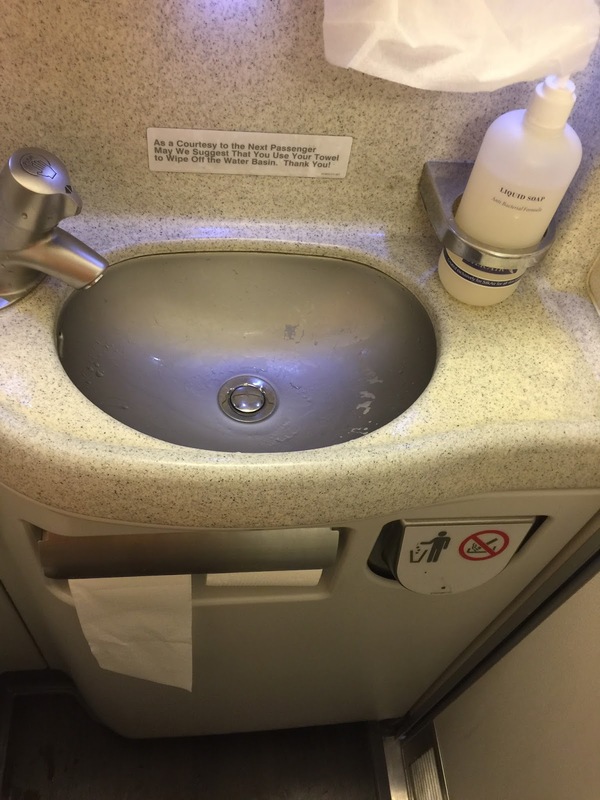 Despite the small size, the lavatory has all the standard equipment that one would find in a typical full-service airline. 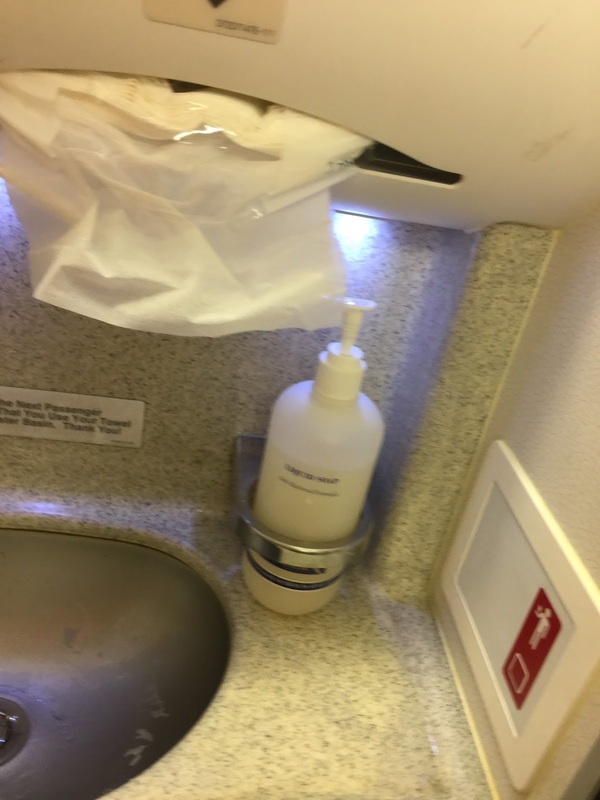 In terms of amenities, SilkAir only has a bottle of hand soap in the lavatory. 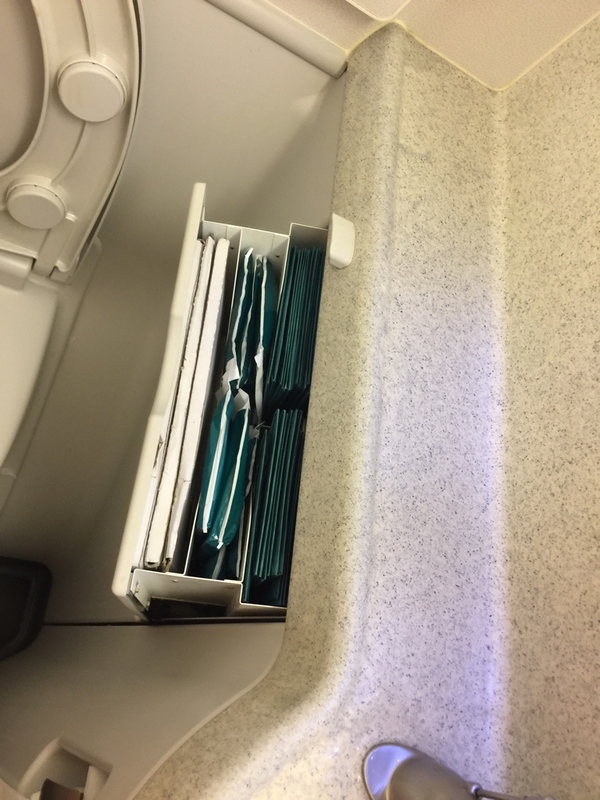 One can find some airsick bags in the drawers next to the toilet bowl. 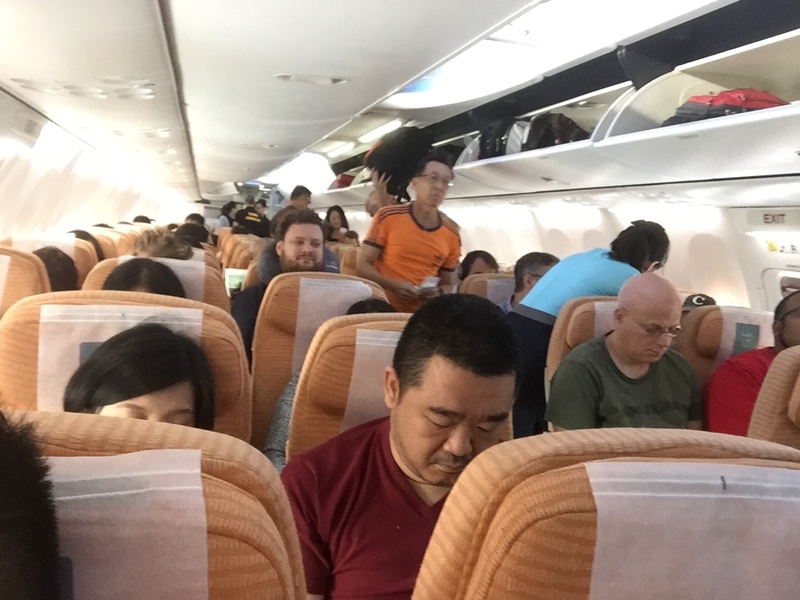 Each Economy Class seats have a pitch of 30″ and a width of 17″ and have 5″ of recline, which is sufficient for passengers to catch some rest during the flight. 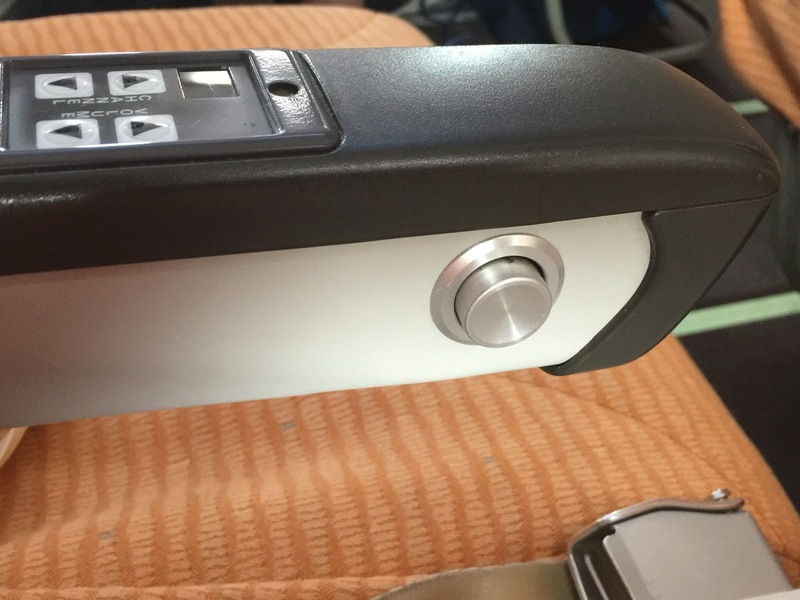 The headrest in each seat can be adjusted 4 ways to suit passengers of all height and provide them with comfort while flying. 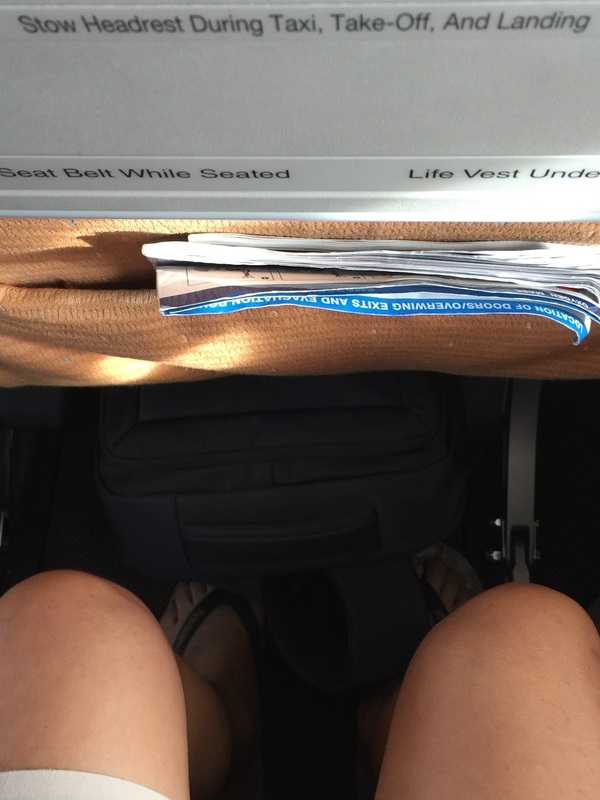 I find the legroom to be good in the Economy Class and not too cramp. 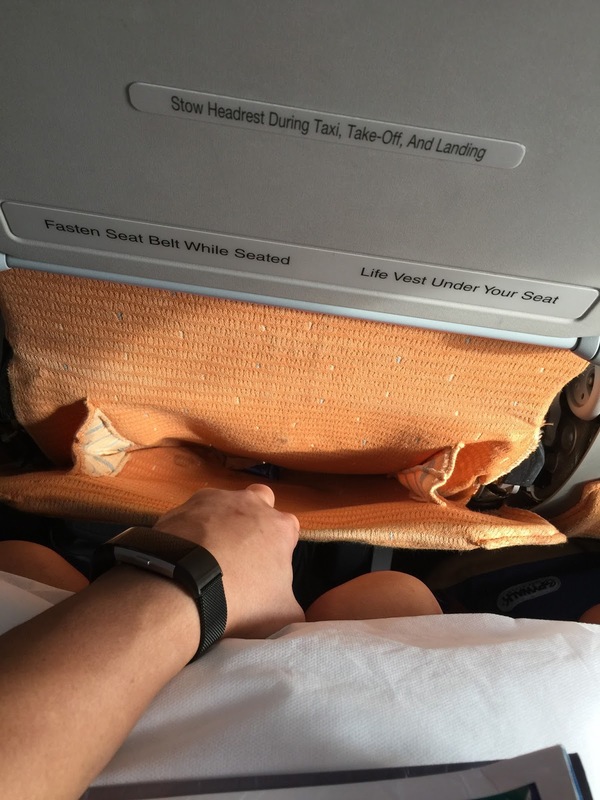 The seats feel comfortable throughout the short 3 hour SIN-CNX flight. There are a couple of seat pockets in each seat. 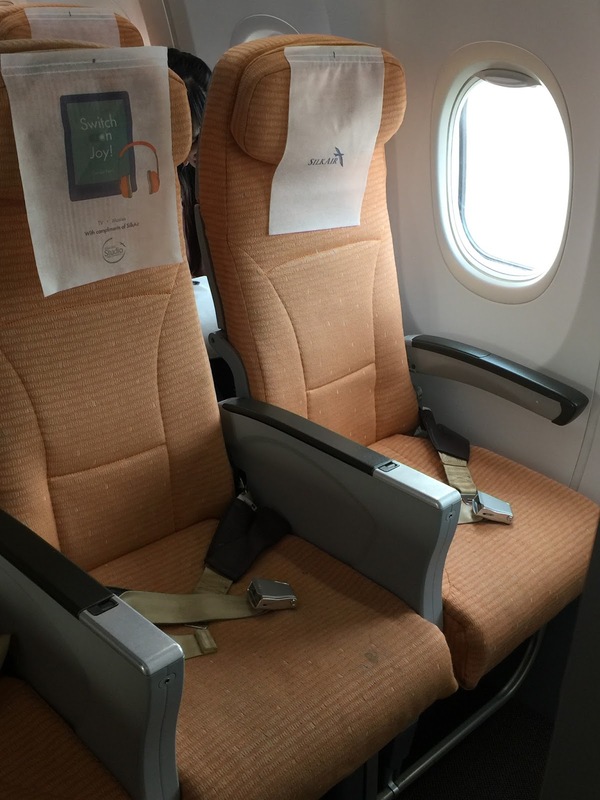 Like Economy Class onboard other airliners, one of the seat pocket is located on the back of the seat in front. 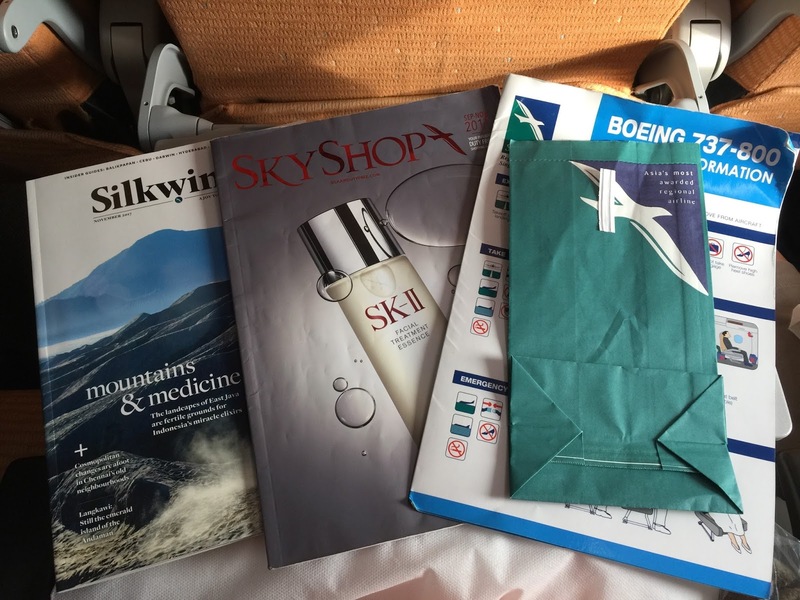 Here is where one can find some reading materials such as SilkAir’s in-flight magazine, in-flight duty free catalogue and the aircraft safety card. Airsick bag is also found tucked together with the reading materials. Another seat pocket is located on the top of the seat in front. molded in hard plastic. 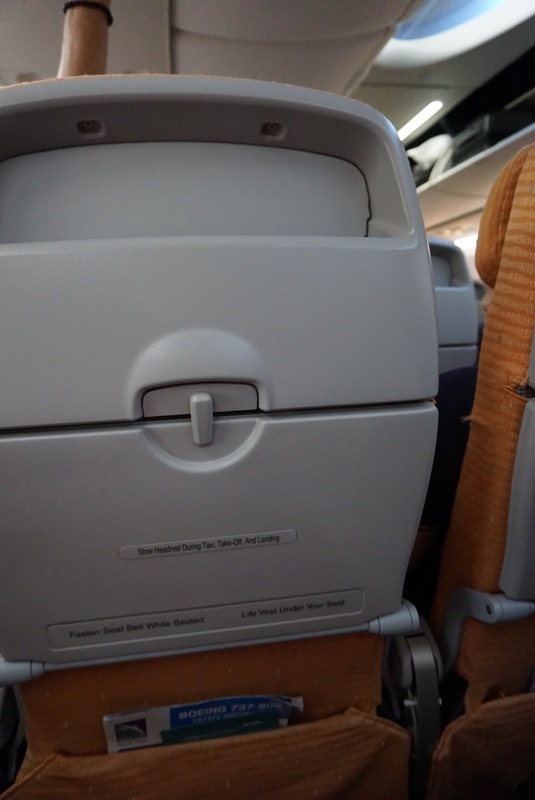 Unlike the bottom seat pocket where one can pull out to put stuff in, passengers is unable to do so for the top seat pocket. At first glance, it seem that each SilkAir Economy Class seat have rather generous storage spaces with the seat pockets. However I find the top seat pocket impractical, as its depth make retrieving small items stowed here difficult. 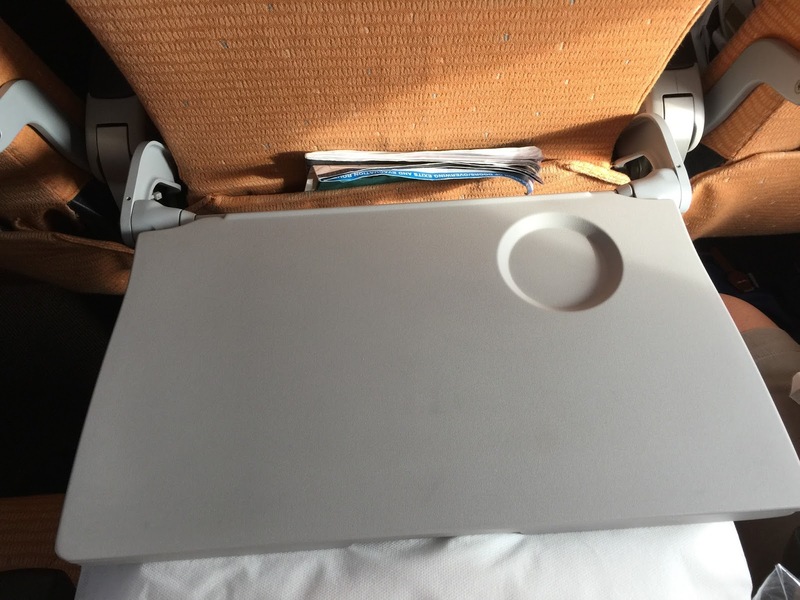 At the back of each seat is where one would find the tray table, which can be pulled towards passengers during meal time. 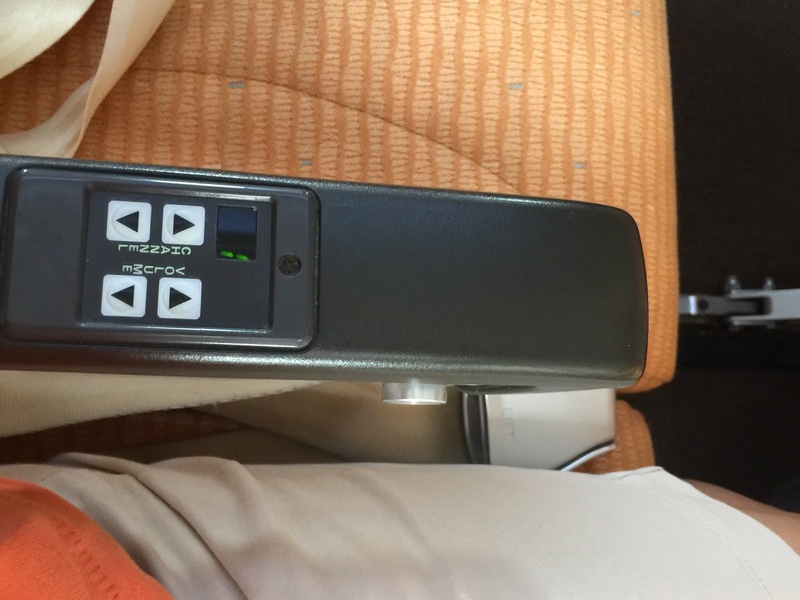 The seat recline button is located on the left arm rest of each seat. There are power socket and USB sockets are found below each seat for passengers to charge their mobile devices. 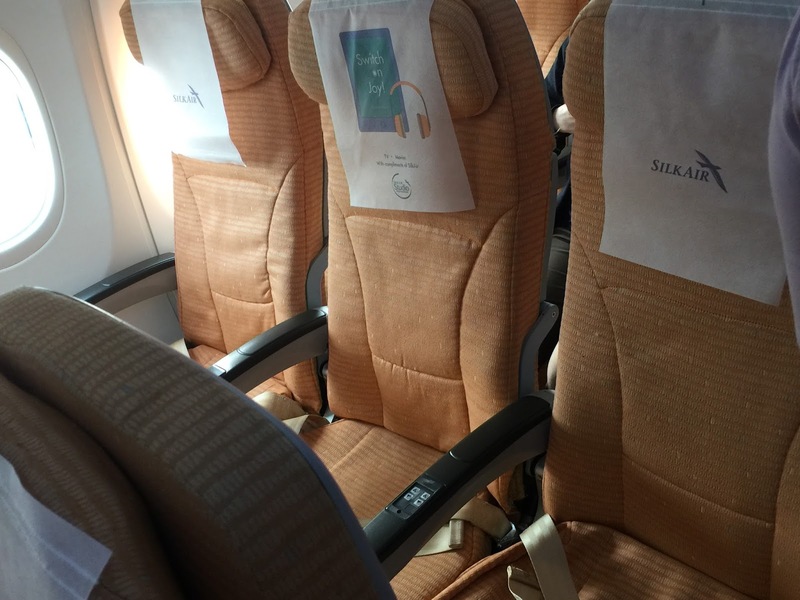 SilkAir does not have TV screens on each seat, however, that does not mean In-Flight Entertainment is not present. 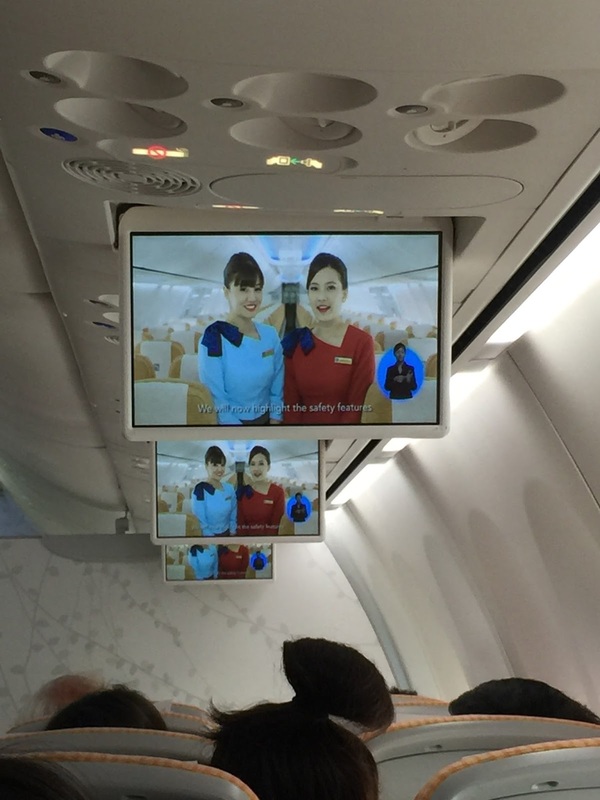 There are drop-down screens mounted on the ceiling of the aircraft playing short clips at a scheduled timing throughout the flight. The safety video is also shown from the drop-down screens while the aircraft is taxiing for take-off. 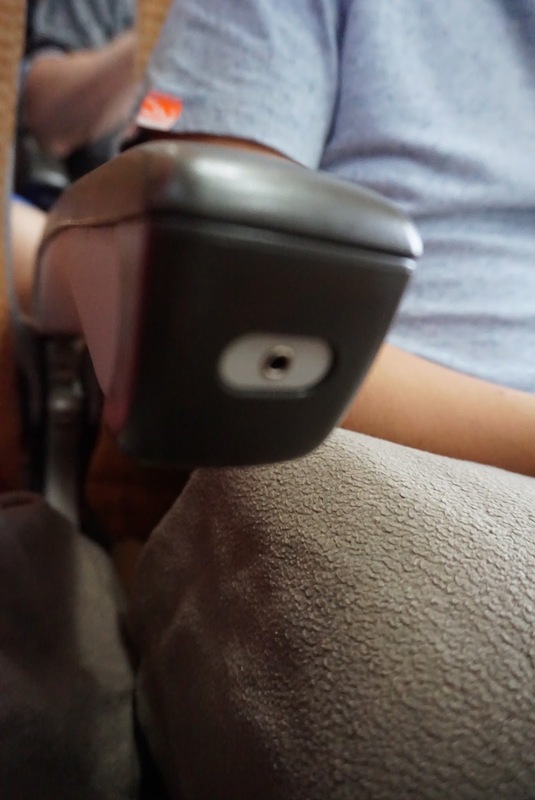 SilkAir does not provide headphones onboard, passengers would have to bring their own headphones, which can be plugged into the headphone jacks found on the armrest of the seat. 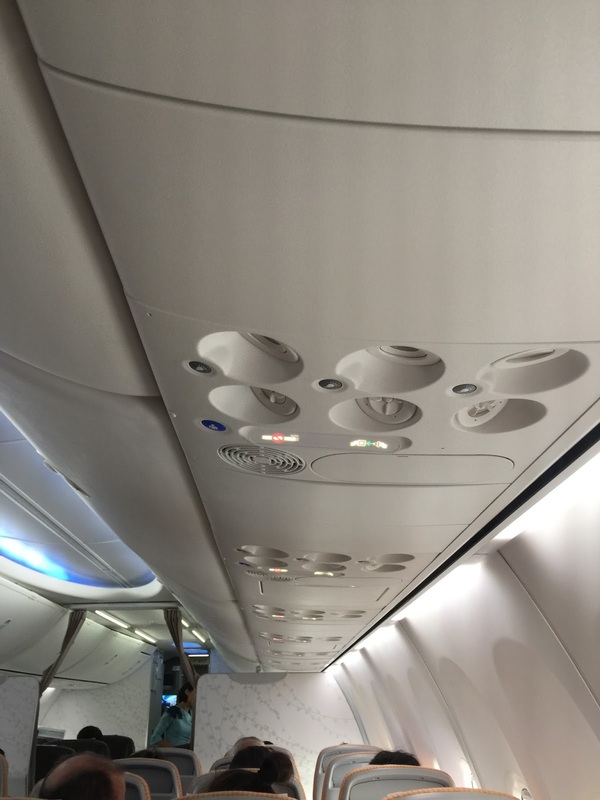 There is a small panel that displayed some channels and has a volume control, which seems to suggest that music is also streamed onboard when headphones are plugged in. 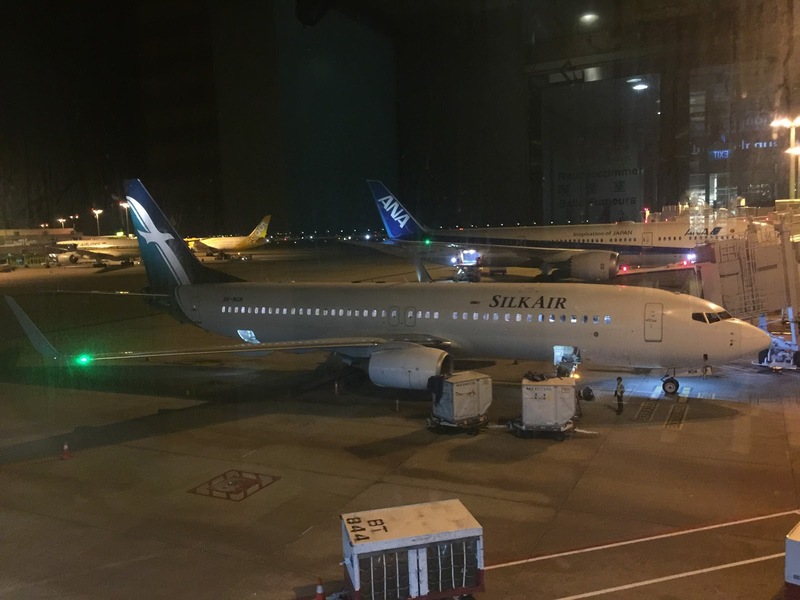 SilkAir also offers SilkAir Studio onboard this flight, which is a genius way of providing AVOD onboard without the airlines needing to invest in Personal TV screens on each seat. 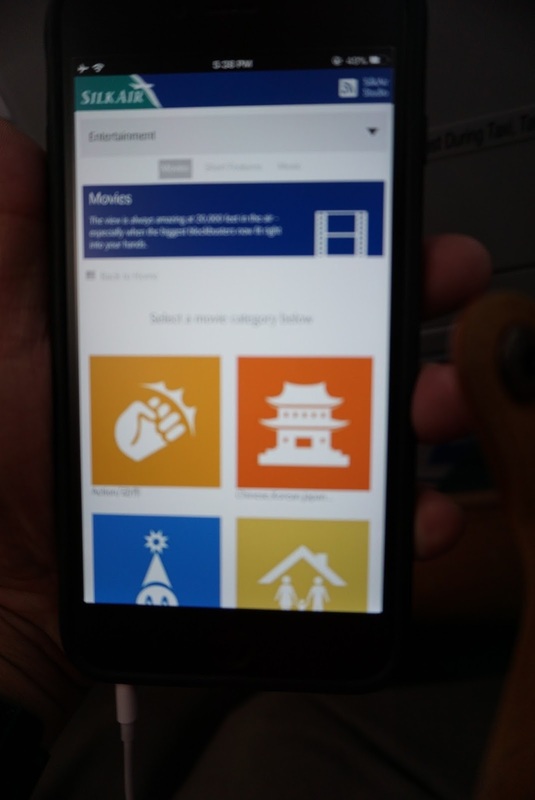 Passengers can download the SilkAir Studio app to their mobile phones, tablets or laptops to enjoy movies, TV shows and music onboard. 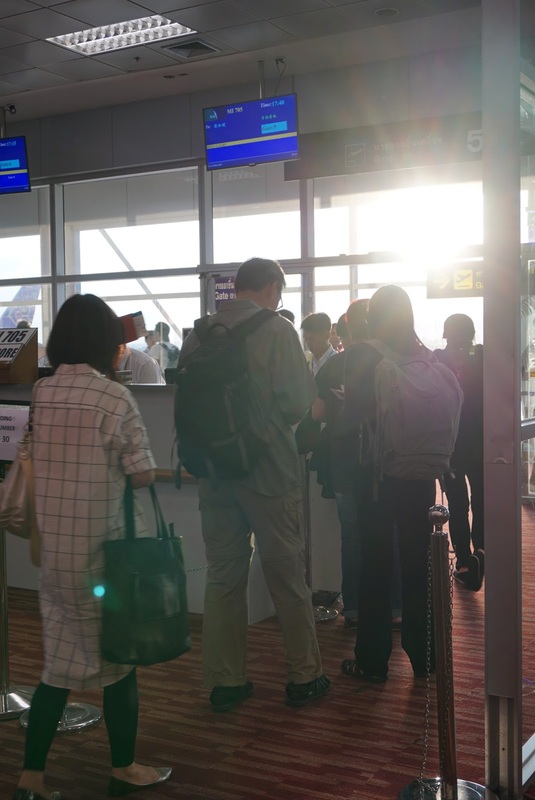 Passengers can connect to the in-flight wifi and start watching the latest movies from their mobile devices as soon as they are settled in their seat. 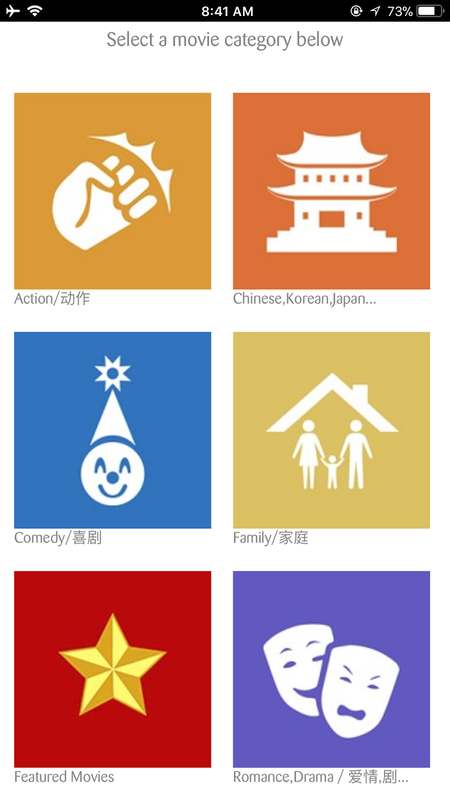 There are a lot of options, neatly organised in the app menu for passengers to choose a show of their liking. 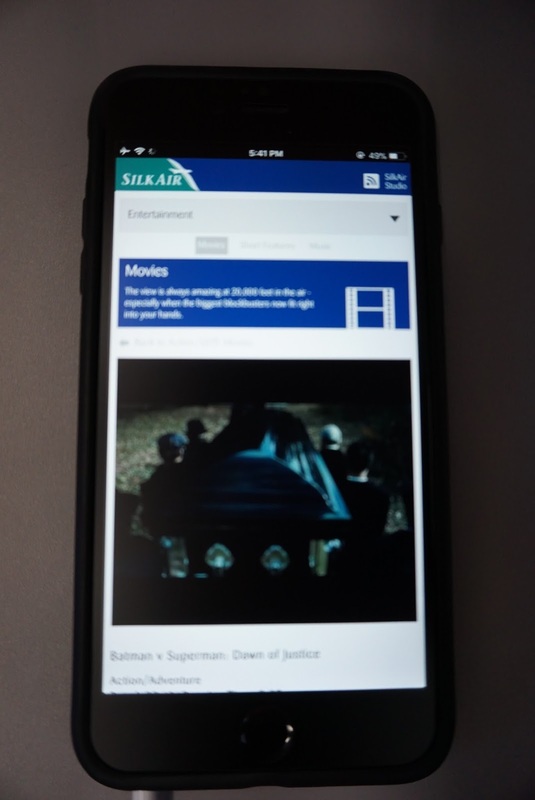 For passengers who did not download the app prior to boarding, one can also access the SilkAir Studio from their web browser on their mobile devices. 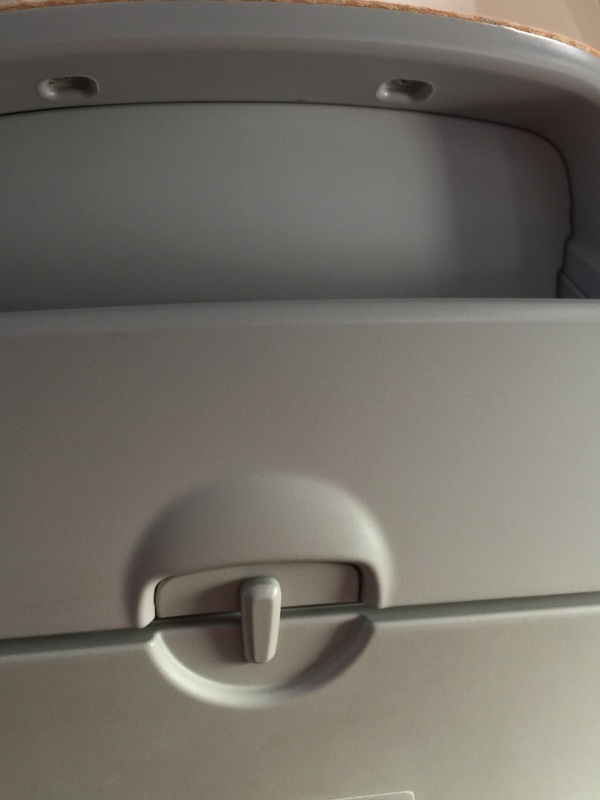 The only downside is there isn’t any latch for passengers to hook their mobile devices in the seat. 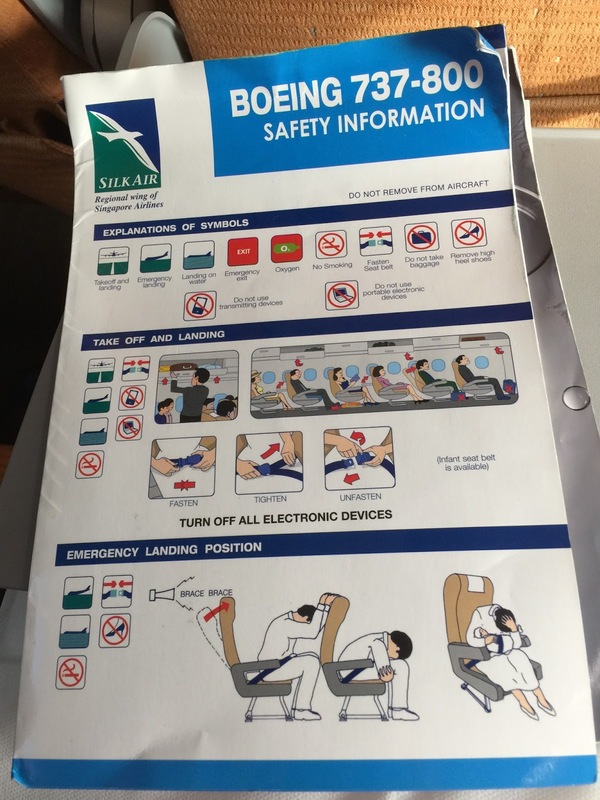 Understand that SilkAir is adding latches for passengers to place their mobile phones or tablets on in their latest B737 Max 8 aircrafts. 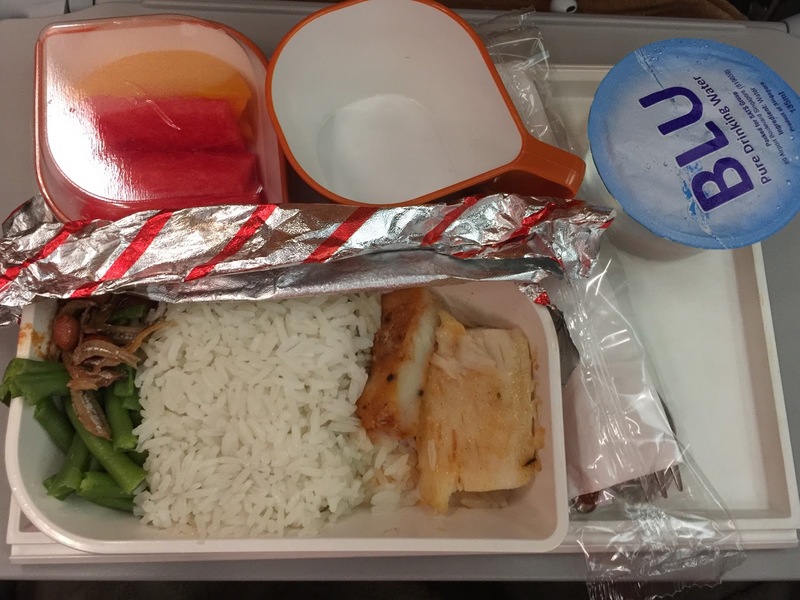 Meals onboard are served about 30 mins into the flight time. 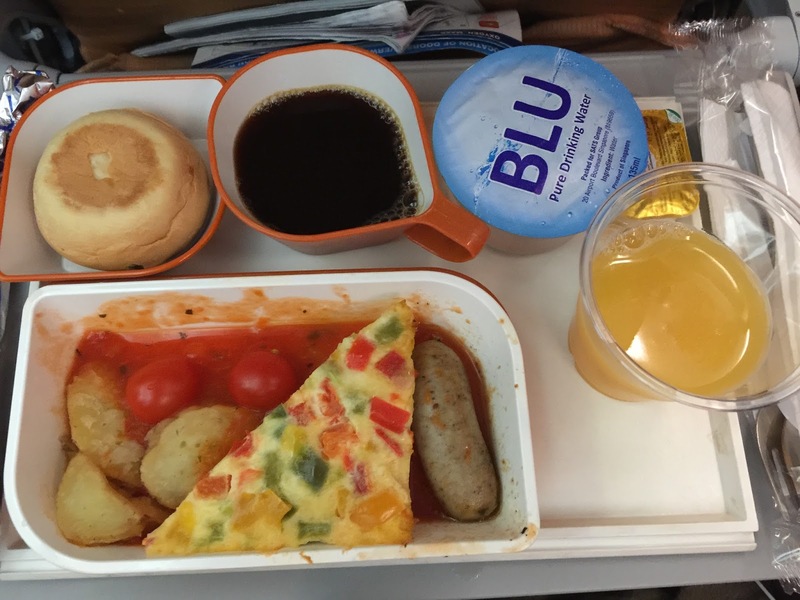 As this leg of the flight is flown in the morning, breakfast was served. 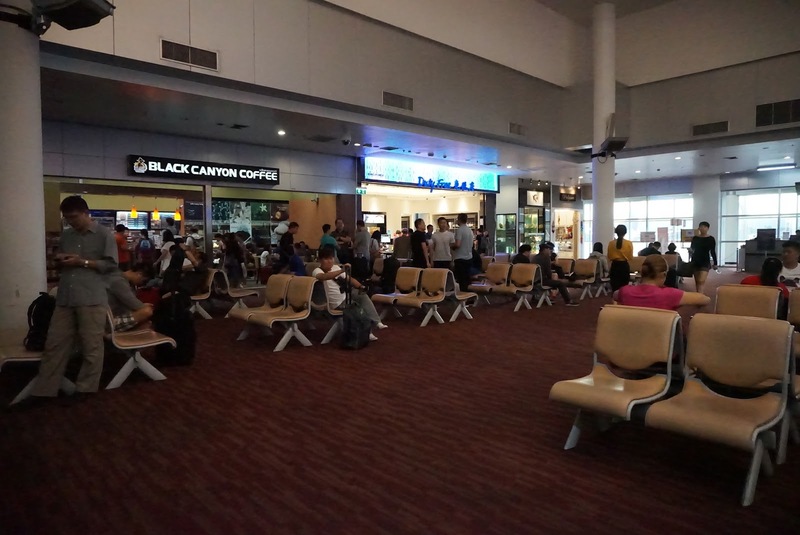 Passengers are given 2 options of either Chicken sausage with an omelette or Fish Nasi Lemak, complementary with soft drinks, juices, coffee or tea. When the service cart came to my row, only Chicken sausage was available. The meal comes standard with the main meal, bun and fruits. I find the Chicken sausage tasty, but the portion is a tad small. 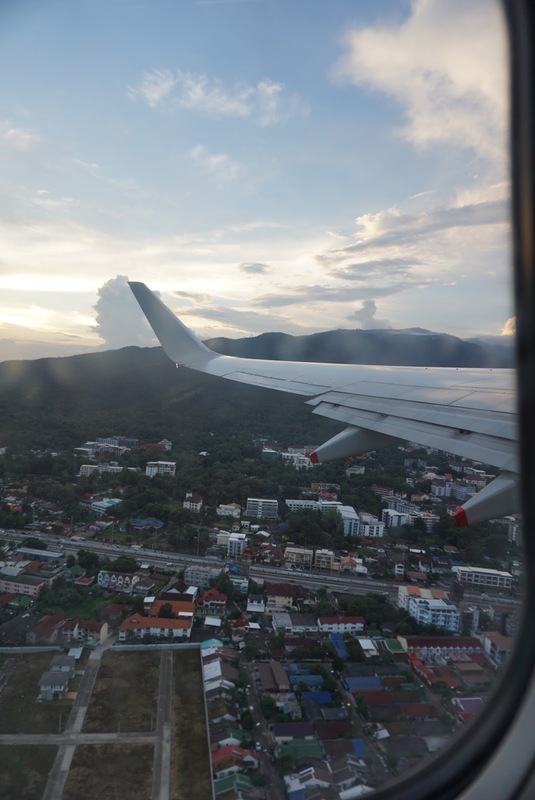 About 1 hour prior to landing, the flight attendants distributed packs of nuts and did another drink run to keep passengers hydrated. As with the previous leg, meals were served about 30 mins into the flight time. 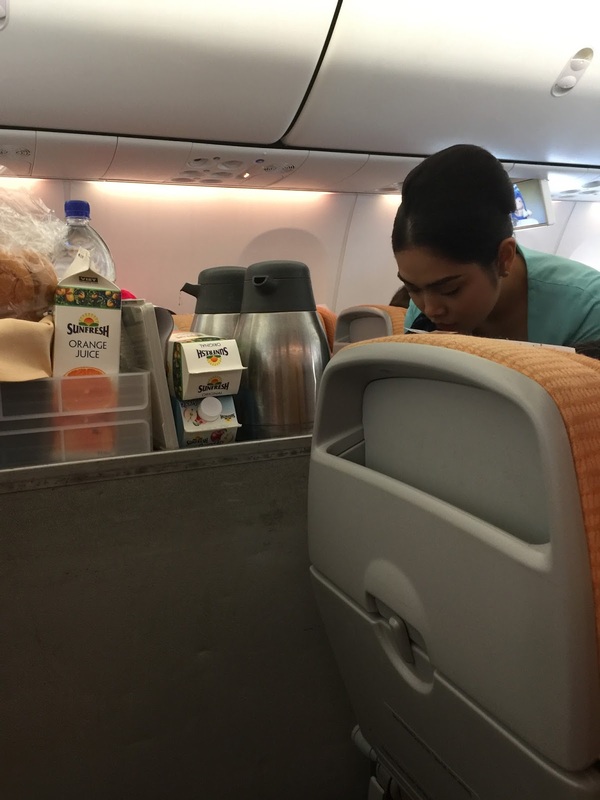 Passengers were given the options of a Chicken meal or a Fish Nasi Lemak meal. I was a tad disappointed to learn that I was only presented with 1 option by the time the attendant came to my row. This time around, the only food option available was the Fish Nasi Lemak. Unlike the breakfast service, the meal only came with a main meal and fruits as dessert. I find the Fish Nasi Lemak to be tasty and the chilli sauce that comes with it was delicious. Too bad the portion is a tad small. 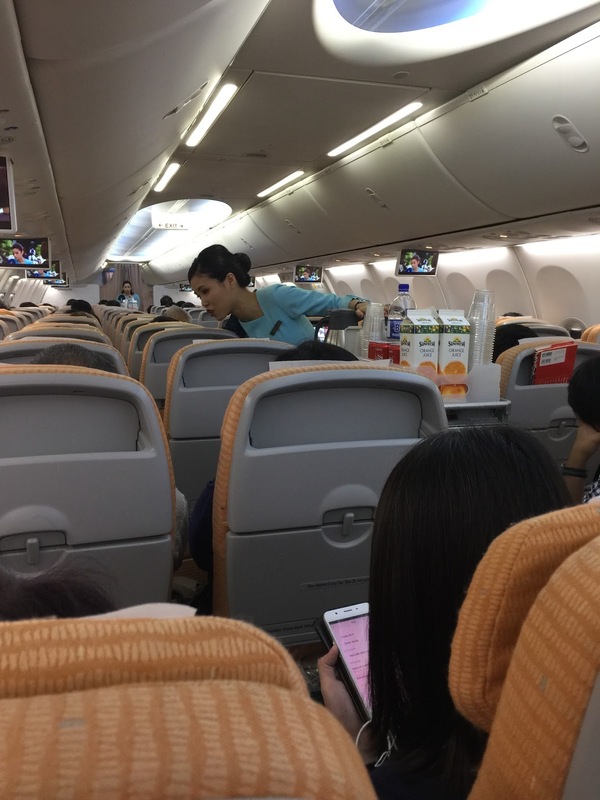 About 1 hour prior to landing, the flight attendants came around doing their drinks run and distributed a packet of nuts to all passengers. 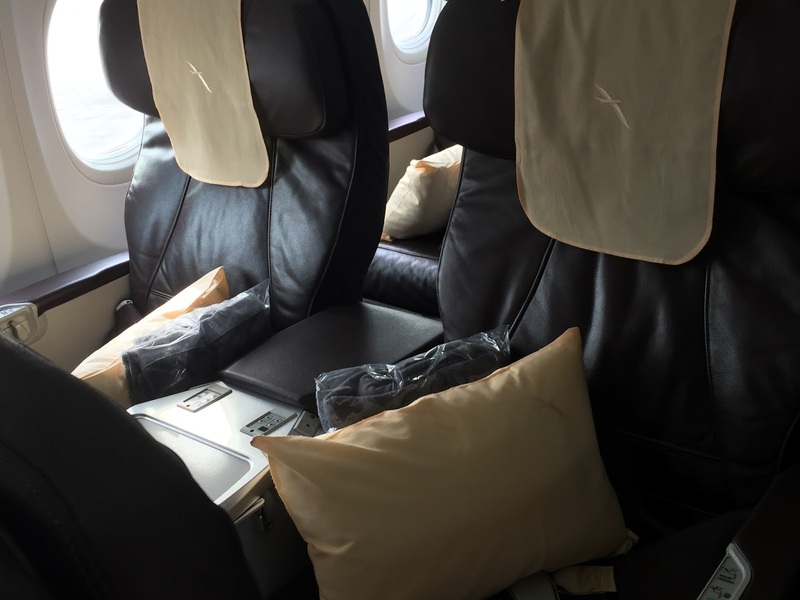 Service onboard was great, similar to what one would find on their sister airlines – Singapore Airlines. The flight attendants made passengers feel welcome the moment I stepped onboard. At the door, we were greeted with smiles and greetings. Flight attendants were cheerful throughout the flight, despite having to serve 150 passengers during the short flight time. 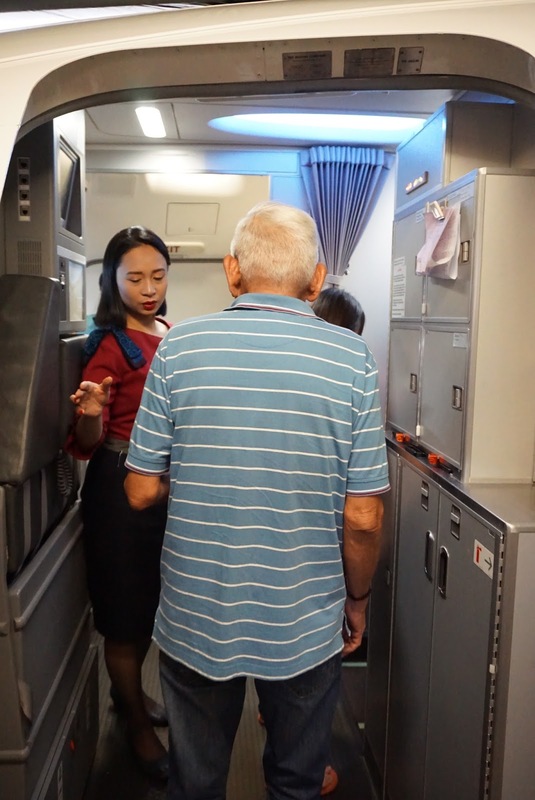 The flight attendants kept their cheerfulness throughout the flight and were very attentive to passenger calls. 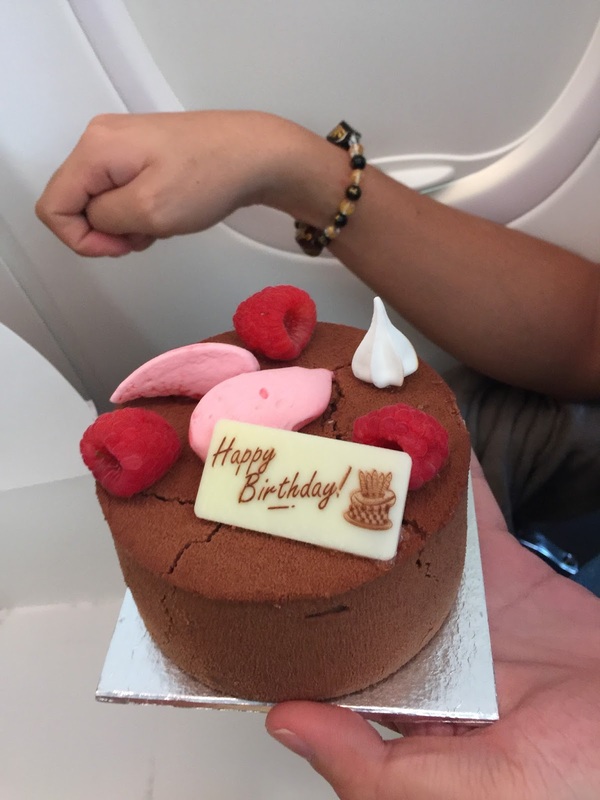 I requested a birthday cake for my friend in-flight and the flight attendants presented the cake with the widest smile after meal run and wished my friend a happy birthday. 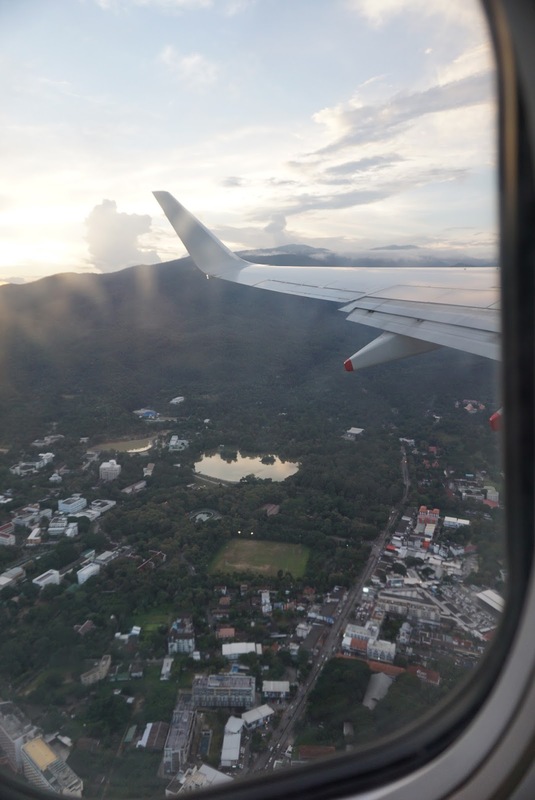 During the CNX-SIN flight, I complained to the flight attendant about only having 1 choice of food for the second time. 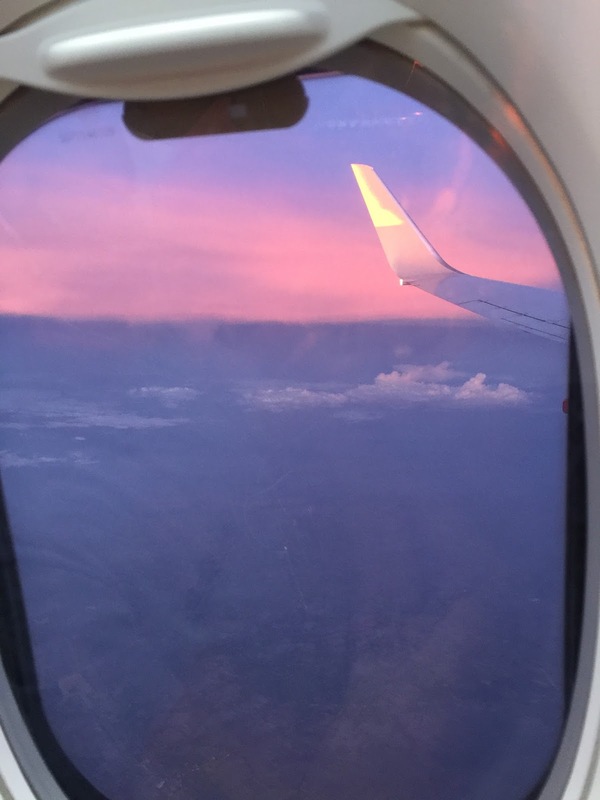 Instead of ignoring my complaints, the flight attendant apologised (though it is not a fault of theirs) and offered to bring food upfront, which I declined. The service recovery is almost immediate. When I requested a can of coke for my friend and myself, the flight attendant quickly returned with a can each and asked if we need more seeing that our drinks are empty. This goes to show that the flight attendants do their job with a certain level of attentiveness. I find the service rendered onboard SilkAir is no different and could be better than Singapore Airlines. 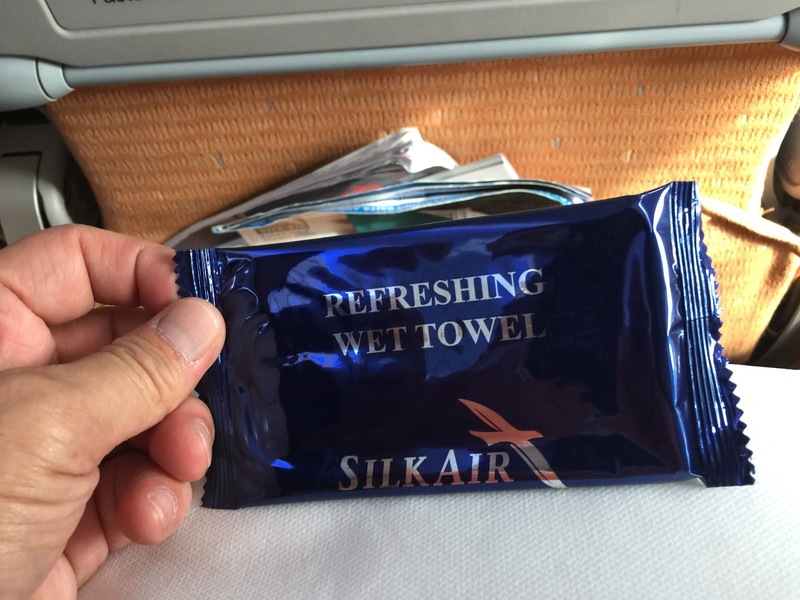 Flying onboard SilkAir is a joy. The seats are comfortable with decent legroom. The cabin looks cheerful and energetic. 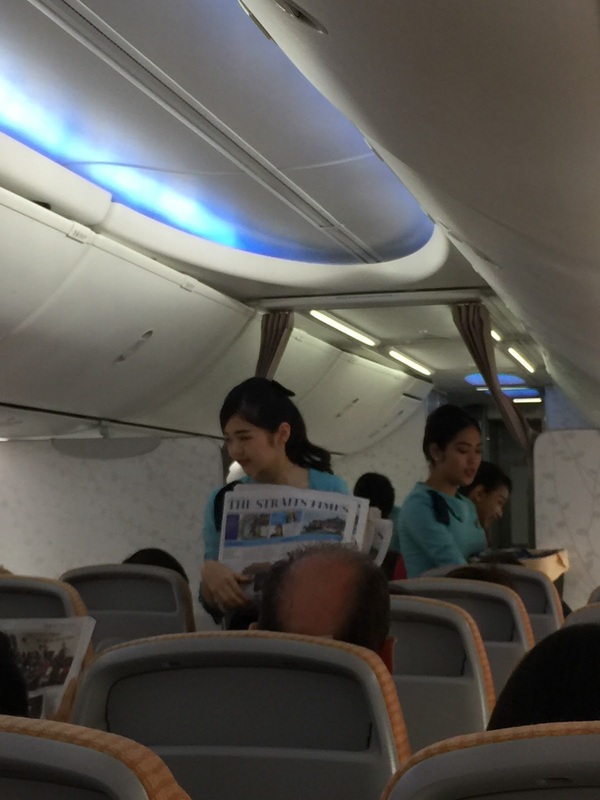 SilkAir Studio kept passengers entertained and made flight time feel shorter than it actually is. The service rendered onboard is great. Despite having to work in a small space with so many passengers, the flight attendants did their job with a smile. 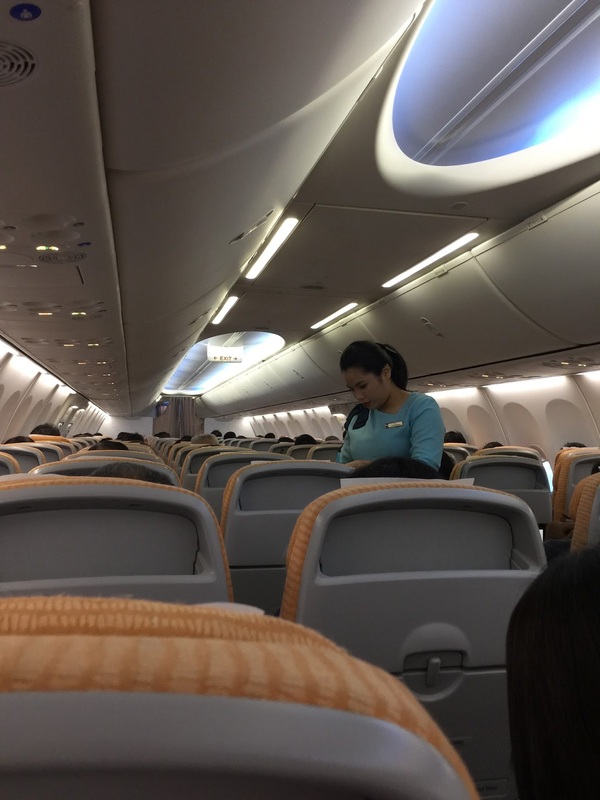 My experience onboard SilkAir lived up to their brand promise, it is indeed a joy to fly with SilkAir.